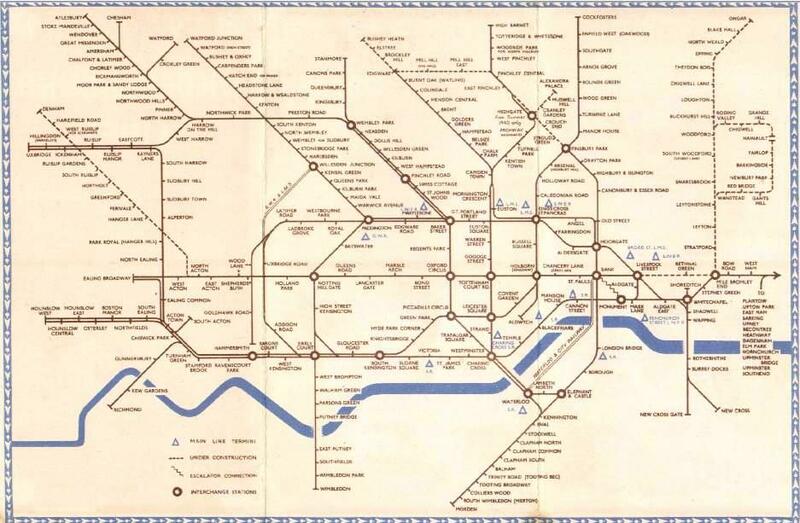 Shortly after the Thames Tunnel was opened, The English Parliament authorized the construction of the world’s first underground railway. 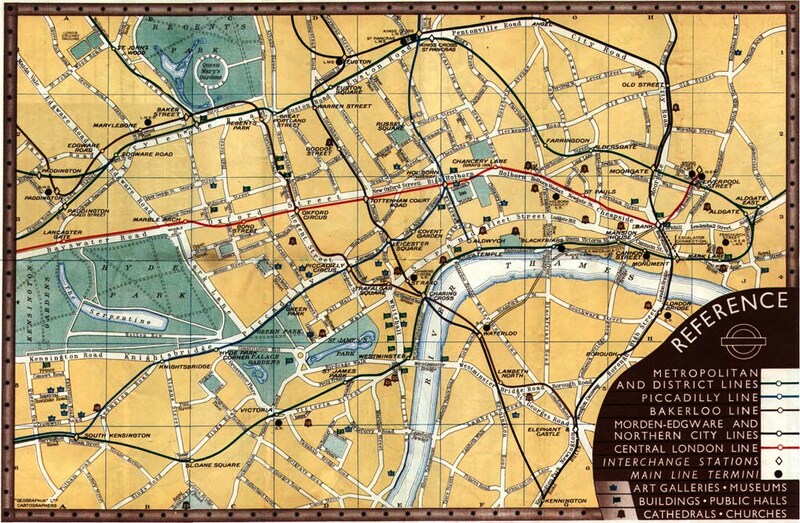 In January of 1863, this railway began running in London. 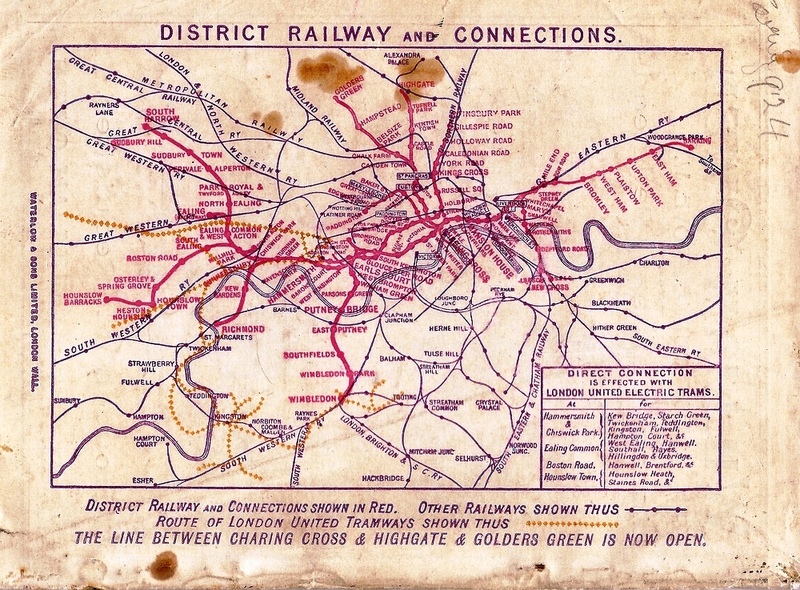 Powered by steam, these first trains helped revolutionize the way London citizens arranged and lived their personal and business lives. 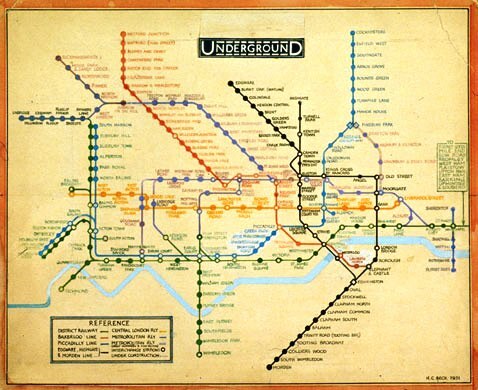 The London Underground ( better known as “The Tube” ) Map is perhaps one of the most interesting and important pieces of graphical design which borders on art in the last century. 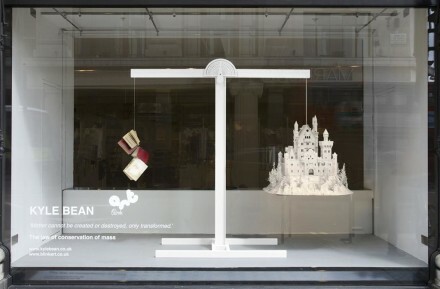 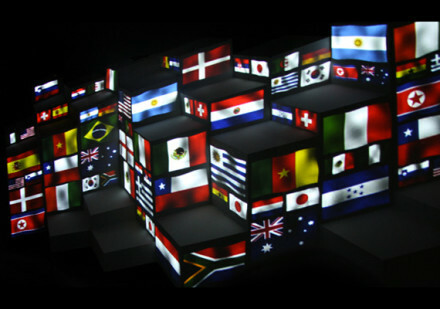 It is instantly recognisable and copied across the world. 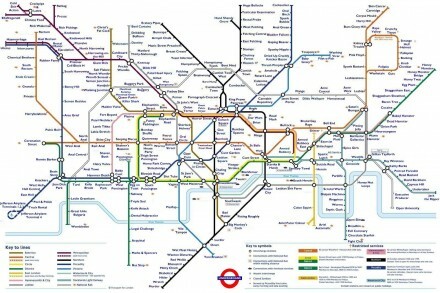 It also made travelling around London a much easier and simpler task. 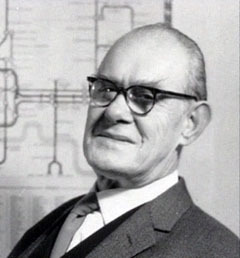 There was a period, between the wars, when European refugees like Walter Gropius stopped in Britain. 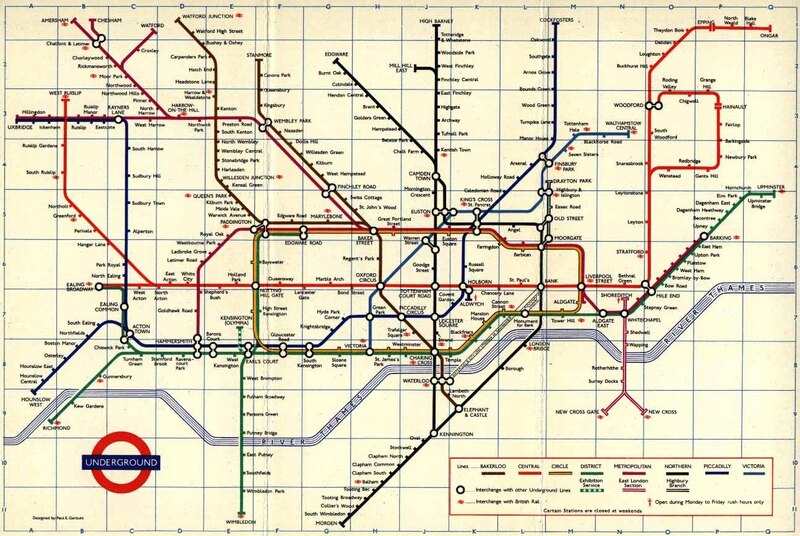 This stimulated a brief flourishing of modernism resulting in the design aesthetic of London public transport, from the Double Decker red Route Master Bus (the only piece of British ‘architecture’ that Corbusier liked) to the modern Underground Tube stations. 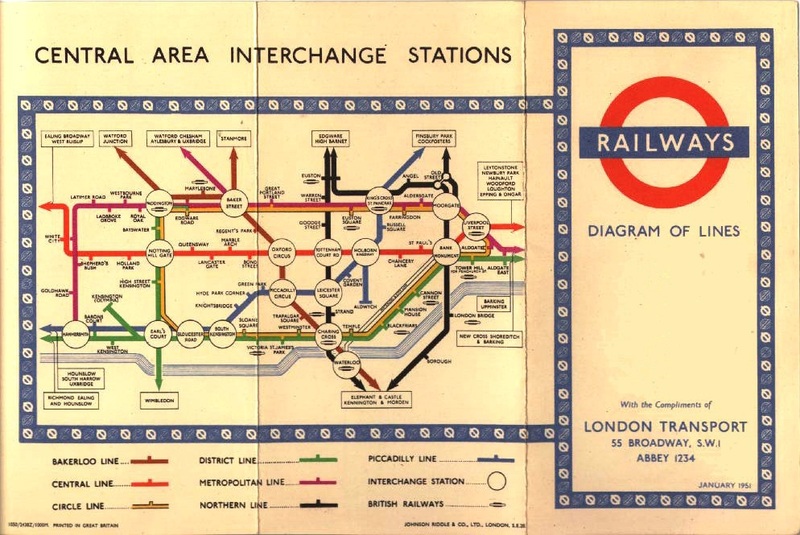 The pinnacle of London Transport’s modernist design was the Tube map, which rearranged distances to produce a supremely navigable schematic diagram that is little changed today. 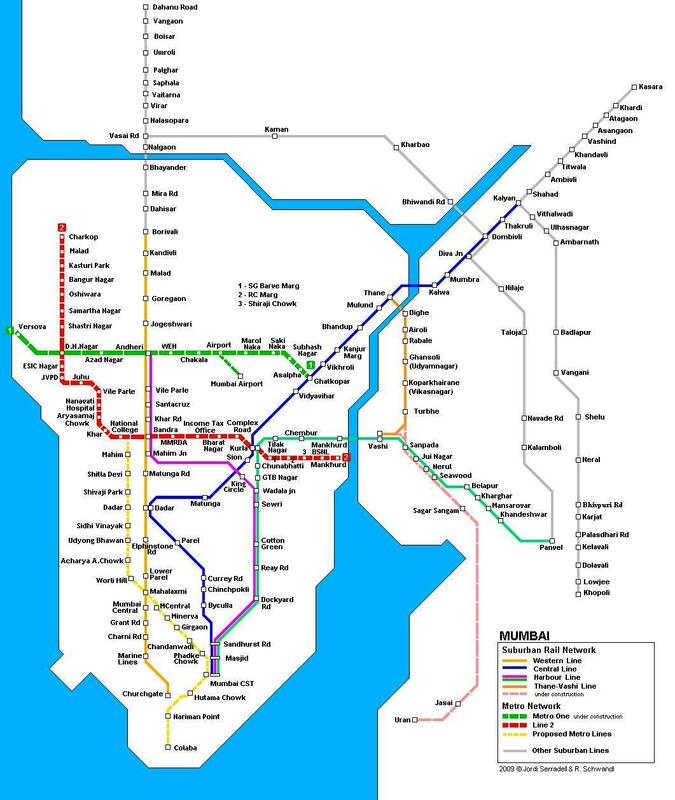 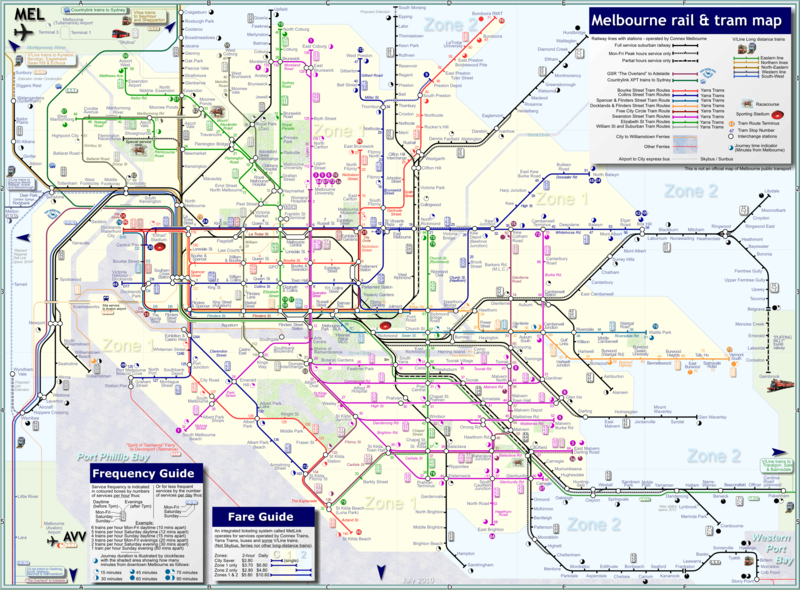 Although not technically a Map, because it ignores geographical and map making rules such as correct scale and distance between stations, it was deliberately compromised to make the map easier to use. 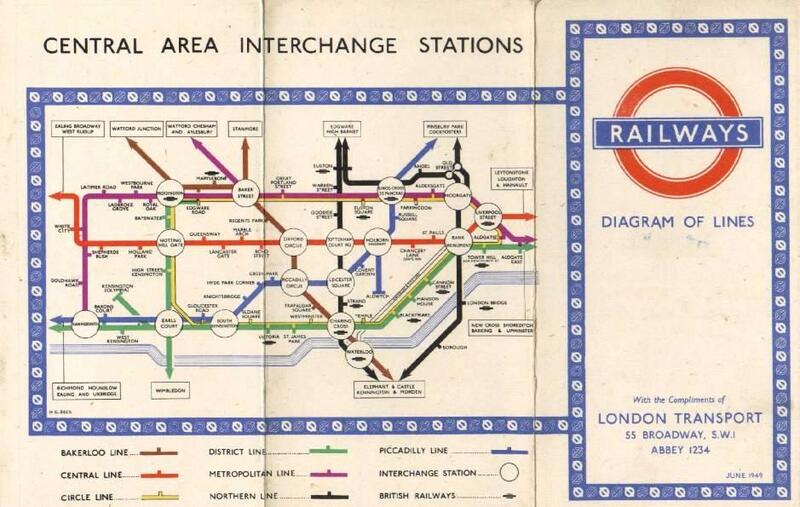 Originally designed by Harry Beck ( 1903 – 1974 ), an engineering draftsman with the London Underground’s Signals Office, in 1931, this colourful diagram has been part and parcel of London life, whether folded in jacket pockets or pasted across station walls, since it was first published in 1933. 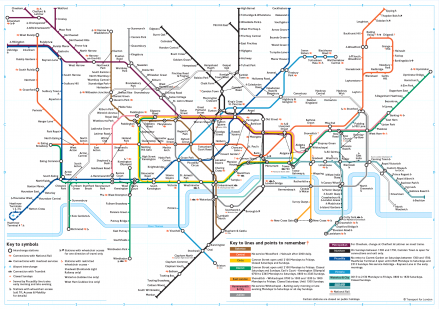 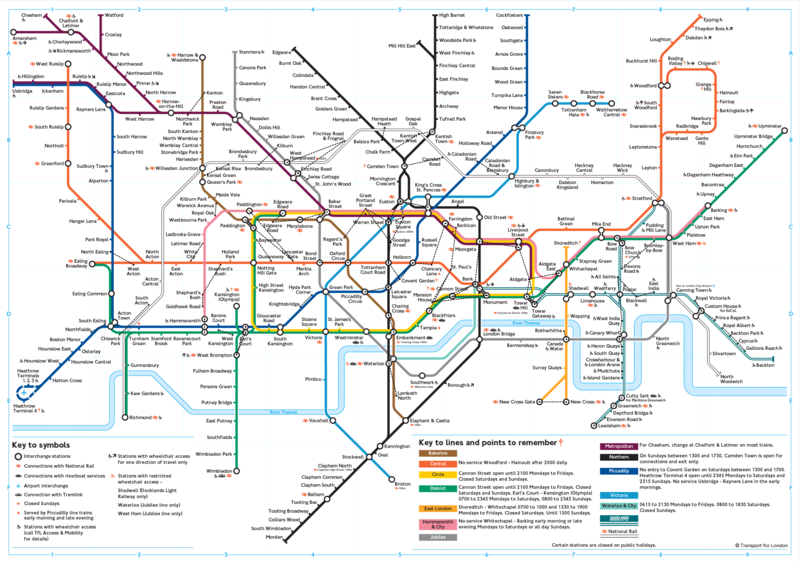 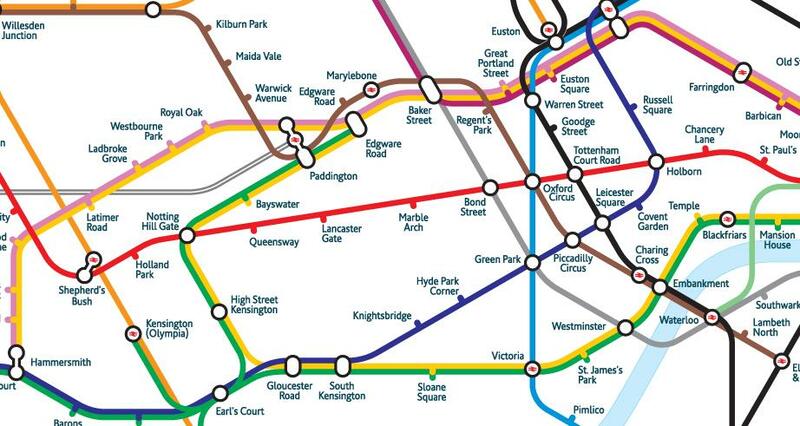 The London Tube Maps are a great example of maps that represent the immaterial. They do not actually have any material references (park, streets, etc), nor do they accurately depict spatial relationships. 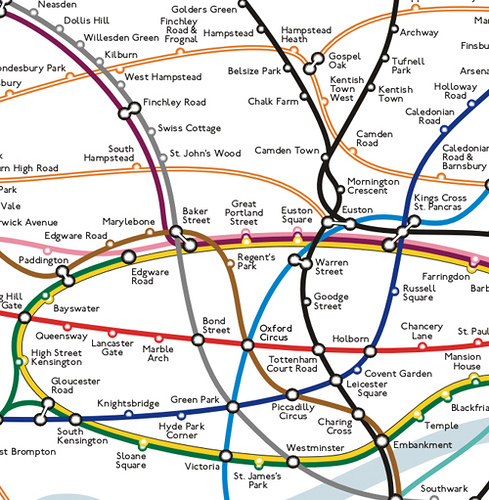 The Tube Maps simply illustrate the relationship between the stations. 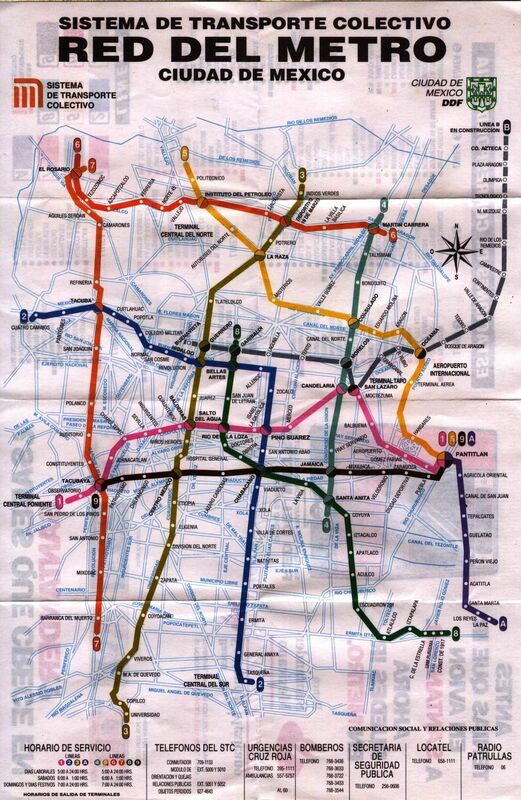 The map is a geometric distortion, an adjustment of actual topographic relationships to a geometric regularizing idea. 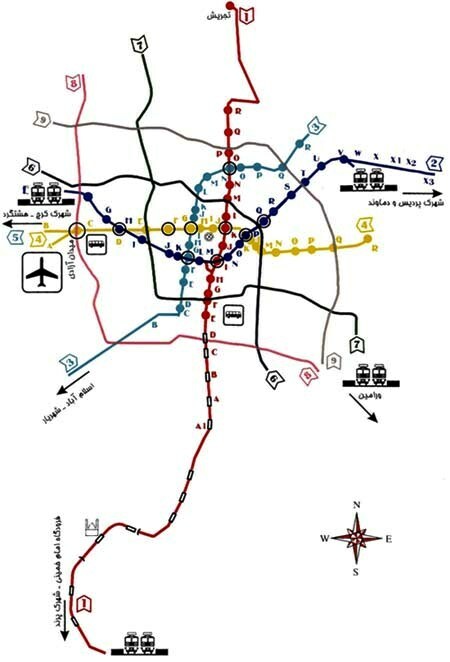 The simplified structure of the map is used to organize the intricate form of the city so that reality is perceived through the filter of the map. 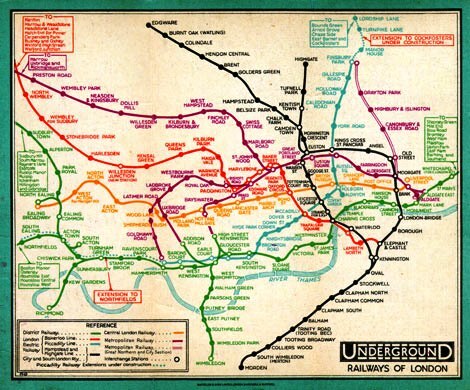 When Beck’s original map was in use, there were only seven lines on the Underground so the compromises Beck made on geographical accuracy did not matter greatly. 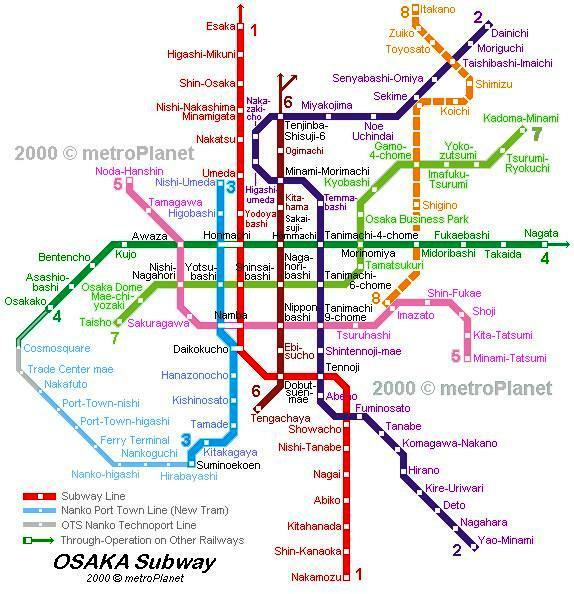 However now that there are more than twice that number of lines in operation, the inaccuracies are exacerbated. 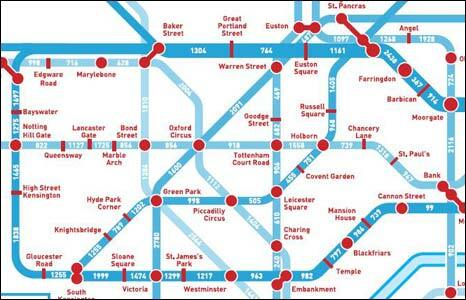 If you travelled from Bank to Mansion House on the Tube, you would end up 200 yards from where you started. According to the map, the most direct route from Chancery Lane to Farringdon stations by Underground requires two changes and four stations. 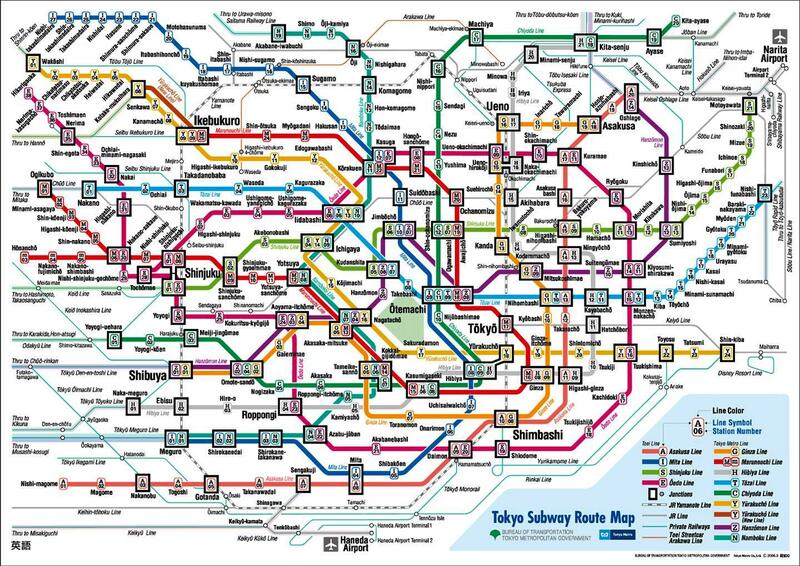 But you can walk it in less then ten minutes. 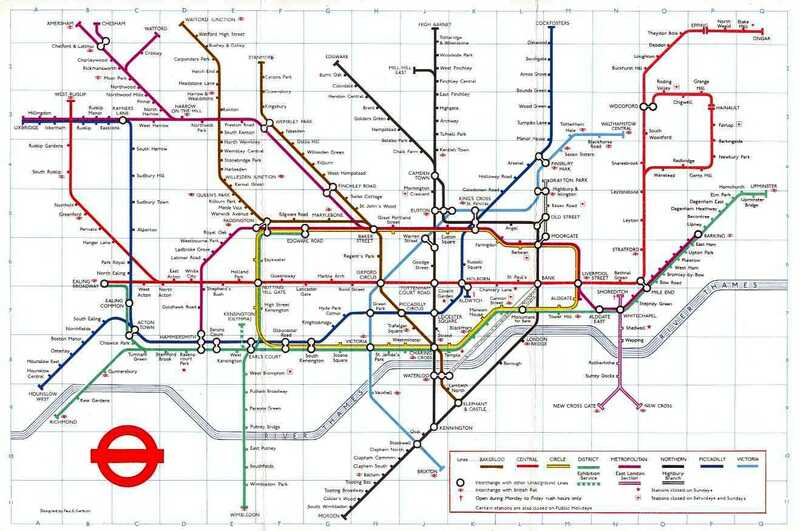 Similarly the distance between Charing Cross and Embankment stations. On the map it seems a decent journey – equivalent in distance, it seems, as between Tottenham Court Road and Oxford Circus. 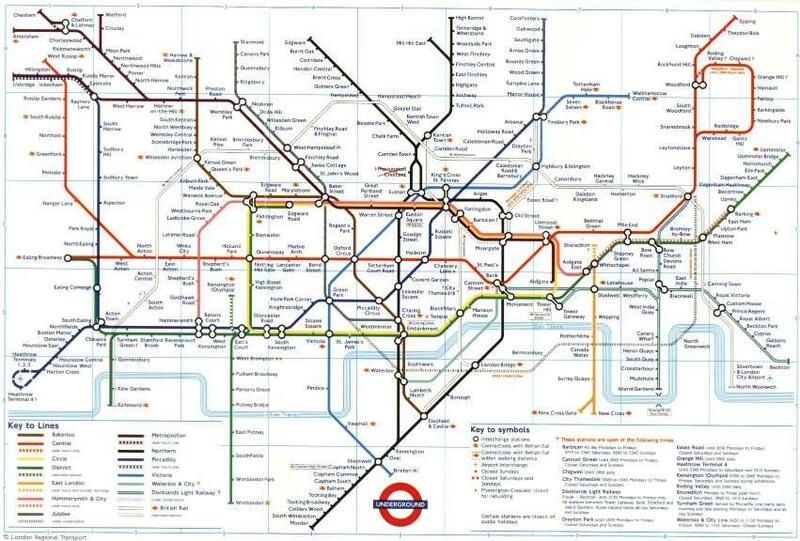 However most Londoners will know that it’s actually a very short stroll. 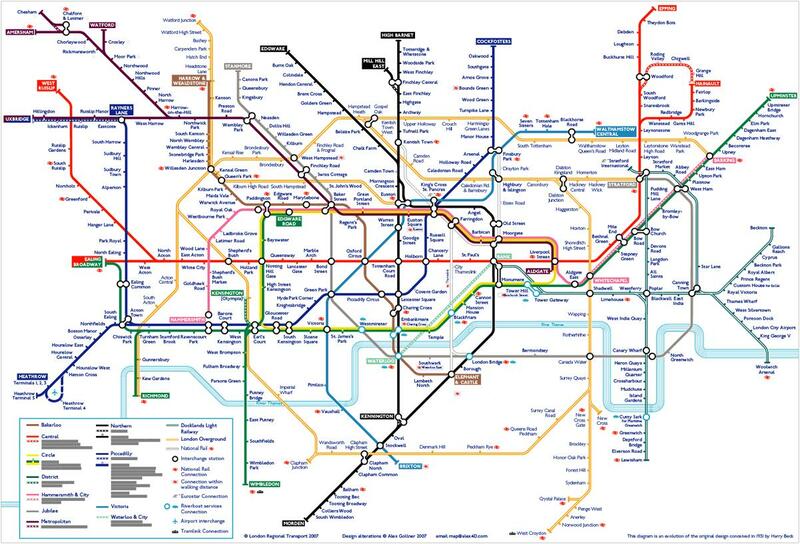 The main problem with the Tube map is that it is geographically inaccurate. 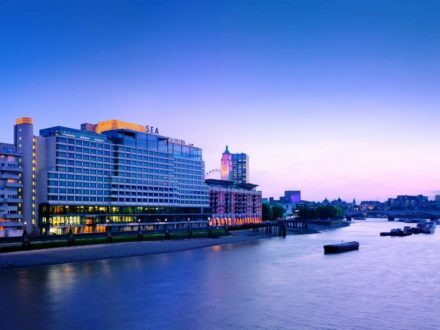 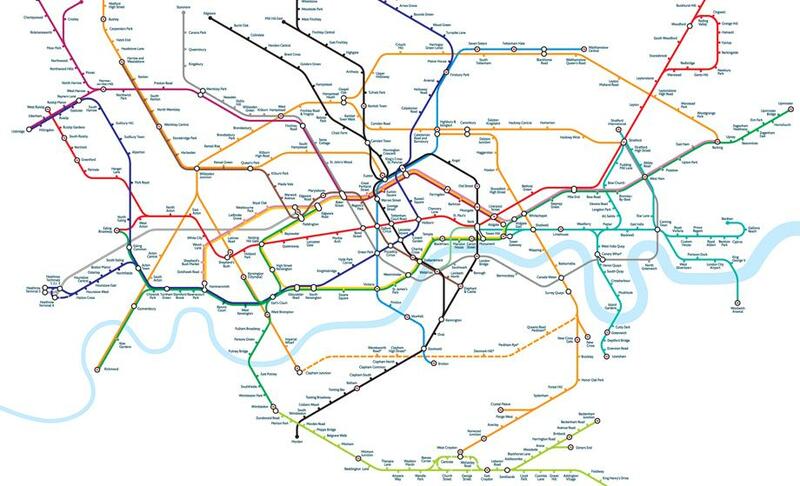 This can lead to a very distorted view of London, particularly for those new to the city. 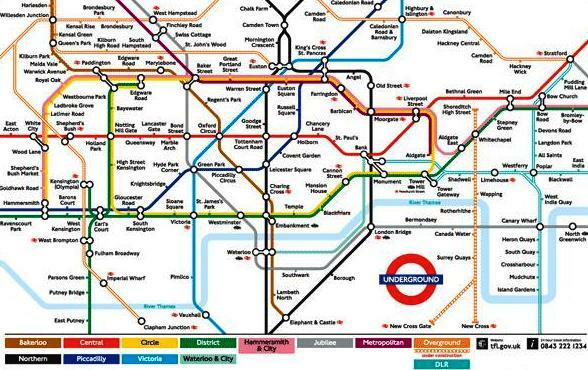 It is also deficient in the way it describes some stations. 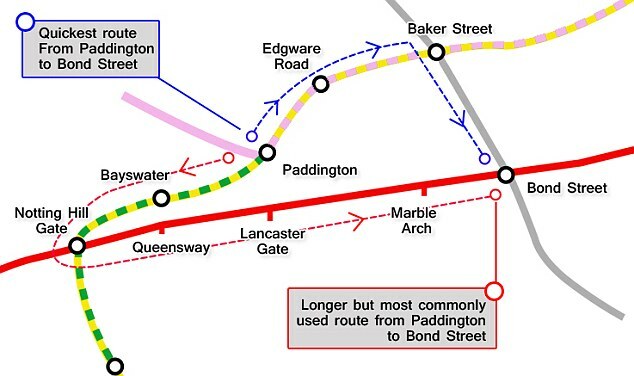 For example, the interchange between the Hammersmith and City line and other lines at Paddington. 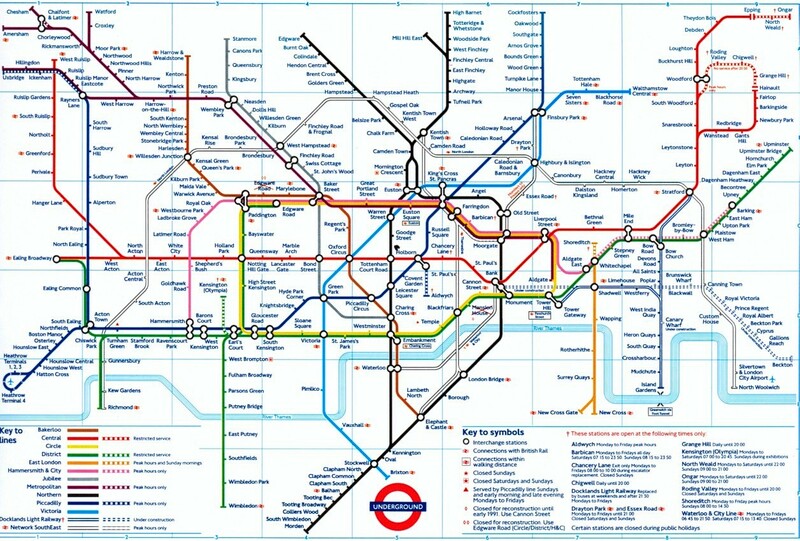 It’s a reasonably long walk but they are still in the same physical station. 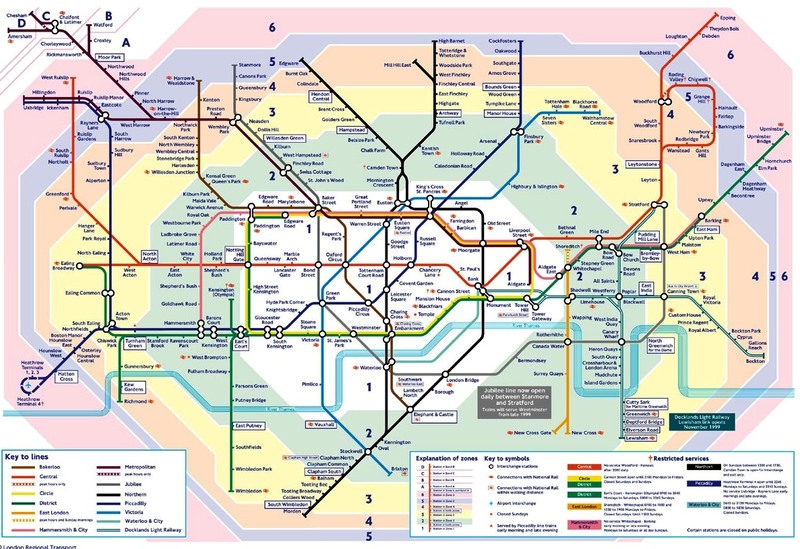 The beauty of the orthogonal London Underground map is that it provides exactly the information the rider needs – the name of the line (with color coding), the direction of travel (East, West, North or South – the same way that the directions to the platforms are given), and the stops on the way. 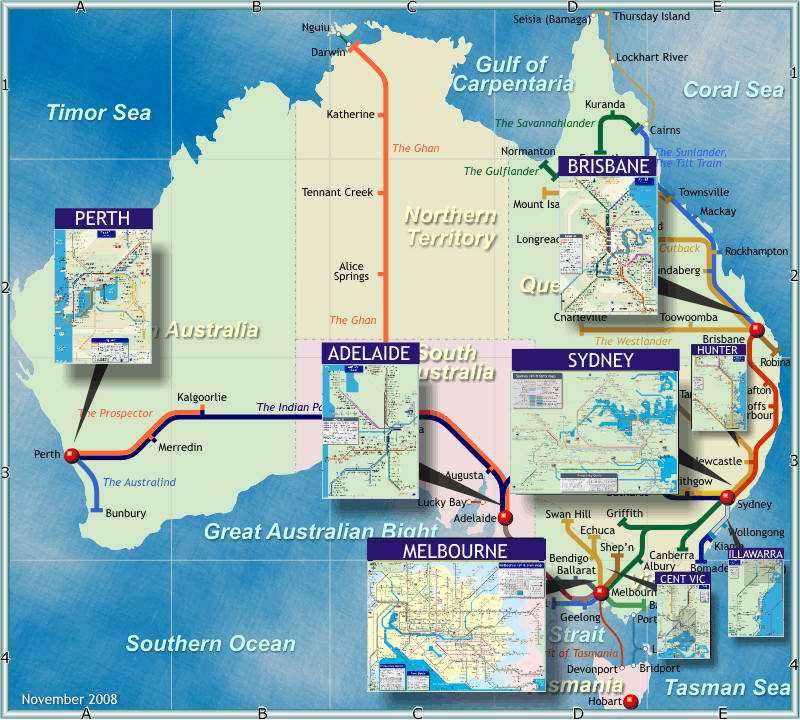 Distance between stops and geographical orientation are of very secondary interest to finding the correct train. 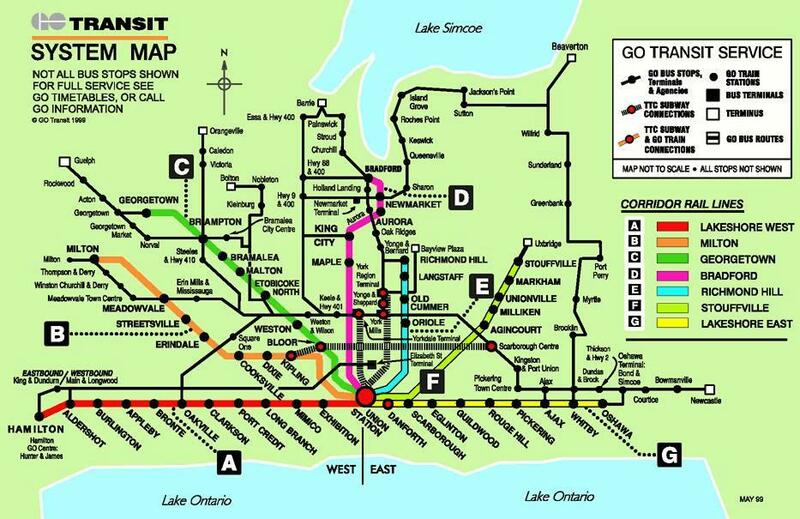 Most stops are about the same time of travel apart and the trains come frequently enough that you don’t need to plan to your schedule in too much detail. 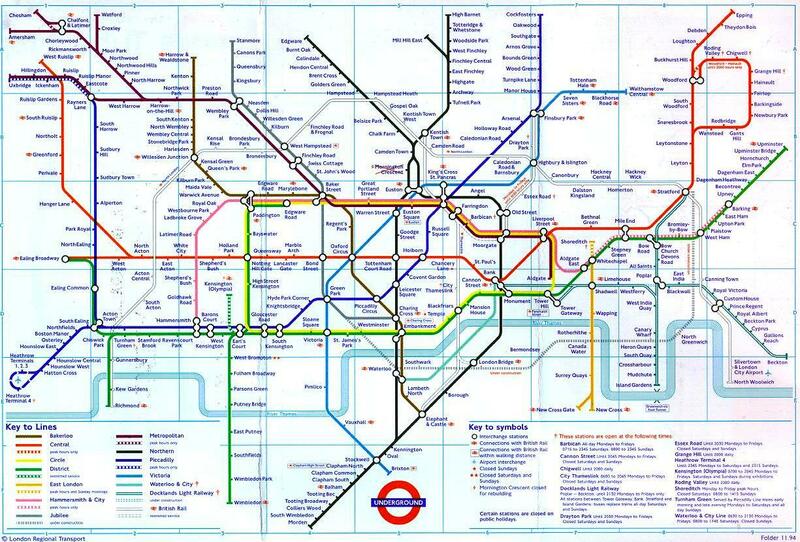 You can travel between Warren Street and Stockwell by either the Northern line or the Victoria line without changing. 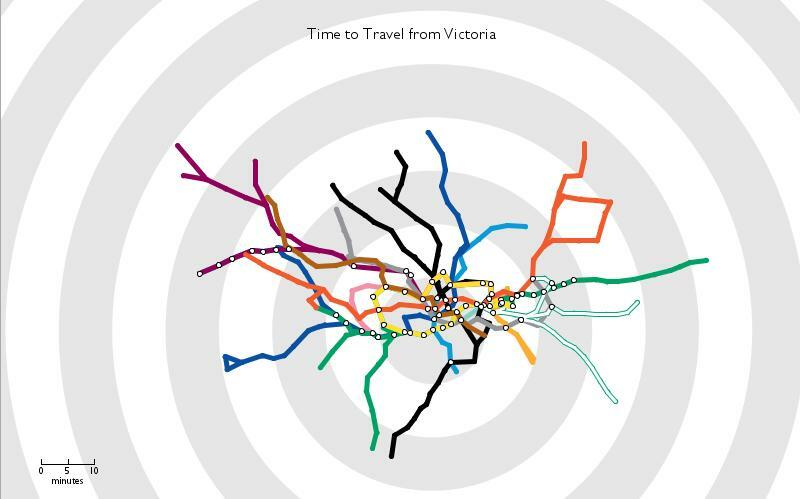 But the map doesn’t tell You that the Victoria line is usually faster, with more frequent trains. 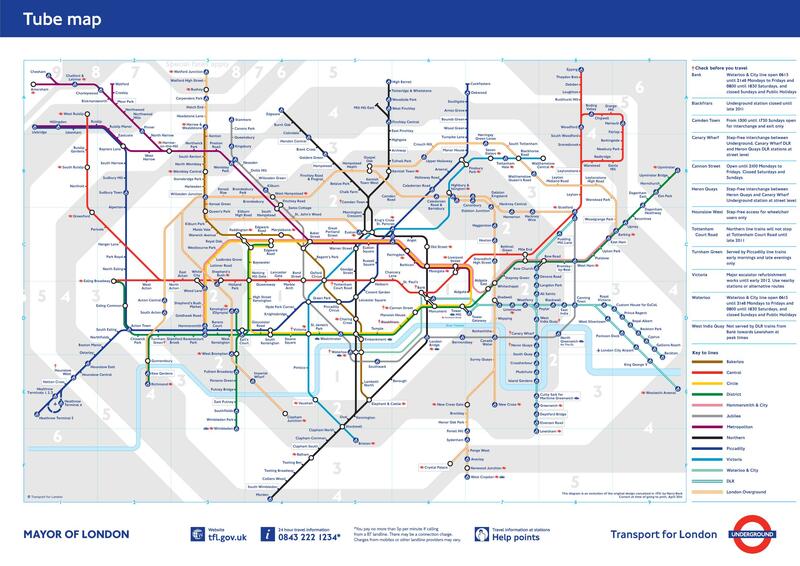 Of course, an indicator is that there are more stations on the Northern line route, but the map seems to indicate that the Victoria line follows a less direct path. 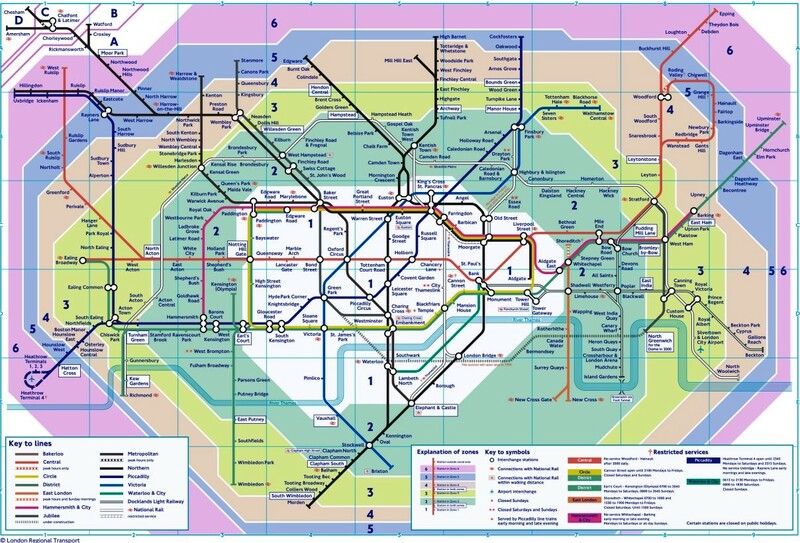 A greater problem with the tube map is the disproportionate spacing between stations. 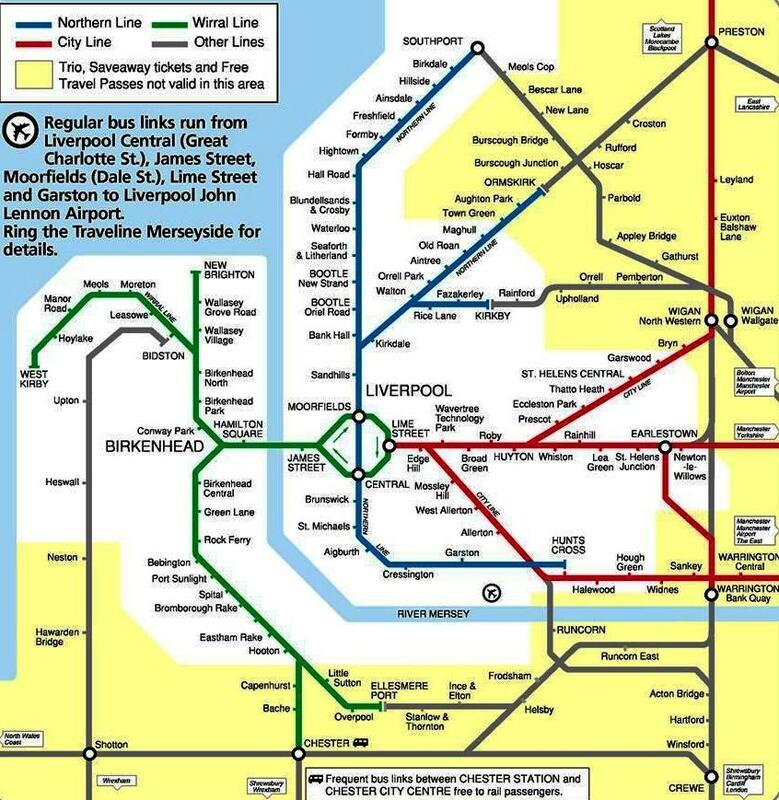 The Beck map encourages people to take a train between two stations when other forms of transport would be far more suitable. 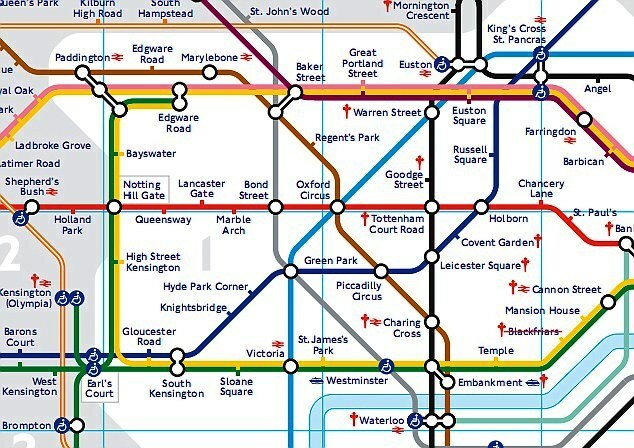 The most famous example is that of Covent Garden and Leicester Square – not more than two hundred metres apart in reality, but well spaced on the Beck map. 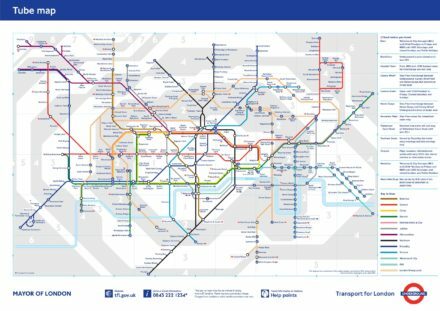 To help tourists and others understand this dilemna better the London Underground (and others) have produced “Walking Maps” to identify where it is quicker to go by Foot rather than by Tube. 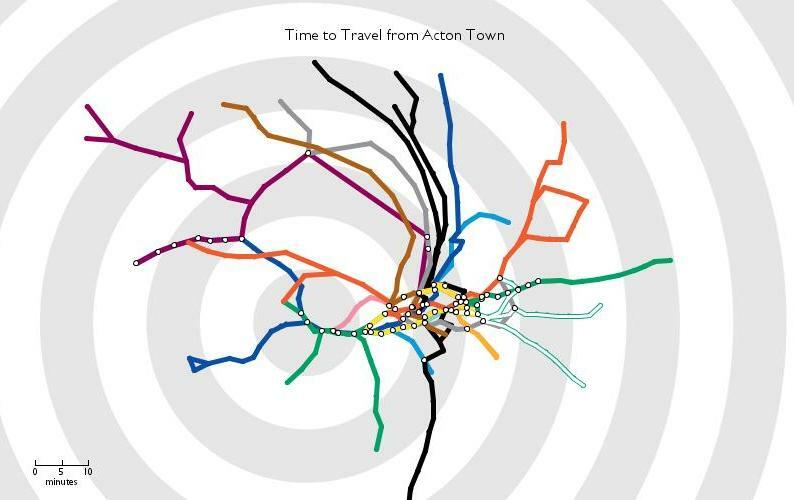 This Map by Applied Information Group shows journeys that take less time on foot than they do by tube. 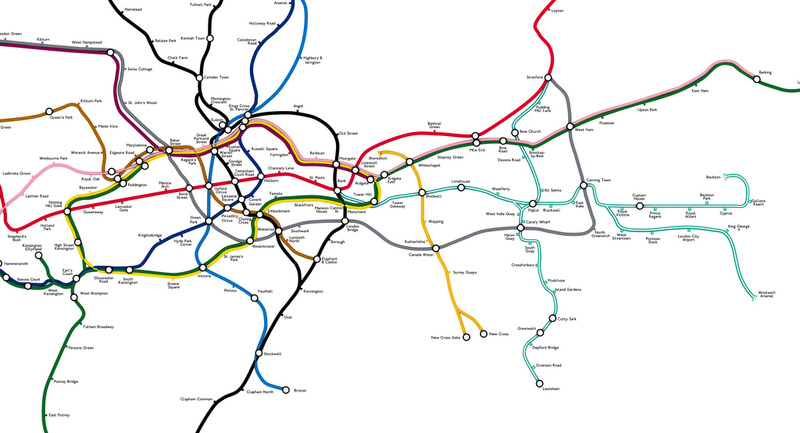 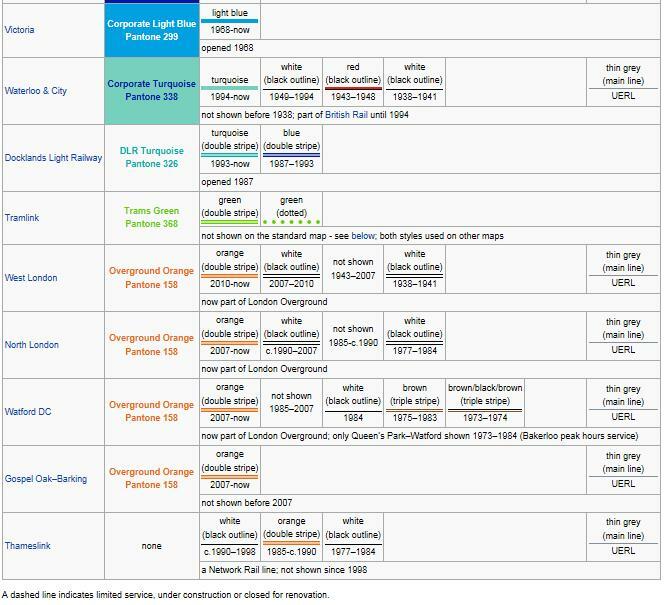 Below are some London Underground maps reorganised around the times of travel from that station. 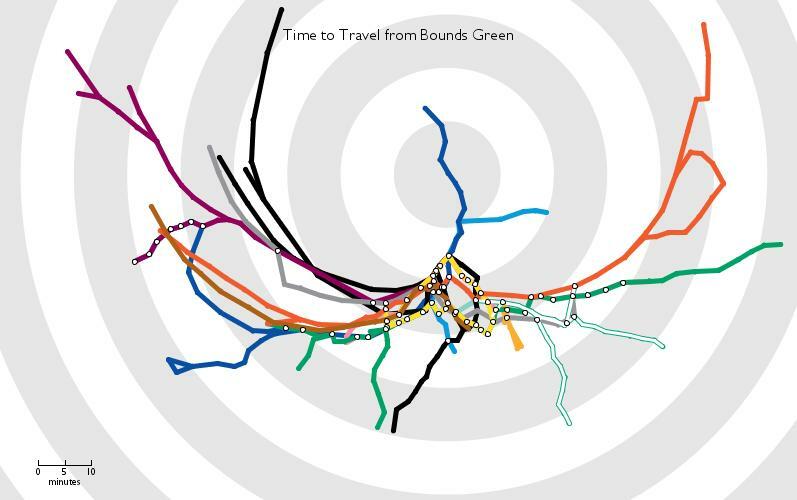 Shortest paths are used to place the other stations – radius is proportional to time to travel, and angle should be correct for as-the-crow-flies direction on a map. 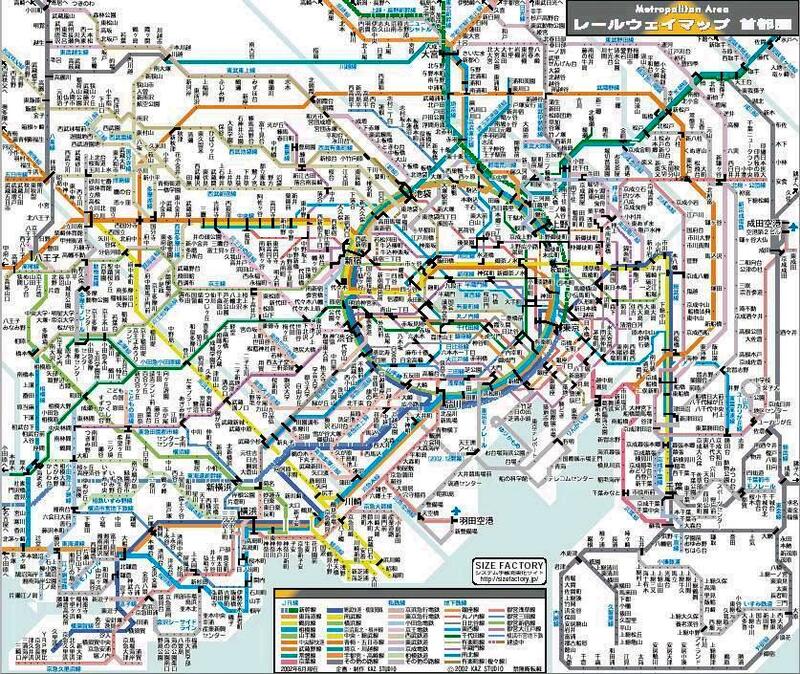 The concentric circles are at 10 minute intervals. 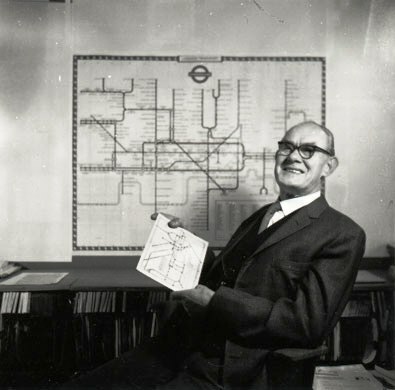 Harry Beck was 29 and had been working for the Underground as an engineering draughtsman since 1925, travelling to his Victoria office from his home in Highgate Village. 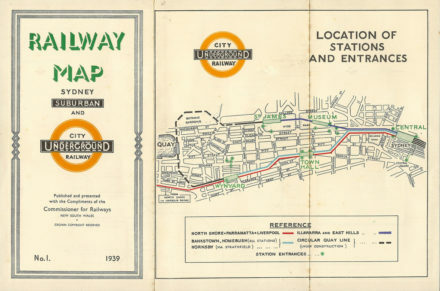 The early 1930s economic crisis saw many plans for the Tube – including a deep, fast-track line that would rush passengers from north to south, stopping at just the main stations – were mothballed. 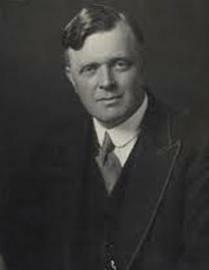 However, work began to pile up in his old office and because he had been playing in the transport orchestra his former colleagues remembered him and, in 1933, he was re-employed. 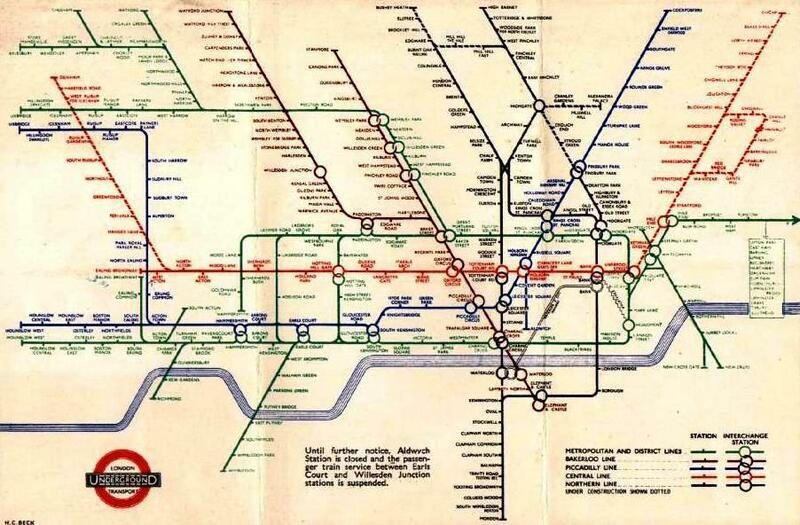 Before he was first dismissed in 1931, he had been pondering on the messy nature of the Tube map of the time, which was geographically correct but hard to navigate. His colleagues liked his idea but the publicity department of the Tube did not. But Beck continued to badger his bosses – even during the time that he did not officially work for the Underground – and in 1932 the publicity department changed their minds. 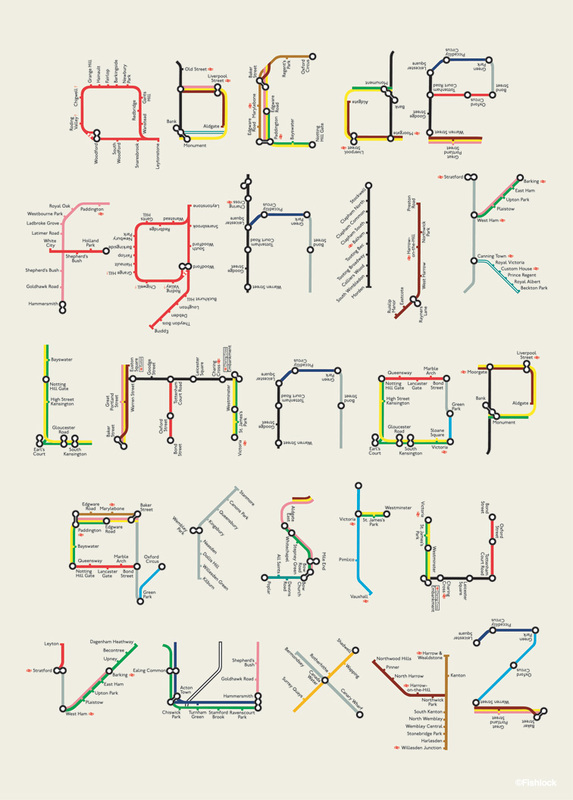 Eventually, they commissioned a print run of 750,000. 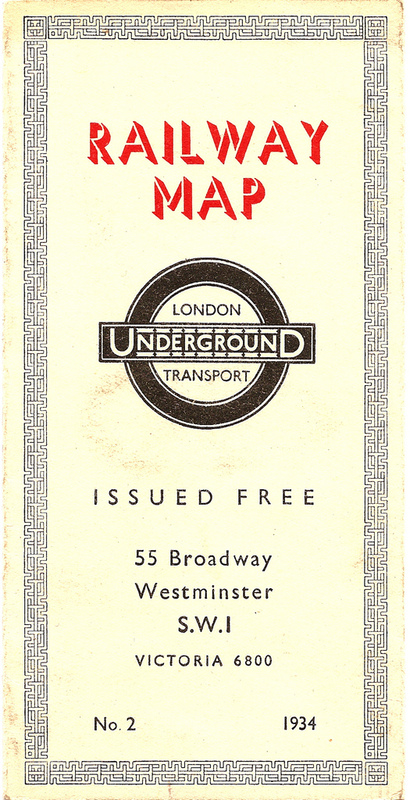 The Underground management was a little unsure of how the public would take to such a revolutionary change in the design and a note on the front cover of a trial run of the map (see above), invited people to send their comments to the Publicity Manager. 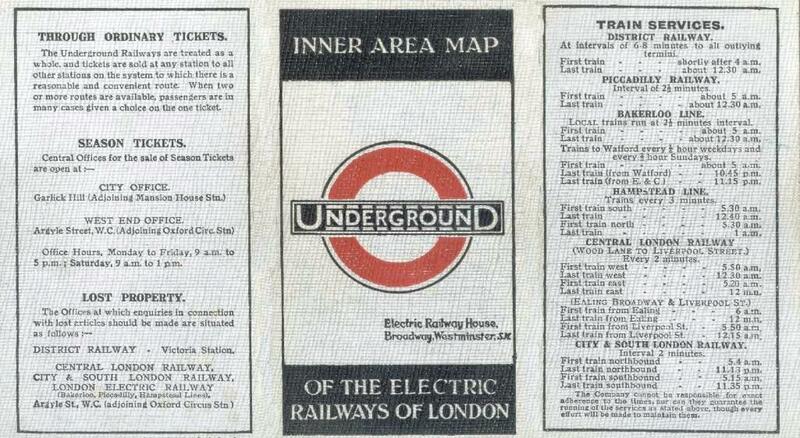 In fact the map was accepted very well and was eventually to become held with great affection. 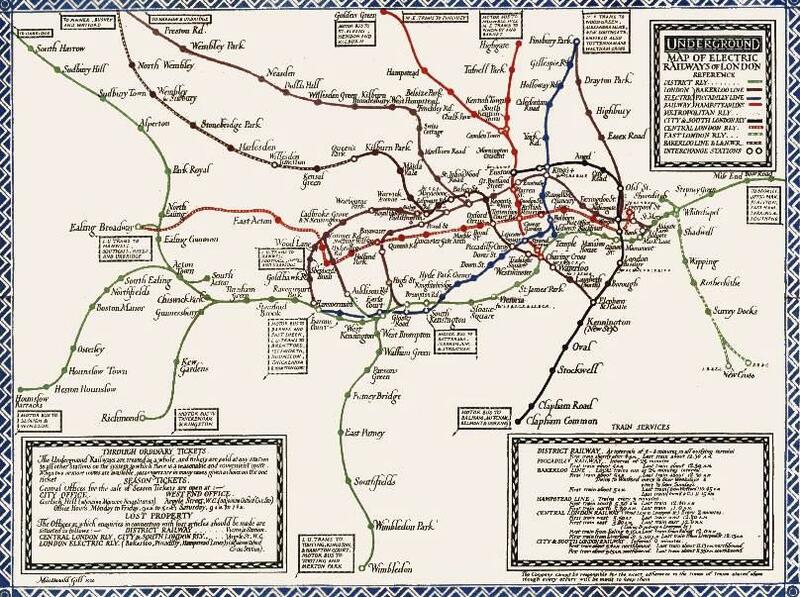 The incorporation of the river was also to be greatly revered by tube travellers and has been to the present day. 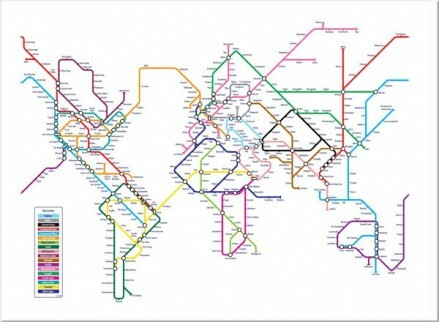 This is the only surface feature shown on the map and although it too is a schematic representation, it provides a geographical datum which assists the interpretation and understanding of the map tremendously. 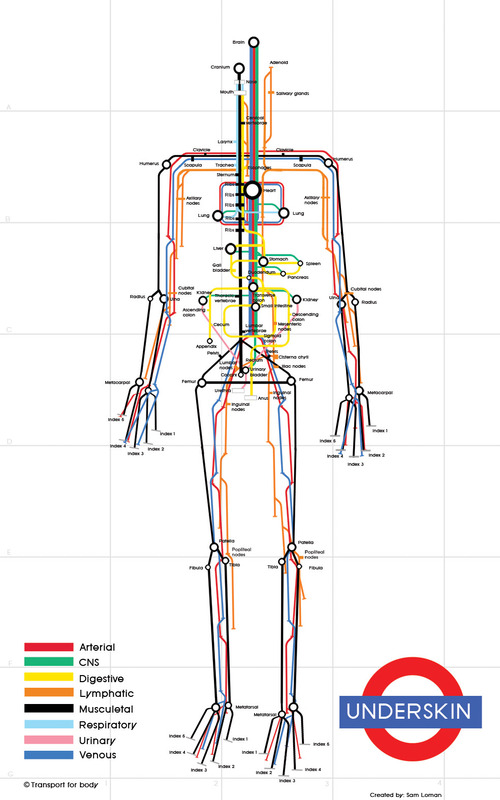 “There were criticisms that the diagram was inaccurate. 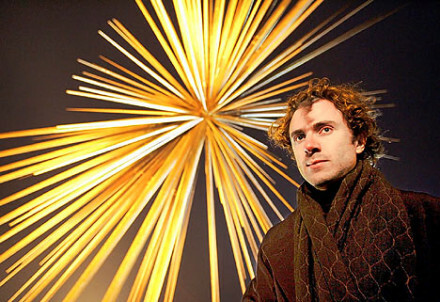 But the public loved it,” Harry said. 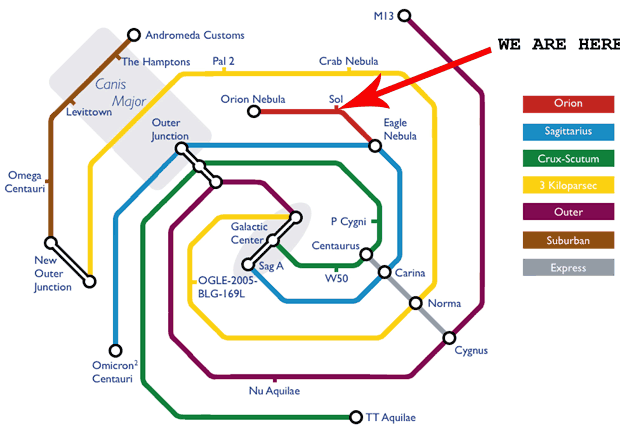 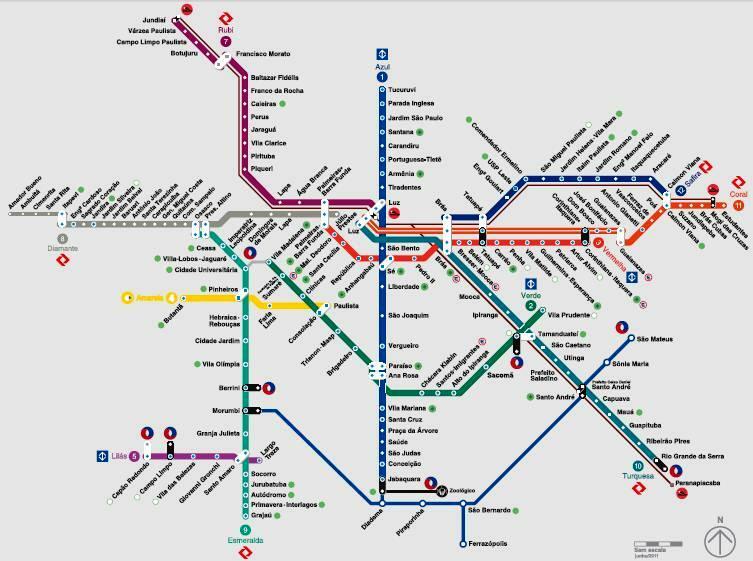 Beck constantly updated and improved his map: not least because the Underground system itself was expanding. 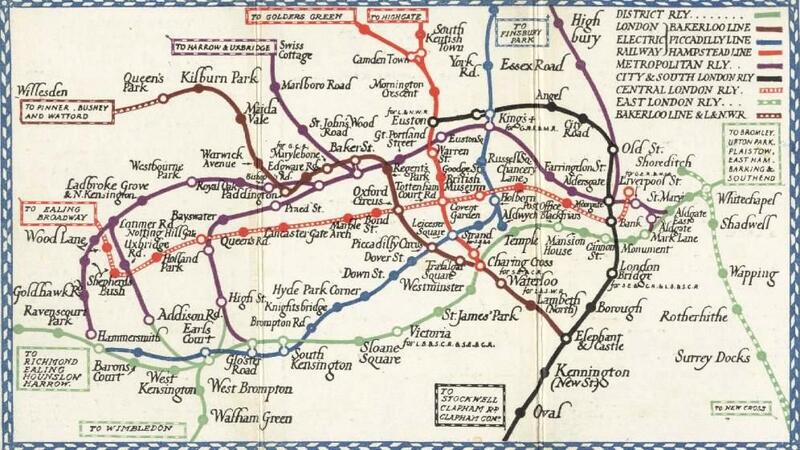 Beck would also add lines that were under construction: one such incomplete line was a route on the Northern Line linking Finsbury Park on the Victoria and Piccadilly lines with Highgate. It would mean Stroud Green and Crouch End getting their own stations, and Highgate becoming an interchange with an added line going to stops at Cranley Gardens, Muswell Hill and Alexandra Palace. 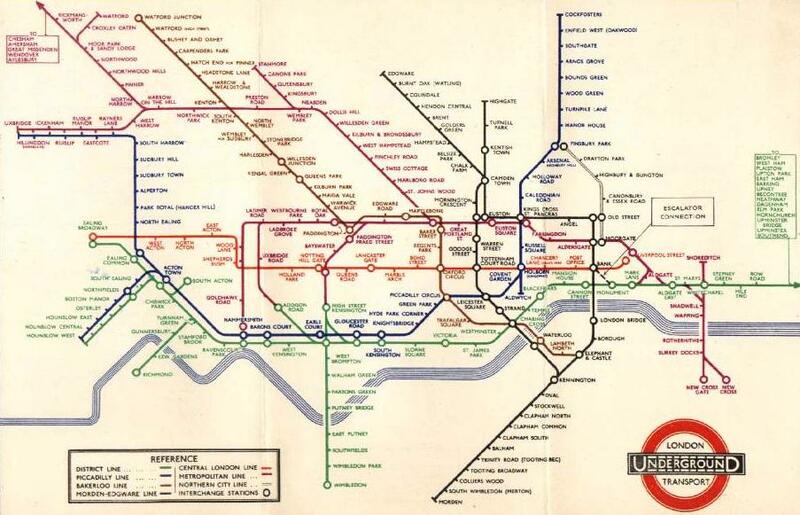 His diagram of 1949 boldly shows planned extensions that, 57 years later, the residents of north London are still waiting for. 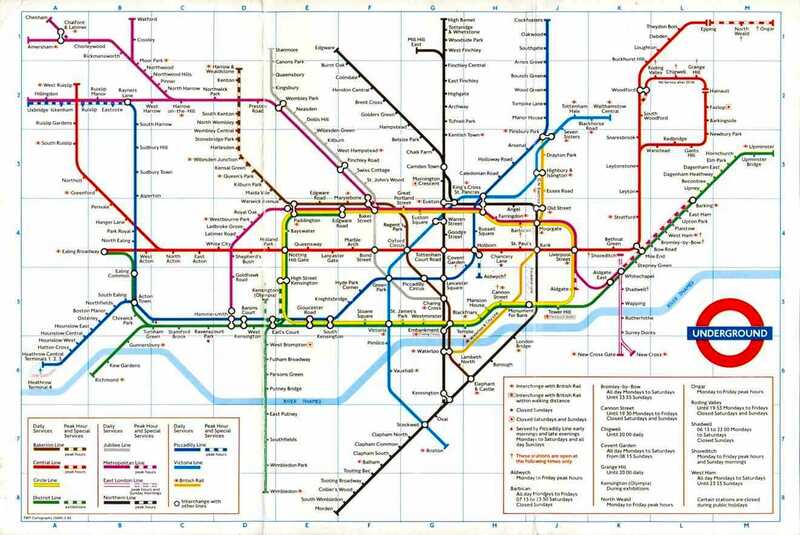 The transport system now known as the London Underground began in 1863 with the Metropolitan Railway, the world’s first underground railway. 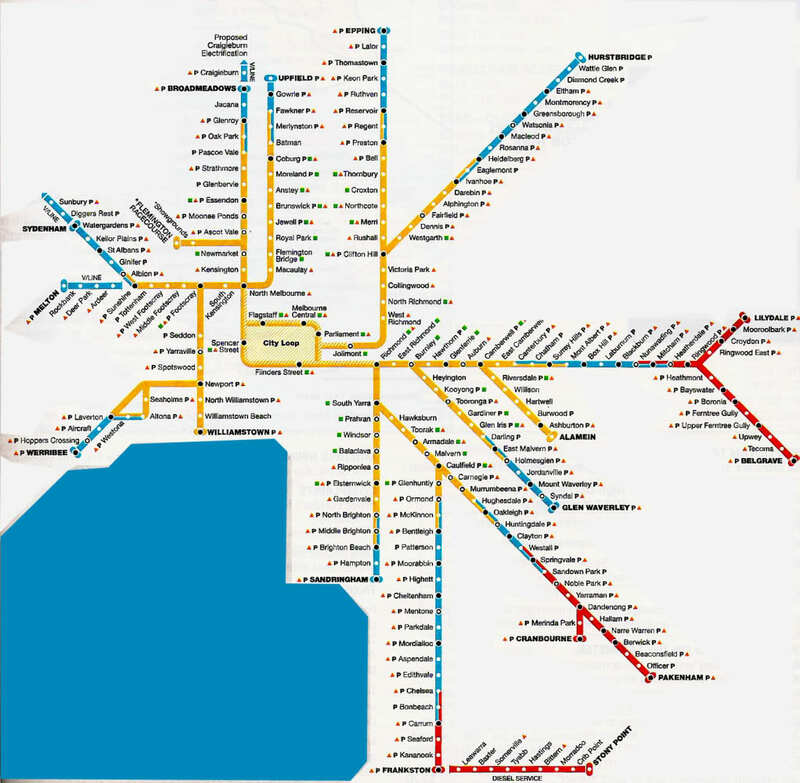 Over the next forty years, the early sub-surface lines reached out from the urban centre of the capital into the surrounding rural margins, leading to the development of new commuter suburbs. 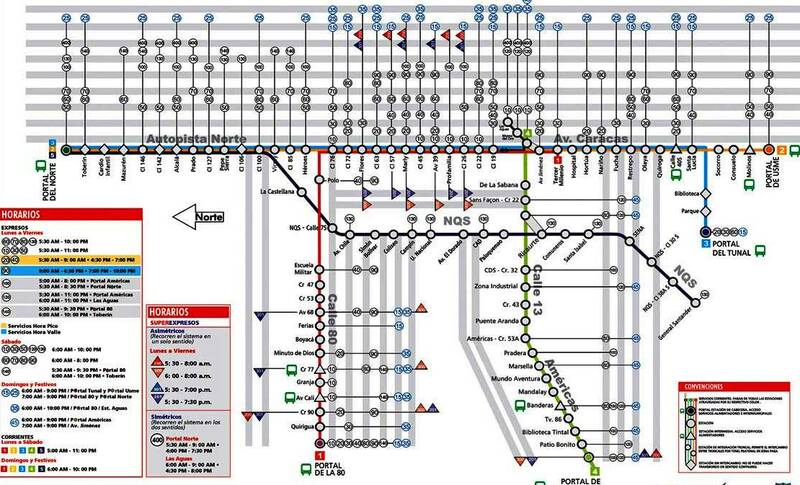 Passenger navigation is essential in any efficient transport system. 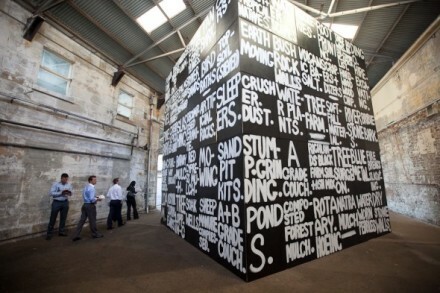 This means all forms of visual communication must be considered. 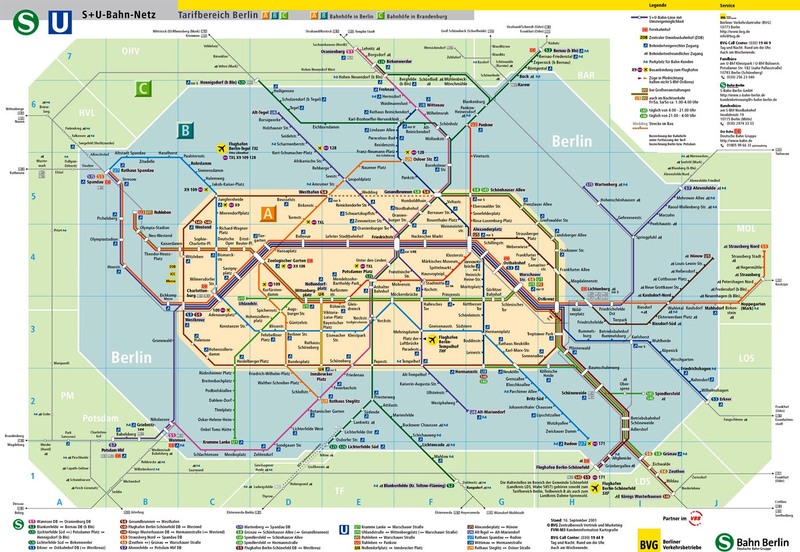 Clear and easy-to-read signage, maps, and literature all play an essential part. 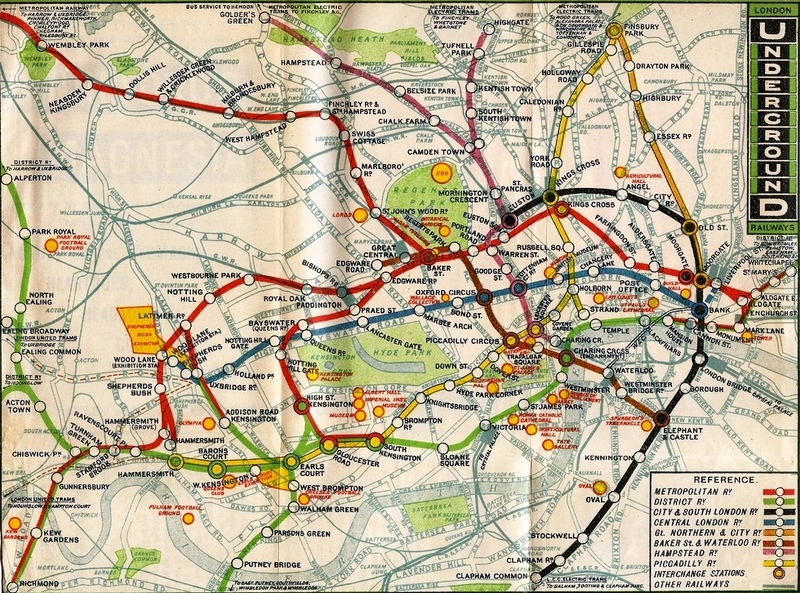 At the end of the 19th and beginning of the 20th century, new technology—including electric locomotives and improvements to the tunnelling shield—enabled new companies to construct a series of “tube” lines deeper underground. 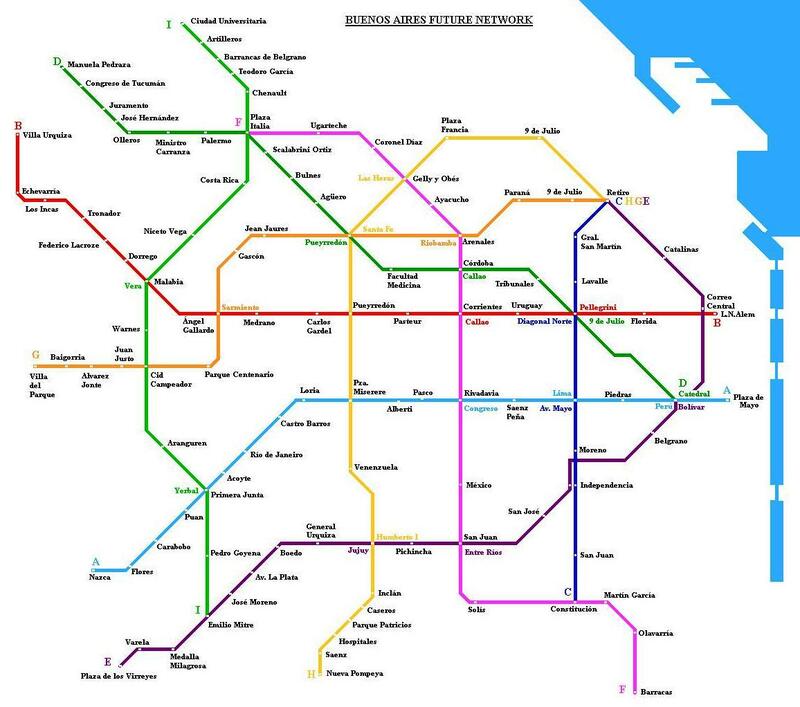 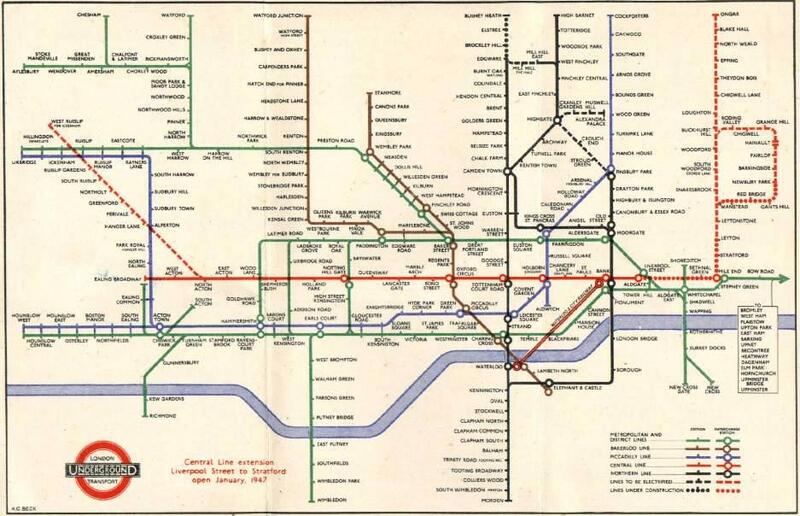 What is now a single network of lines controlled by a single organisation began as a collection of independent underground railway companies that constructed lines in the 19th and early 20th centuries. 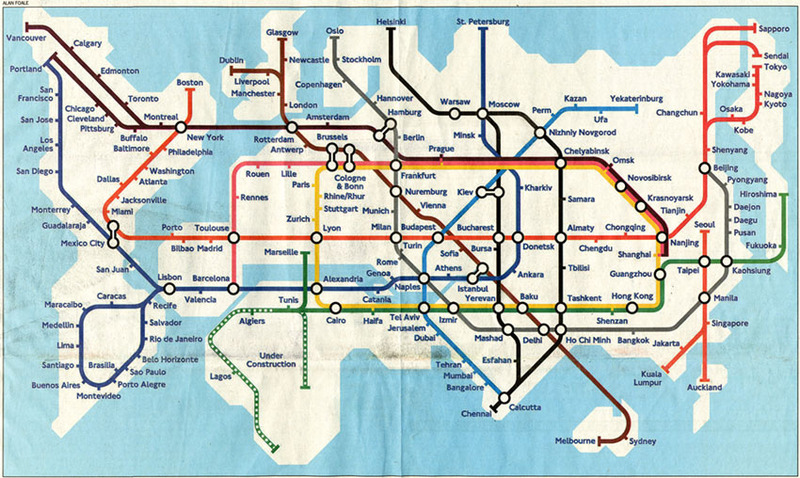 These companies published route maps of their own services but did not, generally, co-operate in advertising their services collectively. 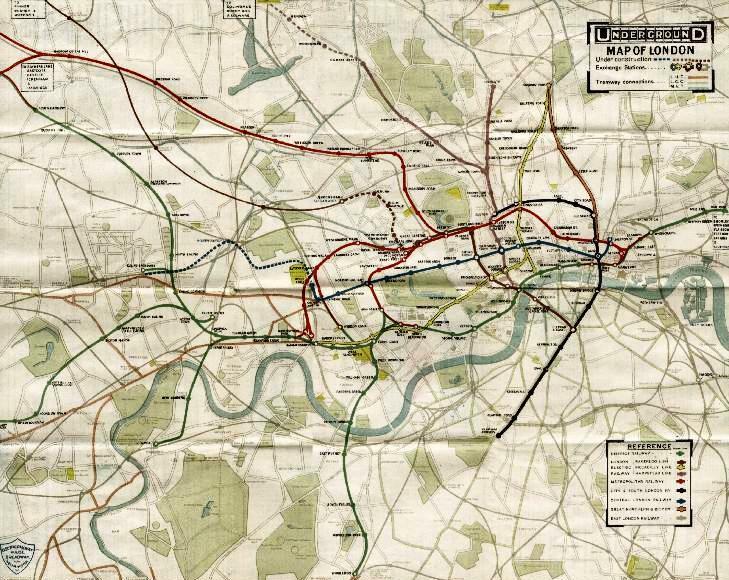 Early maps were based on standard geographic city maps indicating the directions of lines and locations of station, overlaid on geographic features and main roads. 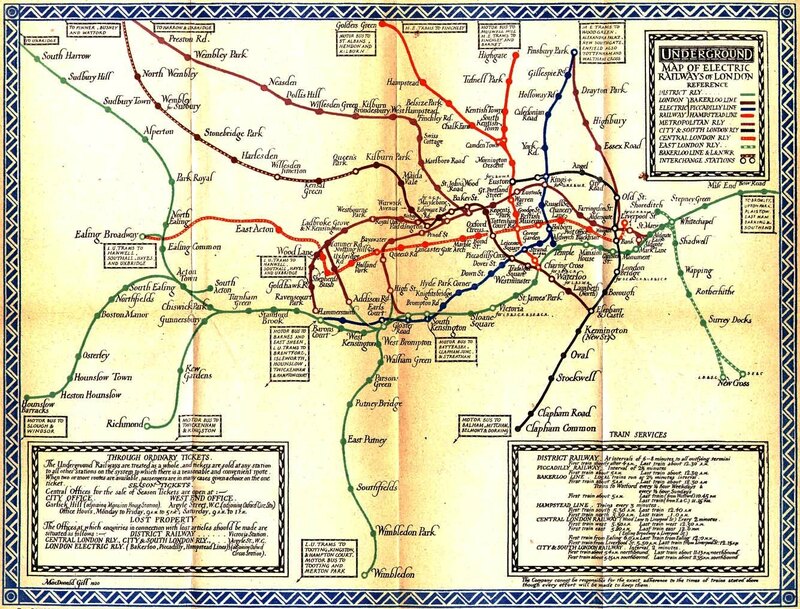 The Metropolitan and Metropolitan District Railways produced the first public transport maps of London in the 1880s. 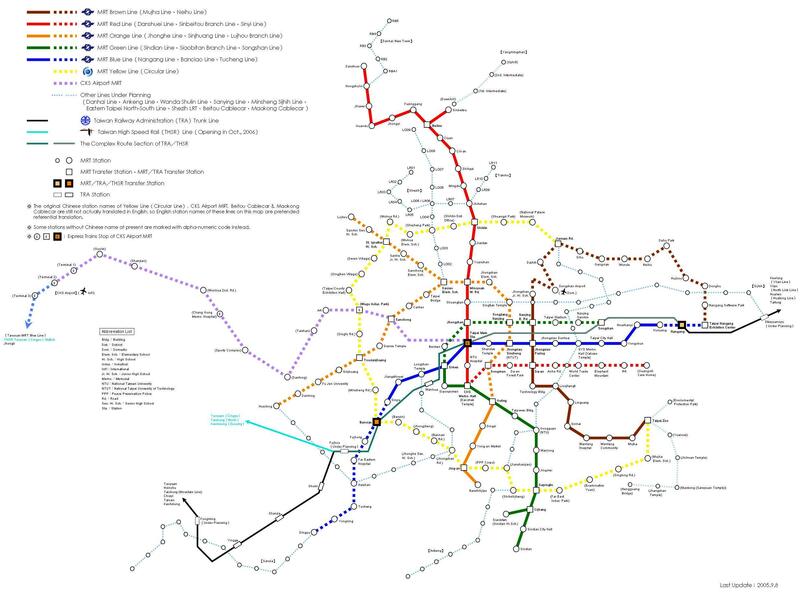 They showed routes and interchange stations and advised passengers on where they could make connections with mainline train and horse-bus services. 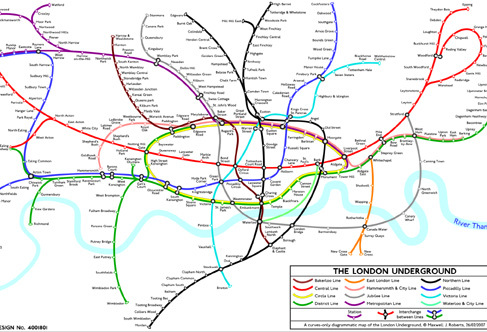 The Underground network expanded considerably during the 1890s and 1900s when the deep Tube railways were built. 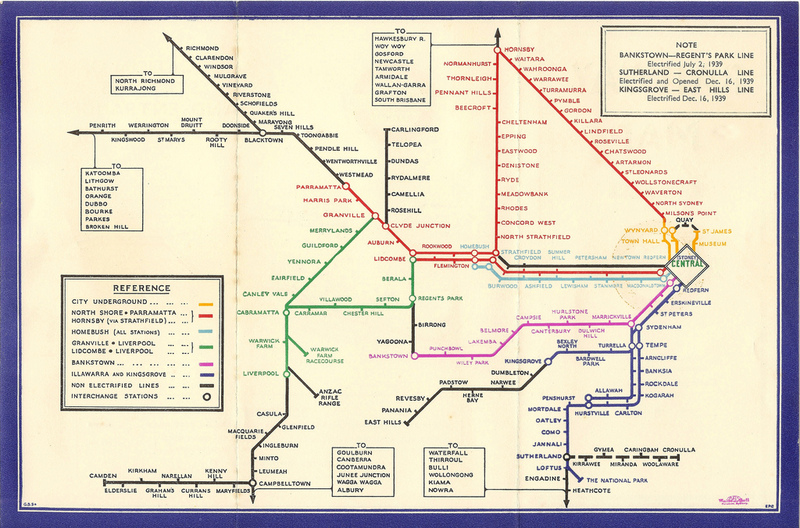 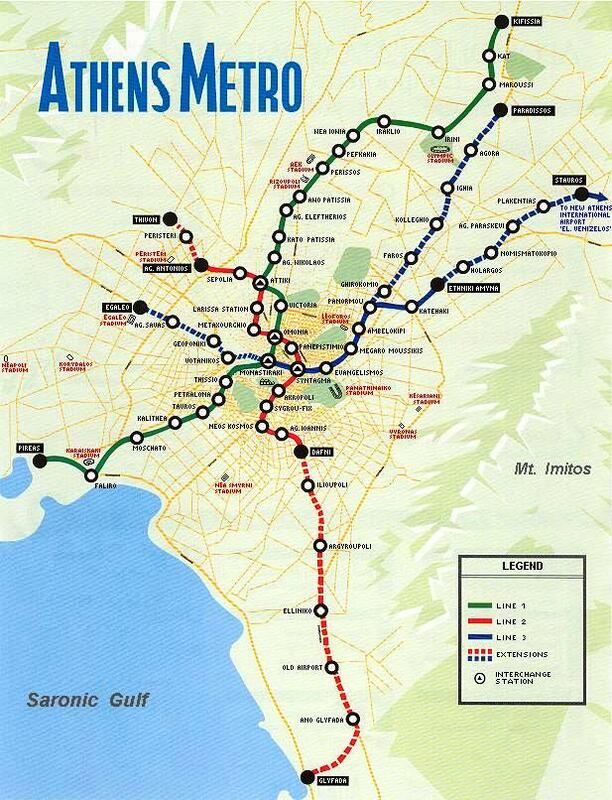 Many of the lines were operated by different railway companies, who each produced their own maps. 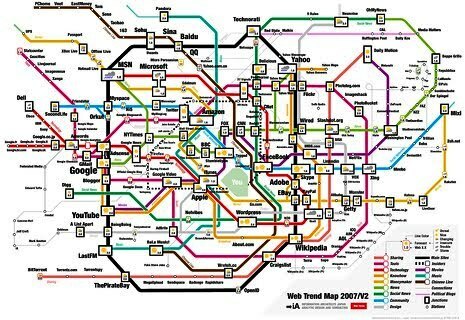 This became increasingly confusing for the public as the system grew. 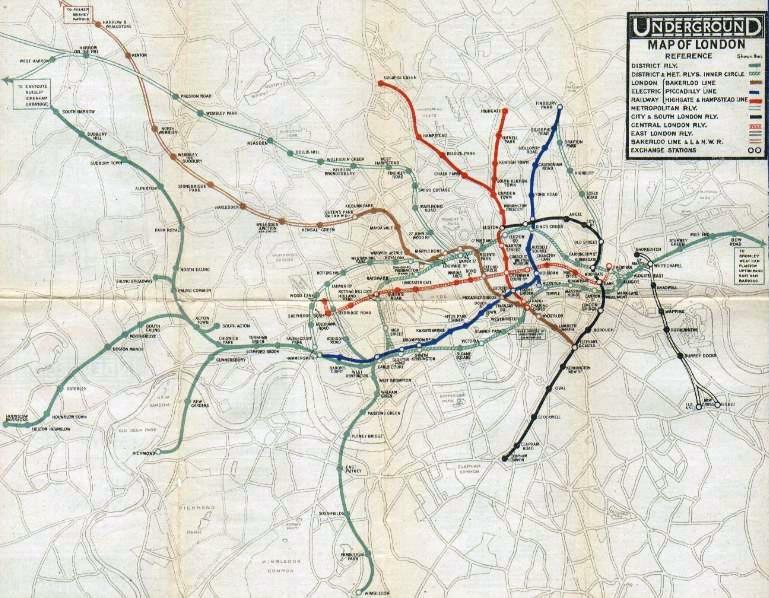 In 1908, the Underground Group produced a single standard map that included all lines. 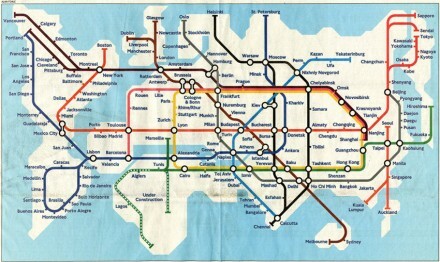 This was part of promoting the Underground Group as a ‘system’, and of cooperation between private companies that were still independent operations. 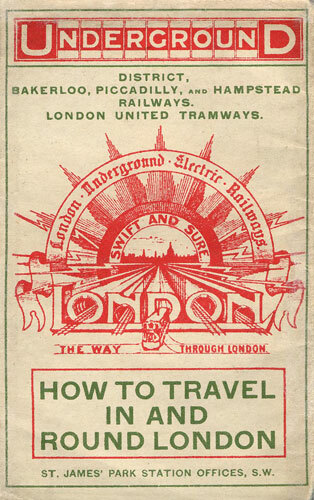 The Electric Railways Company of London (UERL) in conjunction with four other underground railway companies used the “Underground” brand as part of a common advertising initiative. 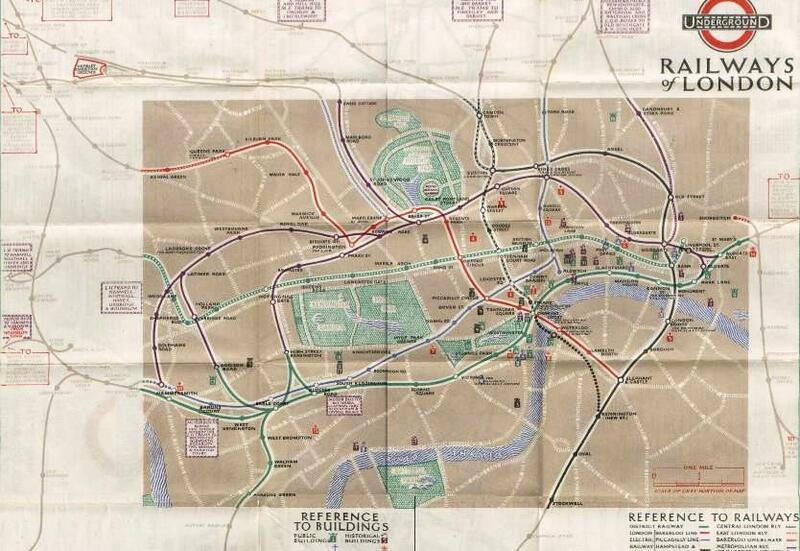 The use of a geographic base map presented restrictions in this early map; to enable sufficient clarity of detail in the crowded central area of the map, the extremities of District and Metropolitan lines were omitted so a full network diagram was not provided. 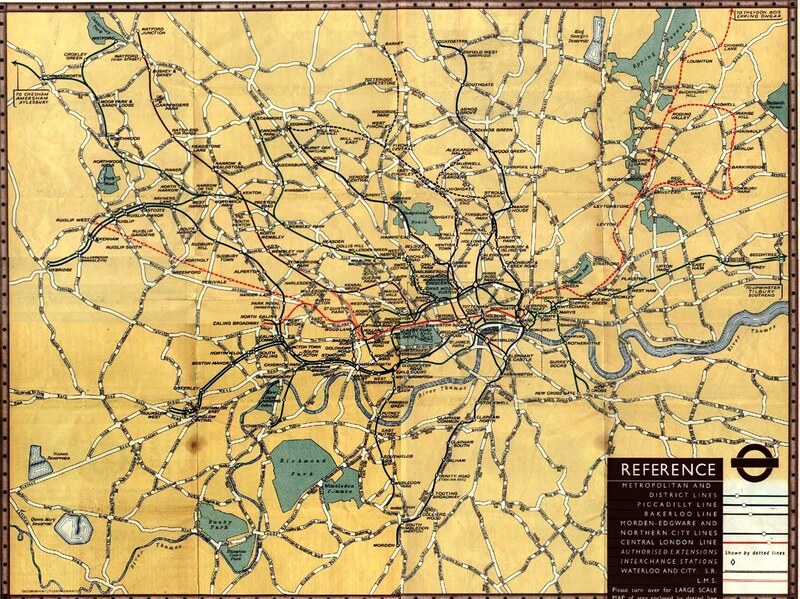 The route map continued to be developed and was issued in various formats and artistic styles until 1920, when, for the first time, the geographic background detail was omitted in a map designed by MacDonald Gill. 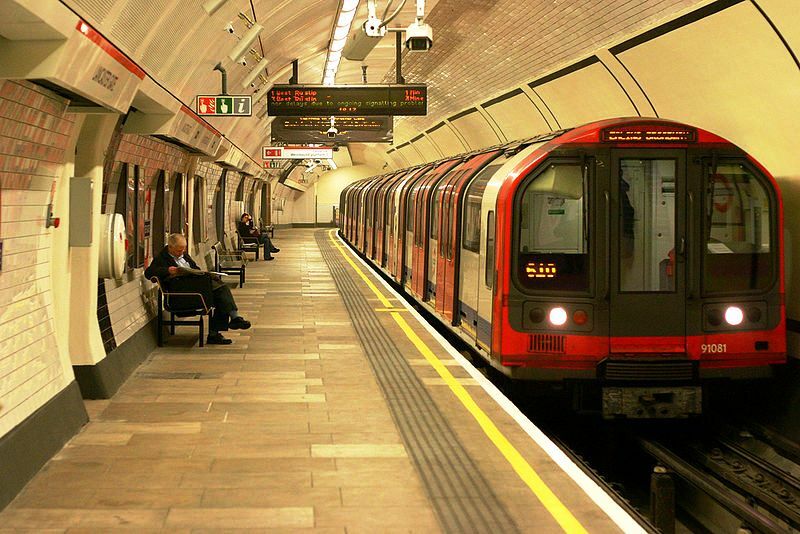 This freed the design to enable greater flexibility in the positioning of lines and stations. 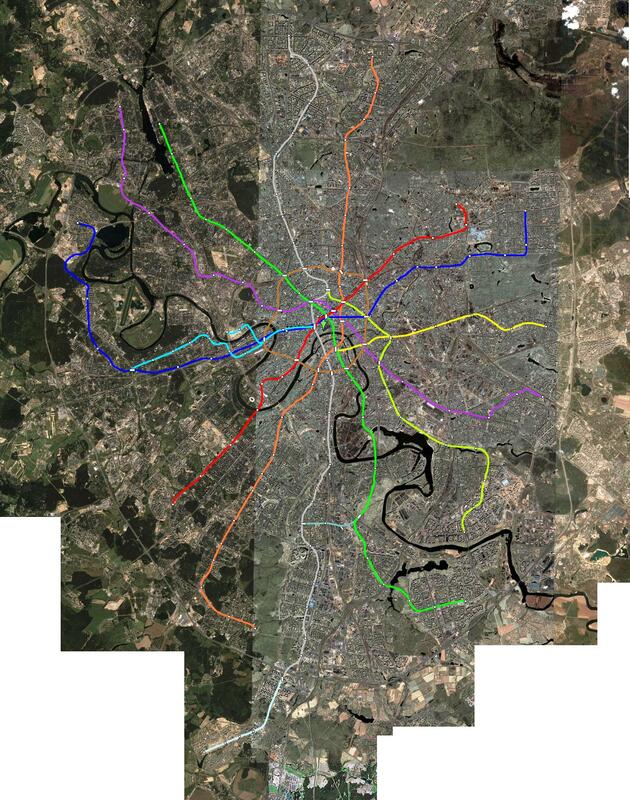 The routes became more stylised but the arrangement remained, largely, geographic in nature. 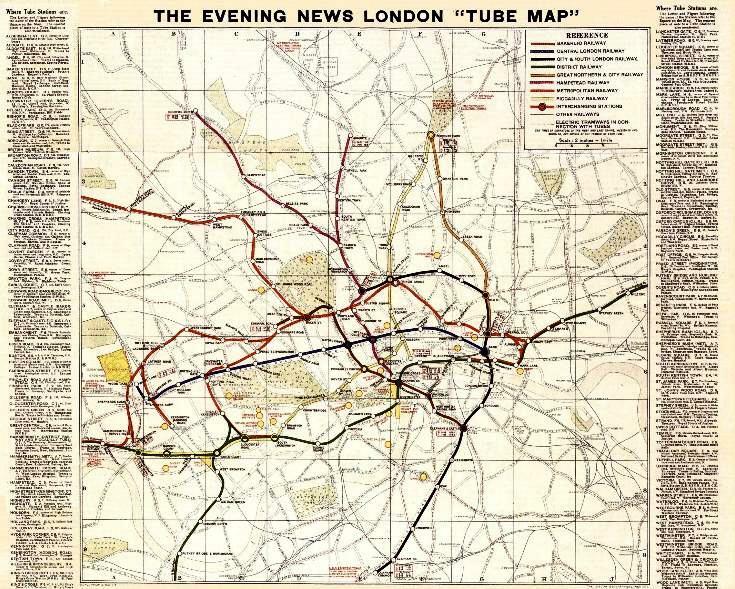 The 1932 edition was the last geographic map to be published, before the diagrammatic map was introduced. 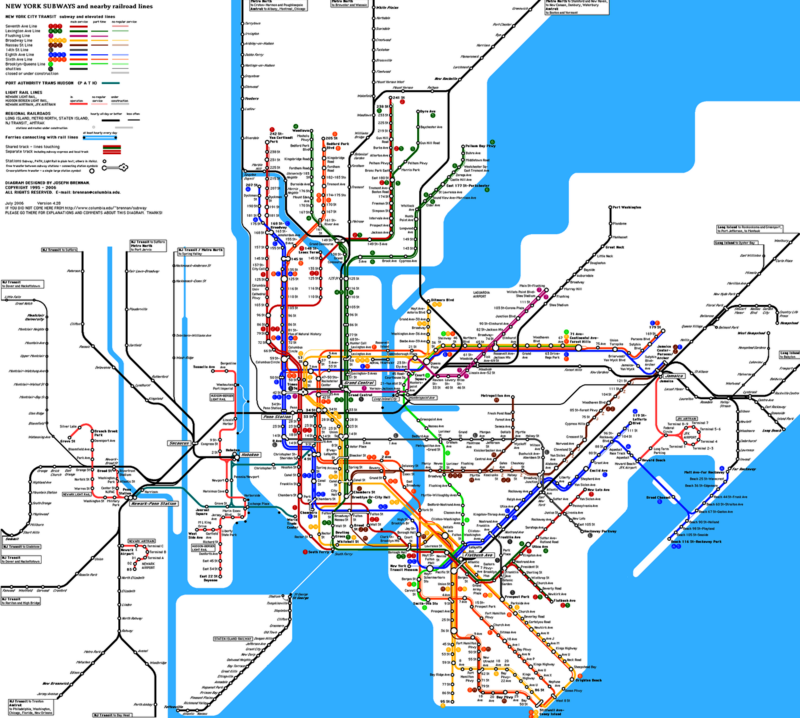 The network had become too big to be coherently represented geographically. 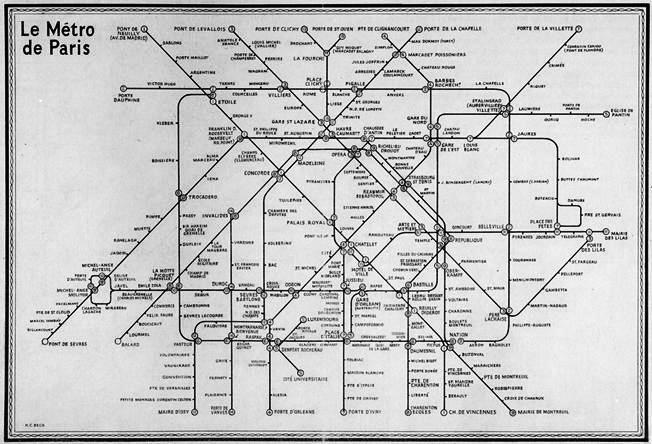 In 1931 Harry Beck, who worked for the Underground as an engineering draughtsman, proposed a radical solution. 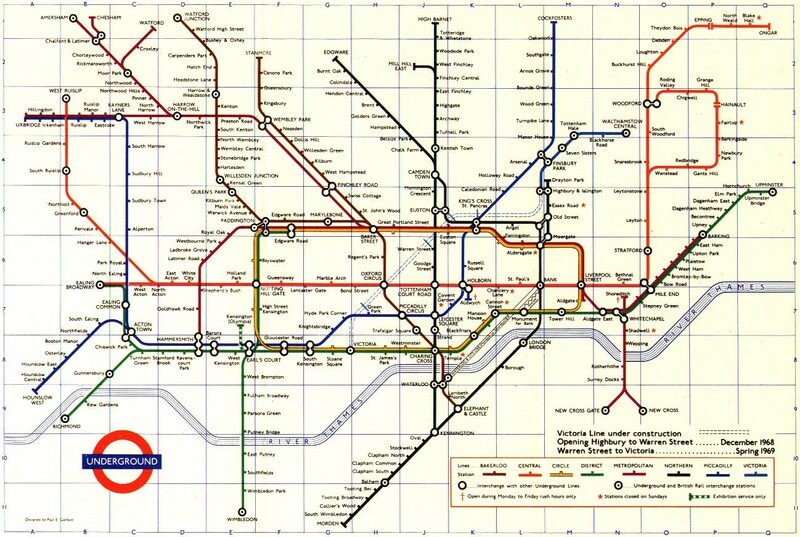 Beck based his diagram on a similar mapping system for underground sewage systems. 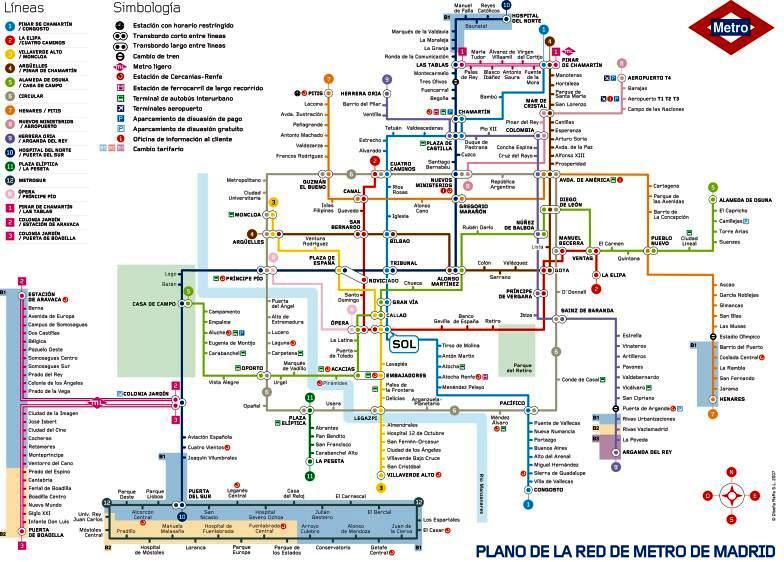 He designed a schematic map that did not rely on the street plan. 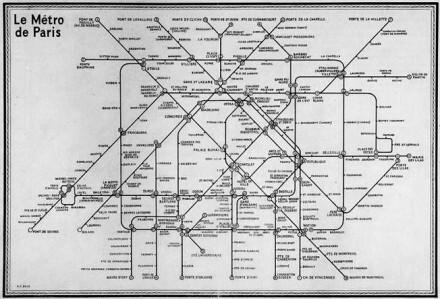 Beck realised that because the railway ran mostly underground, the physical locations of the stations were irrelevant to the traveller wanting to know how to get to one station from another — only the topology of the railway mattered. 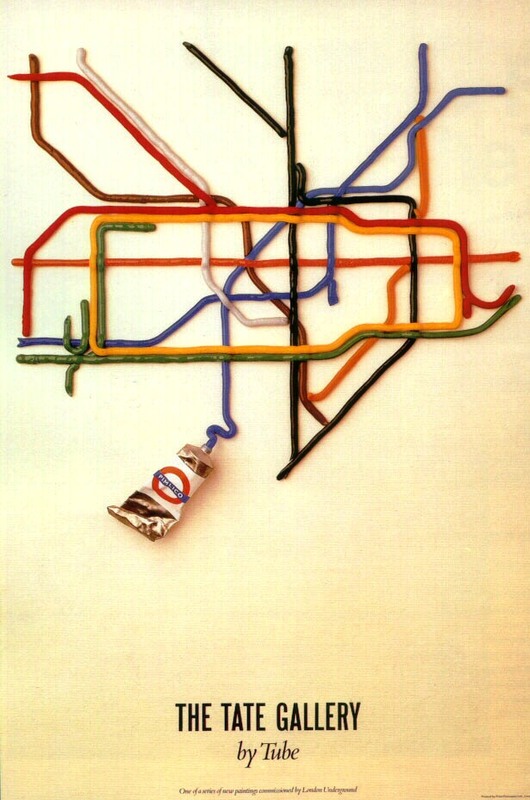 The Underground’s publicity department initially rejected Beck’s idea, thinking it too radical. 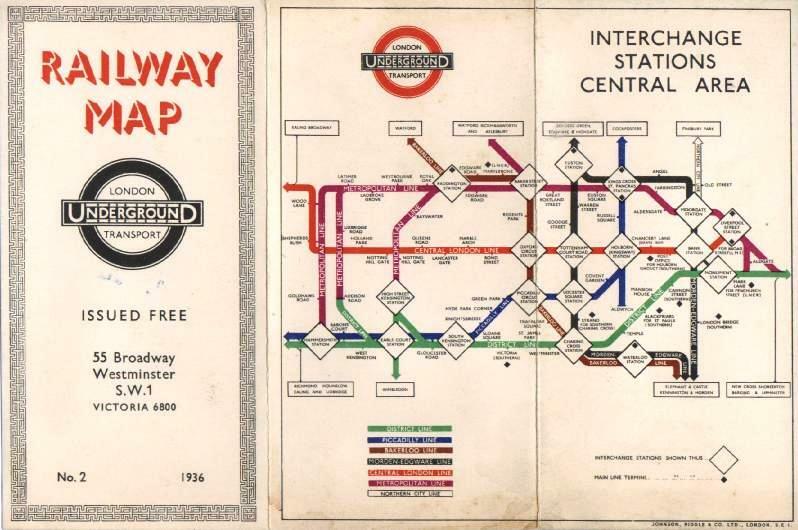 However, he resubmitted his designs after making a series of modifications, and a trial pocket map was published in 1933. 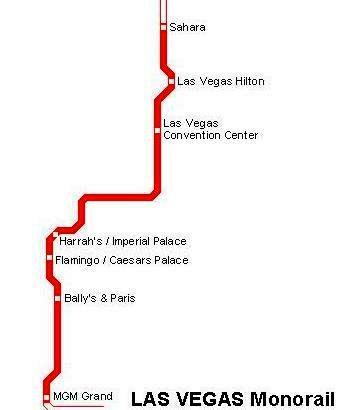 It was an instant success with the travelling public. 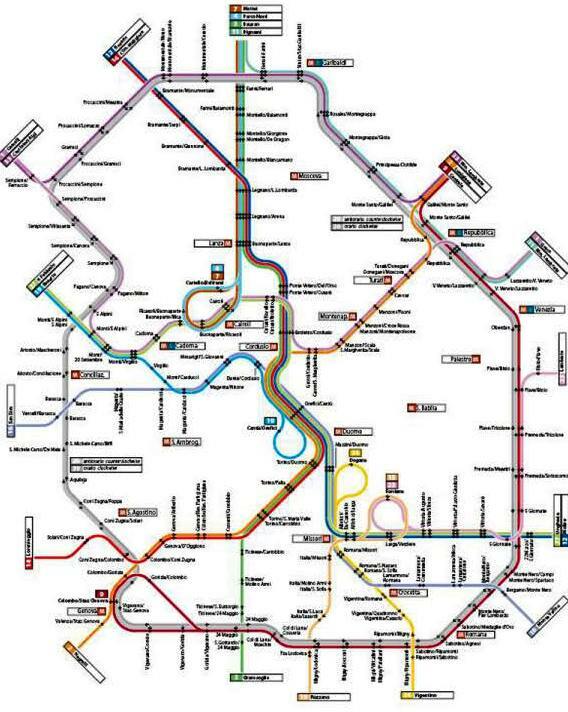 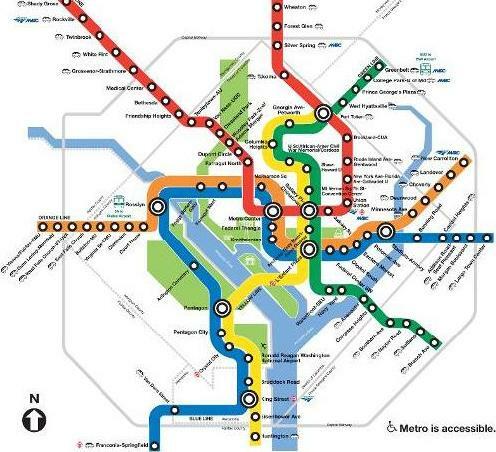 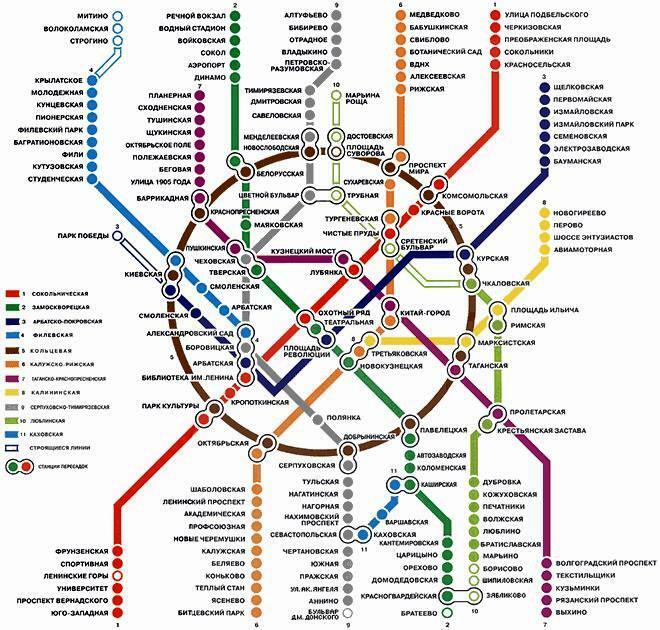 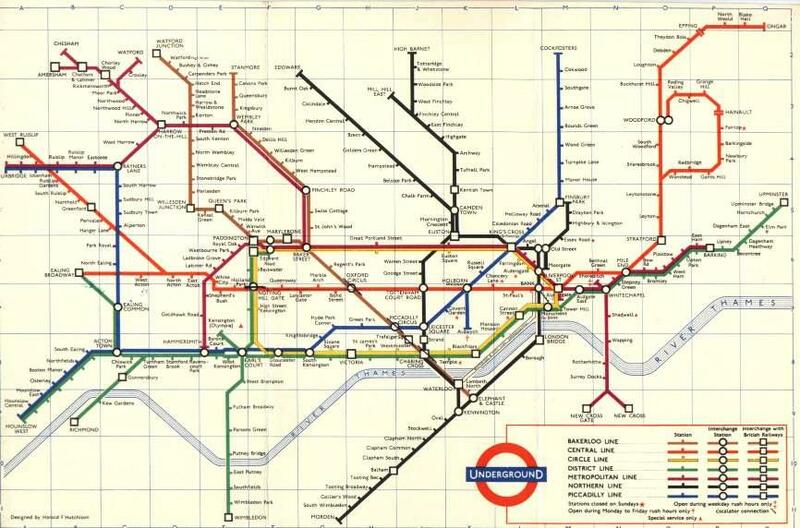 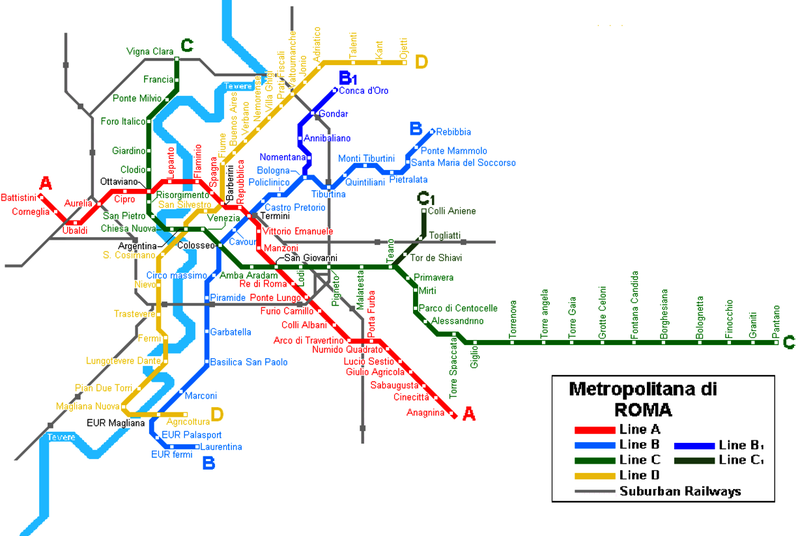 The Underground has used topological maps to illustrate the network ever since. 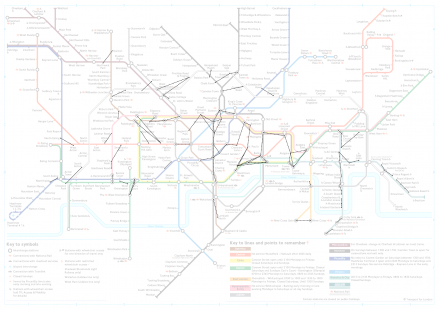 Harry Beck’s diagram of the 7+ lines of the London Underground, although geographically inaccurate, provides a coherent overview of a complex system. 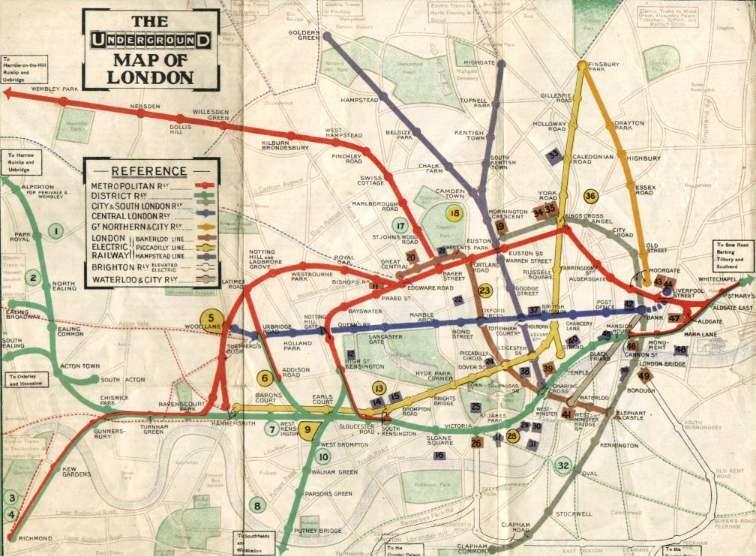 With excellent color printing, classic British railroad typography (by Edward Johnson), and, in the modern style, only horizontal, vertical, and 45 degree lines, the map became a beautiful organizing image of London. 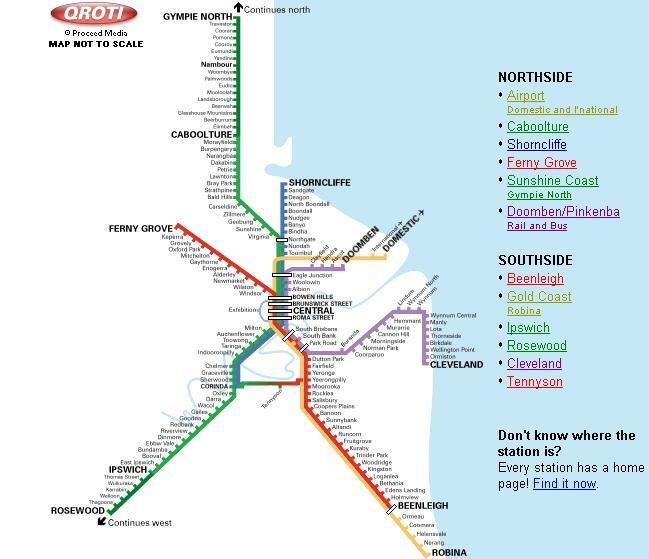 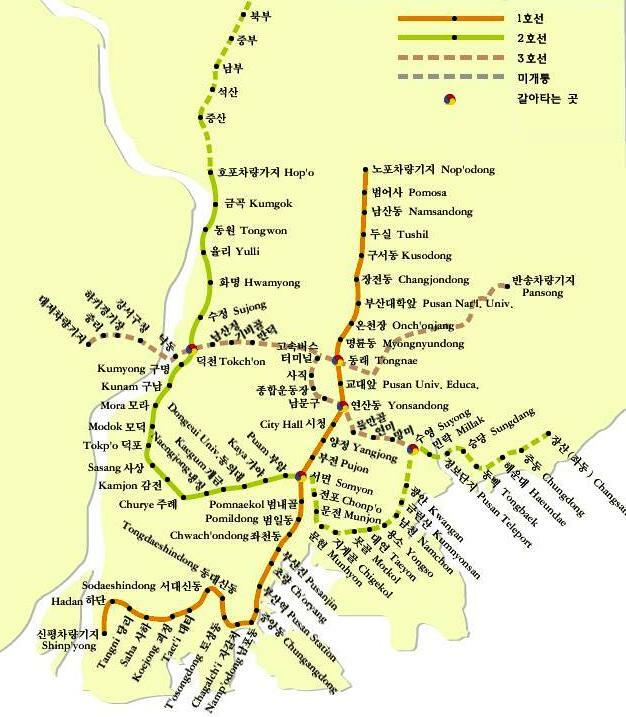 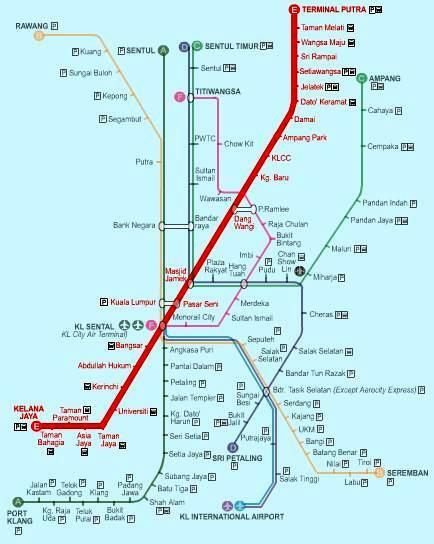 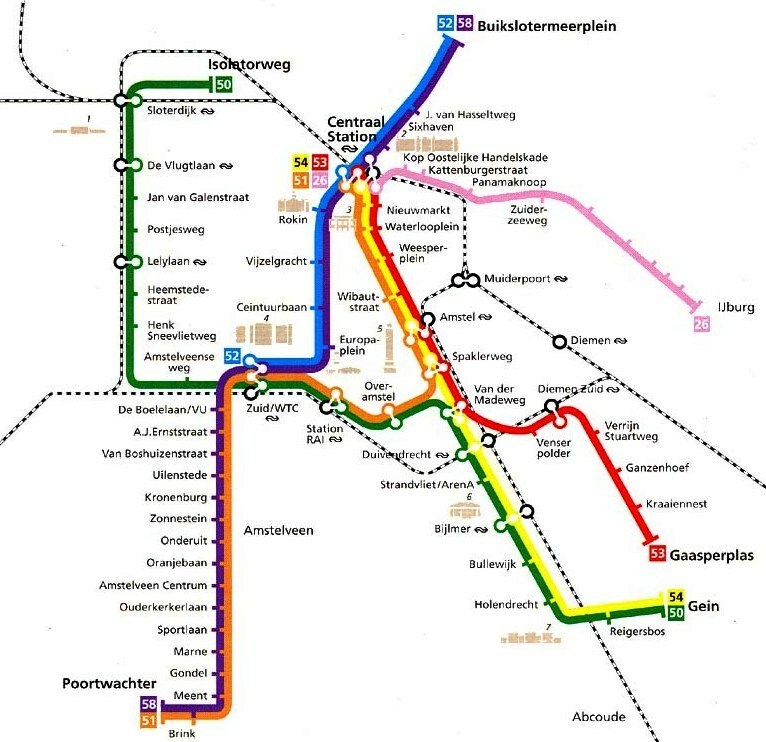 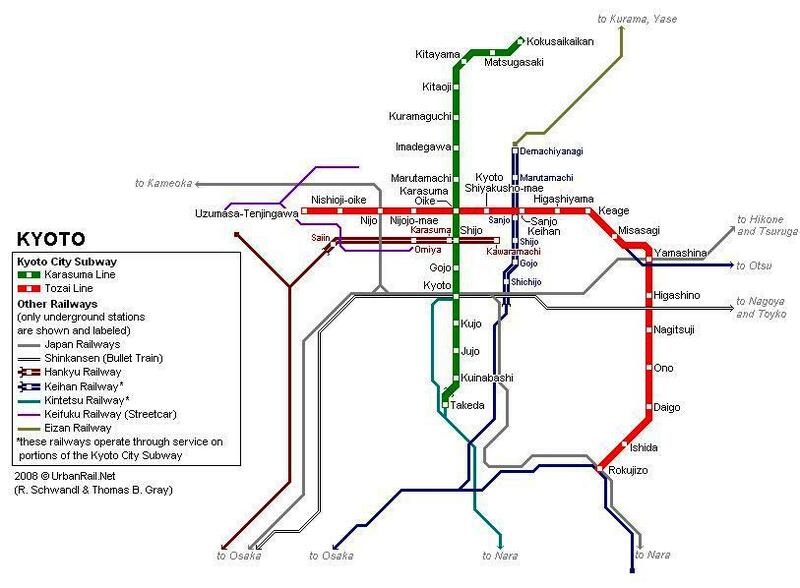 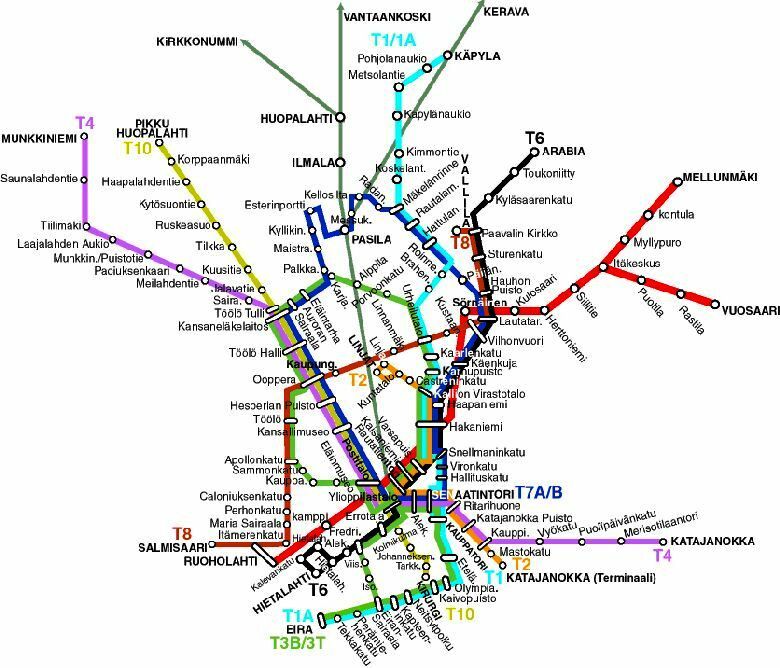 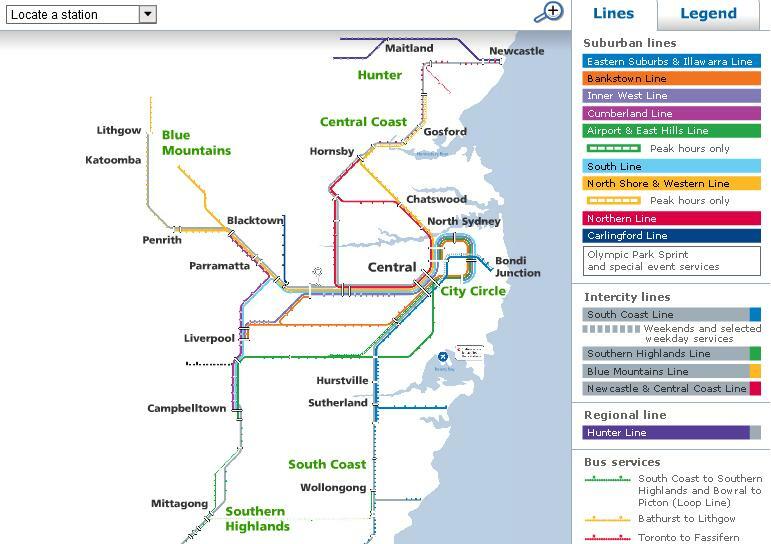 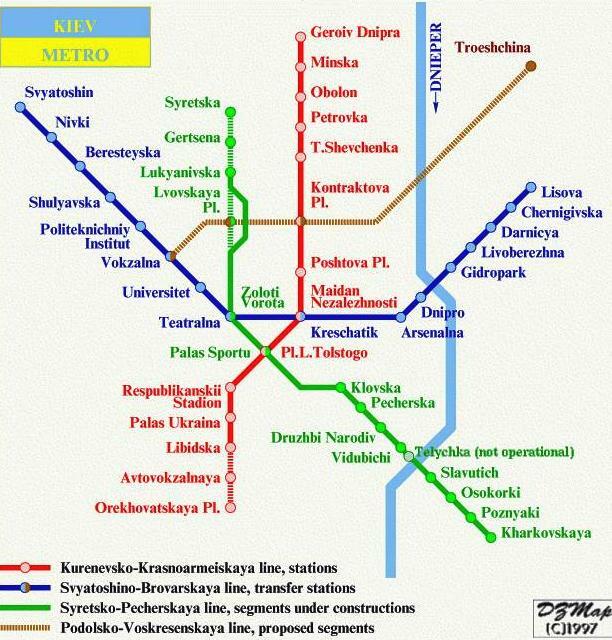 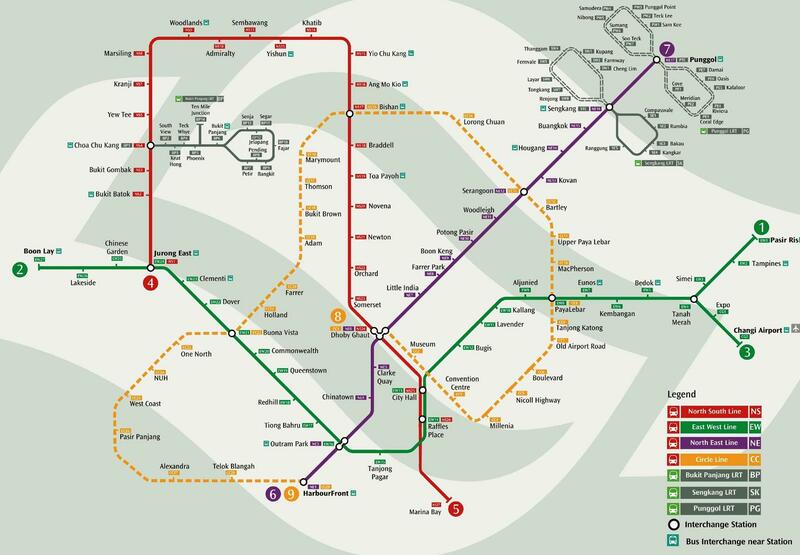 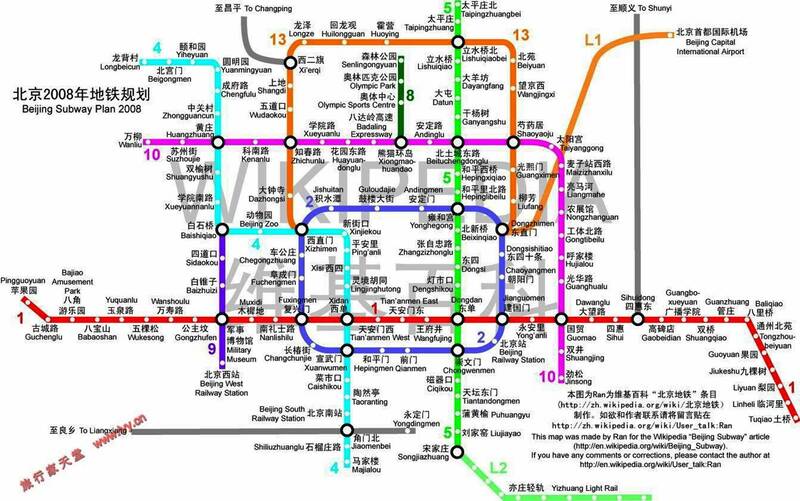 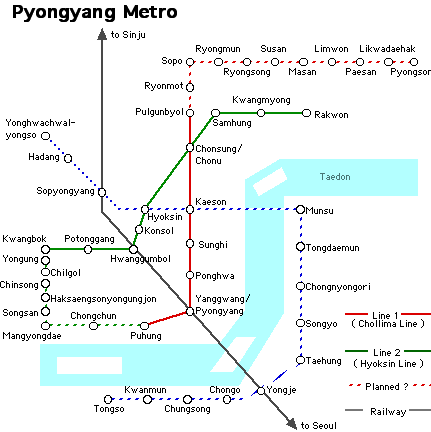 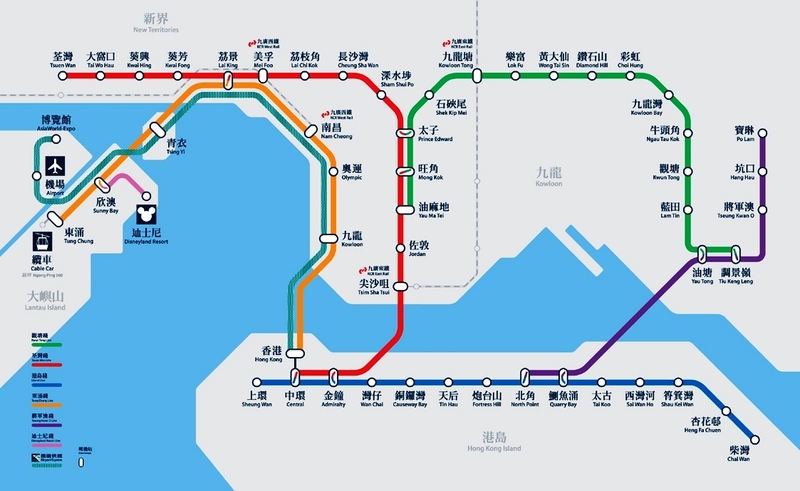 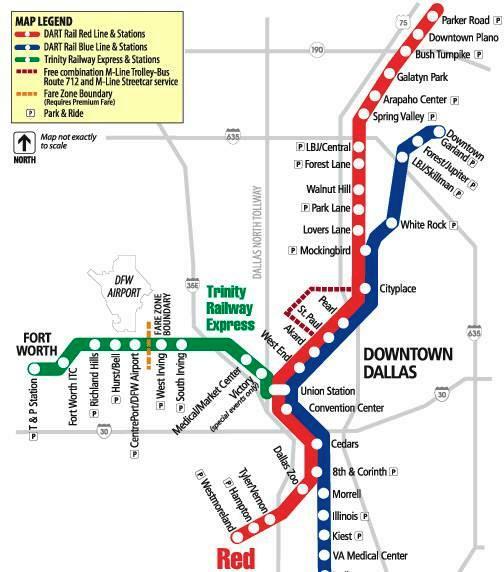 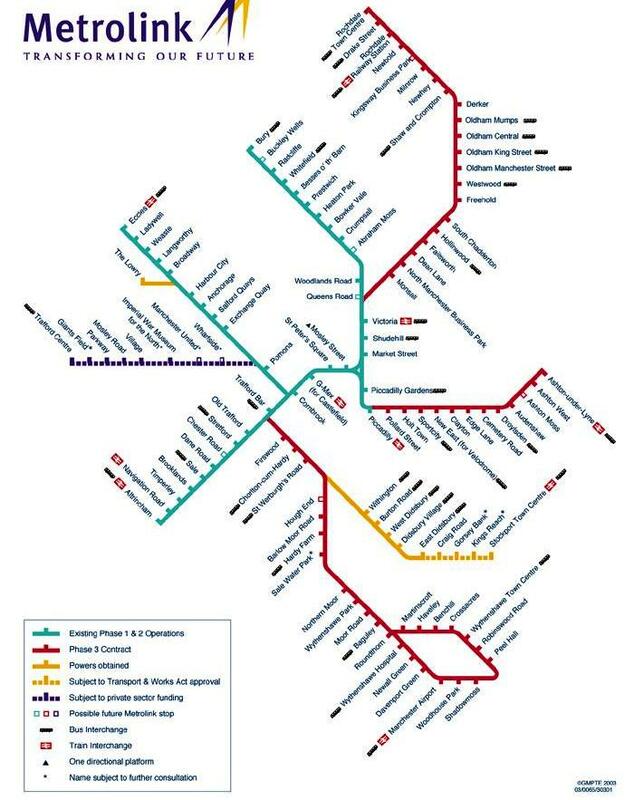 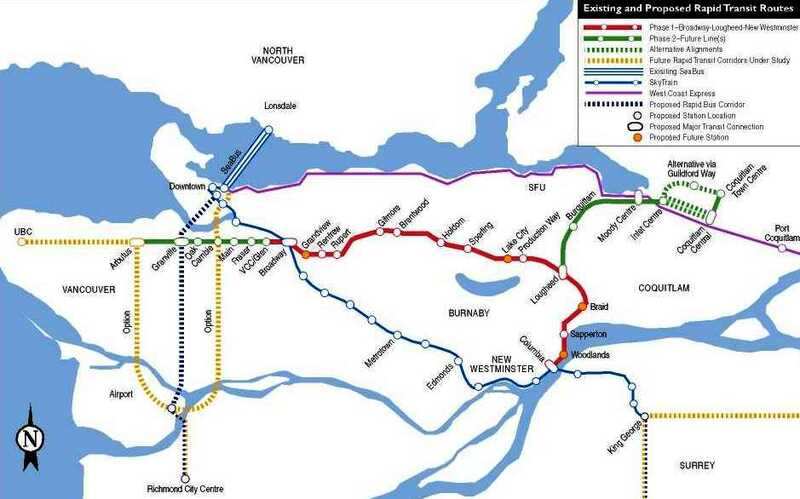 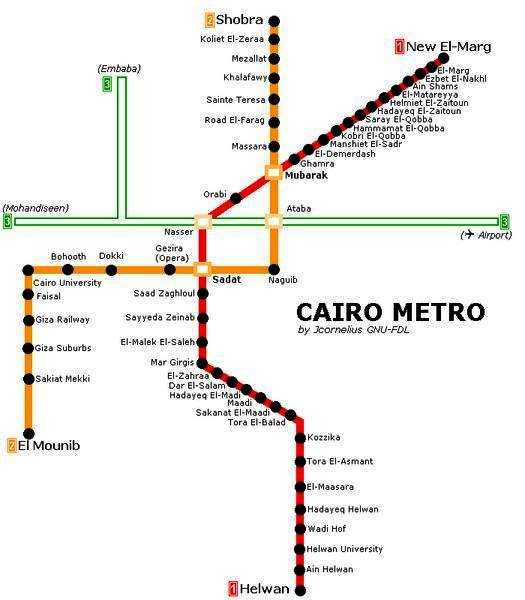 To make the map clearer and to emphasise connections, Beck differentiated between ordinary stations (marked with tick marks) and interchanges (marked with diamonds). 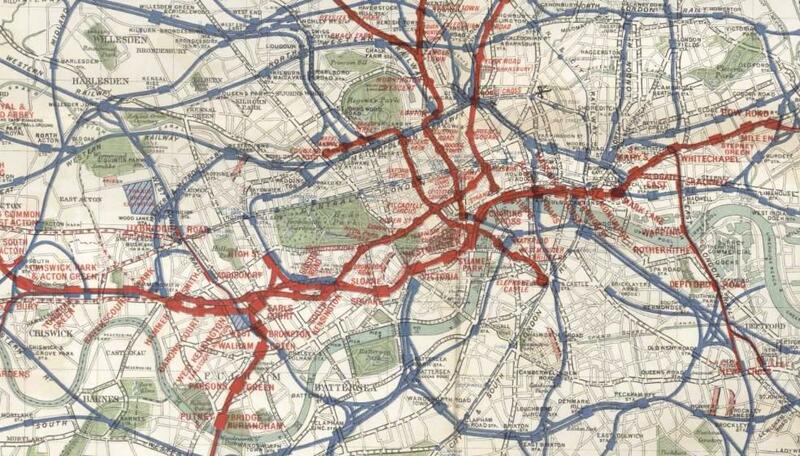 Beck continued to refine and update his map until 1960. 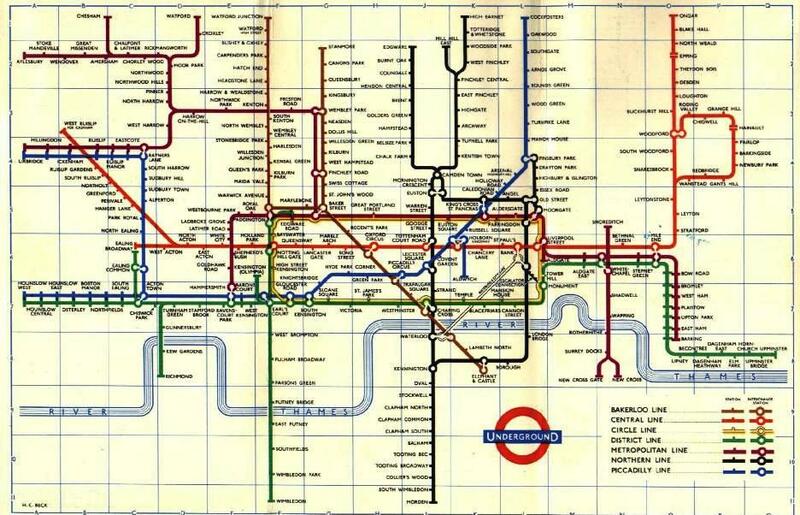 His revolutionary diagram remains the basis of London’s Underground map and has become internationally recognised as a design classic. Despite the complexity of making the map, Beck was paid just five guineas for the work. 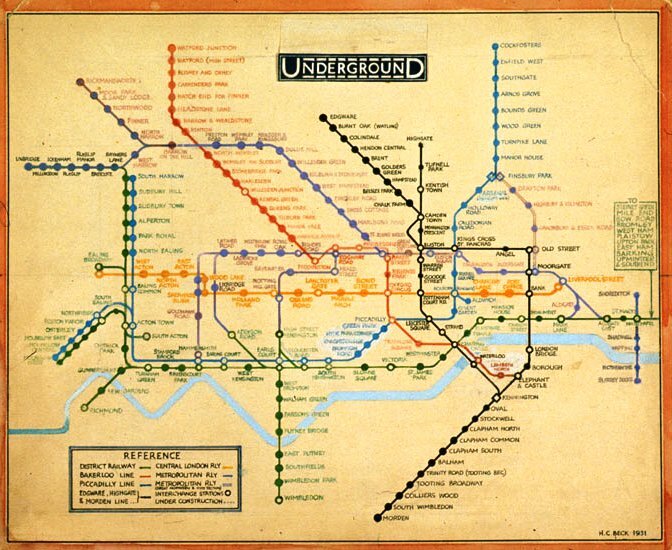 After its initial success, he continued to design the Underground map until 1960, a single (and unpopular) 1939 edition by Hans Scheger being the exception. 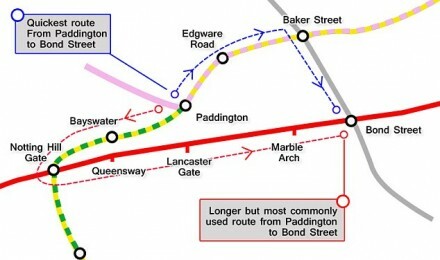 During this time, as well as accommodating new lines and stations, Beck continually altered the design, for example changing the interchange symbol from a diamond to a circle, as well as altering the line colours – the Central Line from orange to red, and the Bakerloo Line from red to brown. 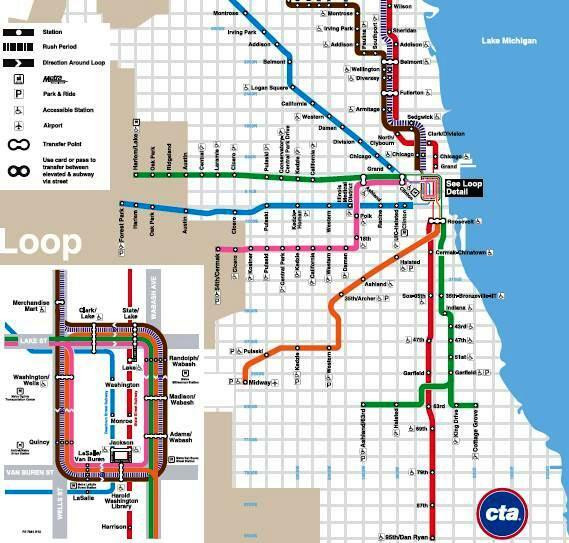 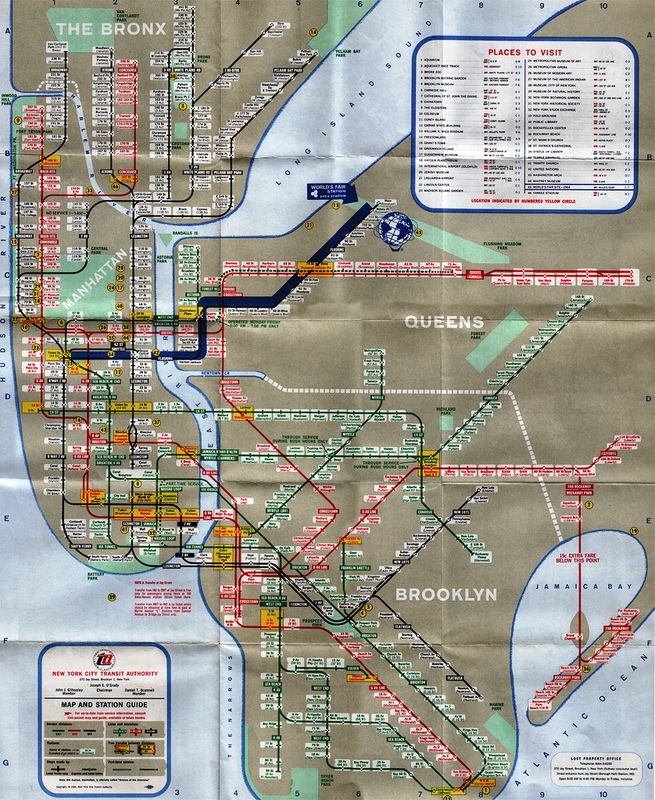 Beck’s final design, in 1960, bears a strong resemblance to modern-day maps. 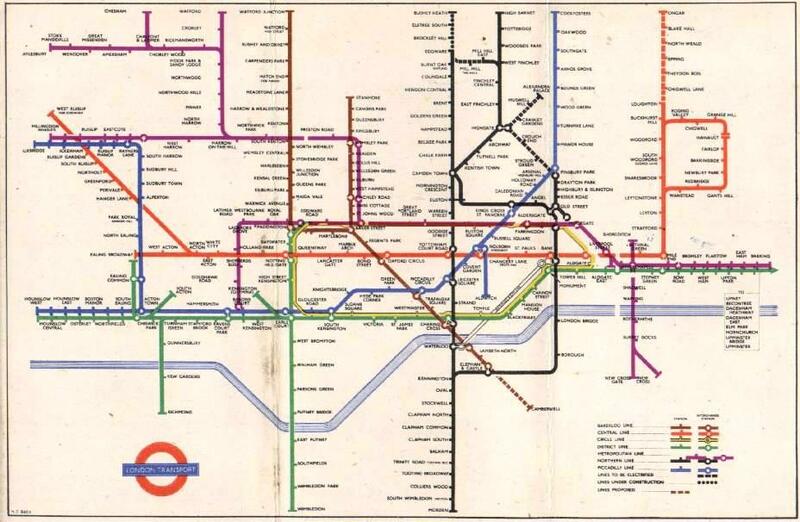 Beck lived in Finchley, and one of his maps is still preserved on the southbound platform at Finchley Central station on the Northern Line. 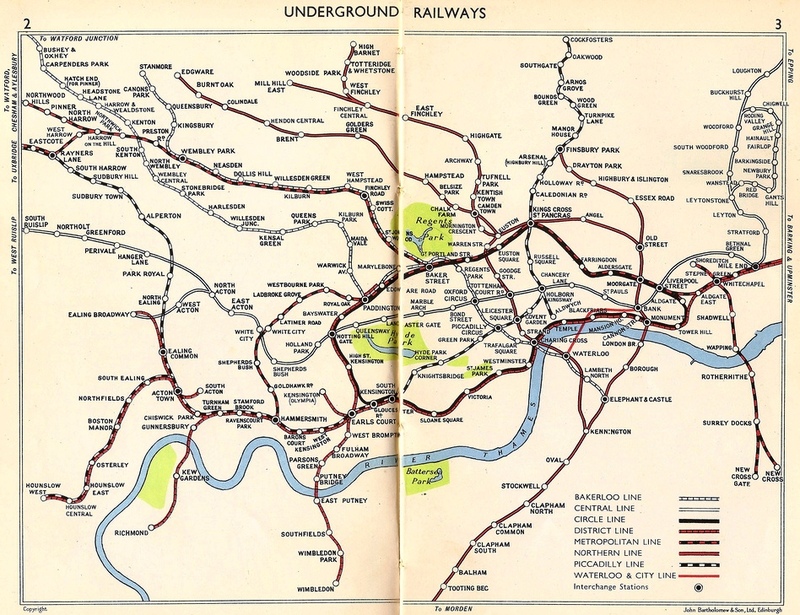 This meant that the central area of London with the most stations could be enlarged, and the outlying areas with fewer stations could be compressed. 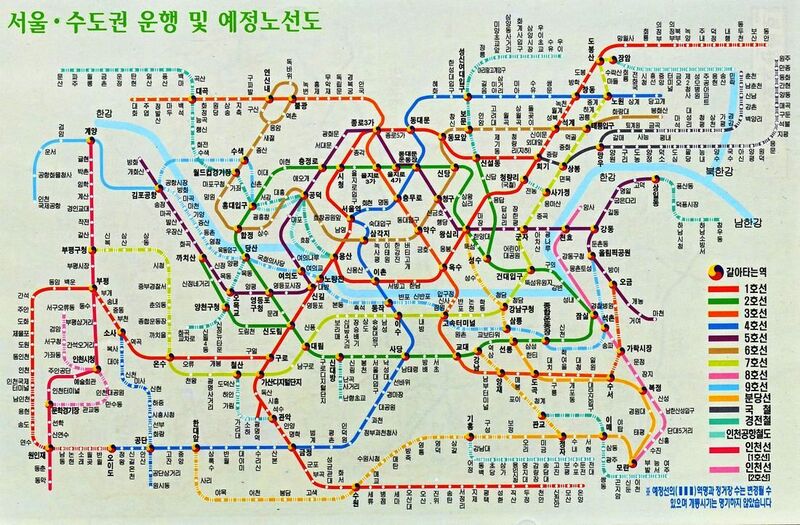 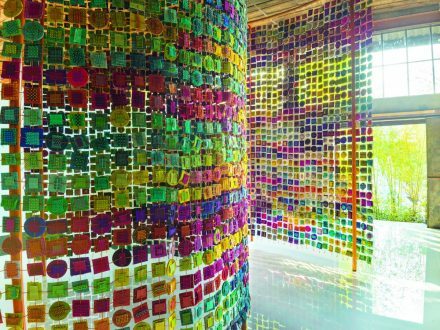 Each line had a different colour and routes were drawn only horizontally, vertically, or at 45°. 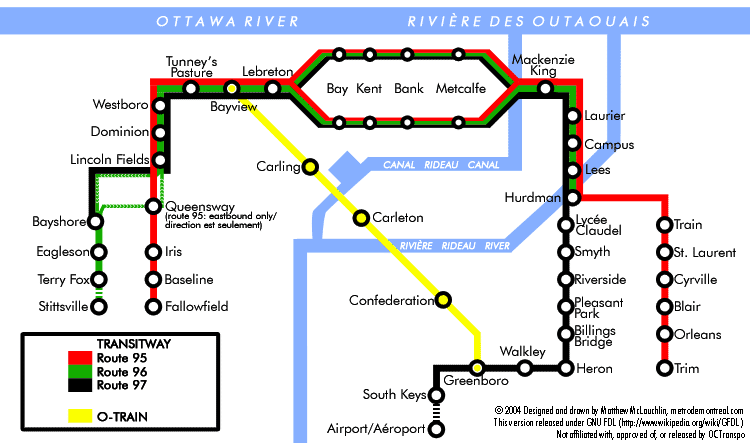 Stations were represented as dots, and interchanges as circles and diamonds. 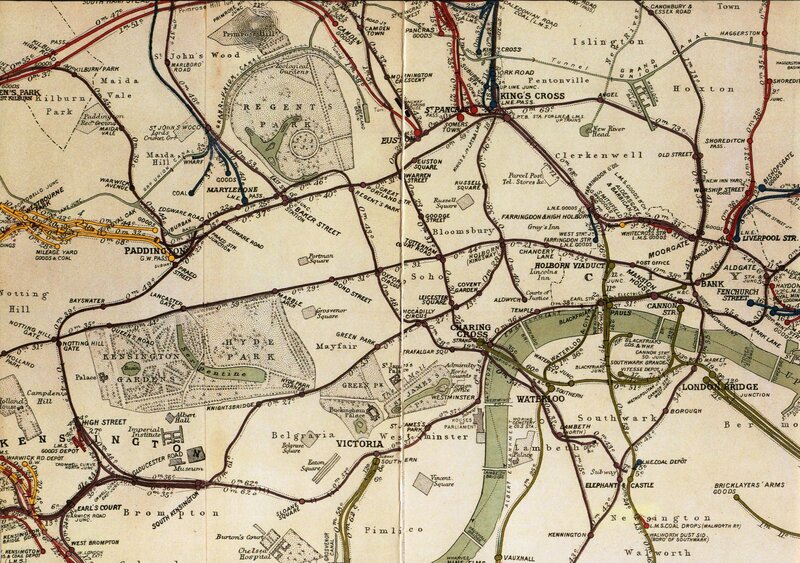 For apparently quite a number of people, the map organized London (rather than London organizing the map). 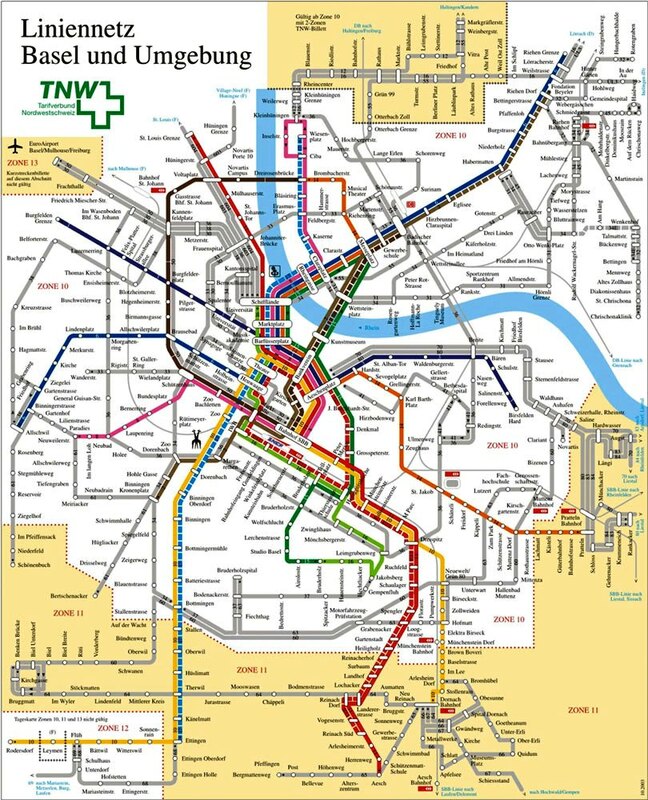 Despite 70 years of revision due to extensions of the Underground and bureaucratic tinkering (the marketing department wrecked the map for several years), the map nicely survives to this day. 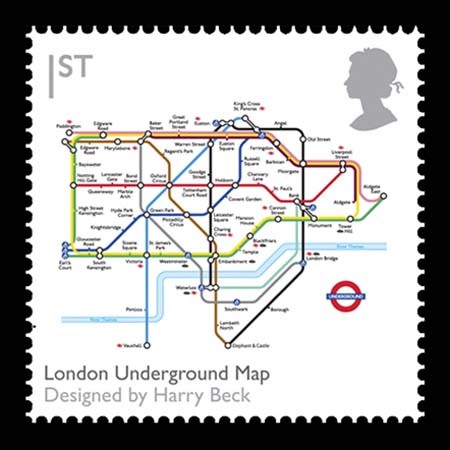 By 1960, Beck had fallen out with the Underground’s publicity officer, Harold Hutchinson. 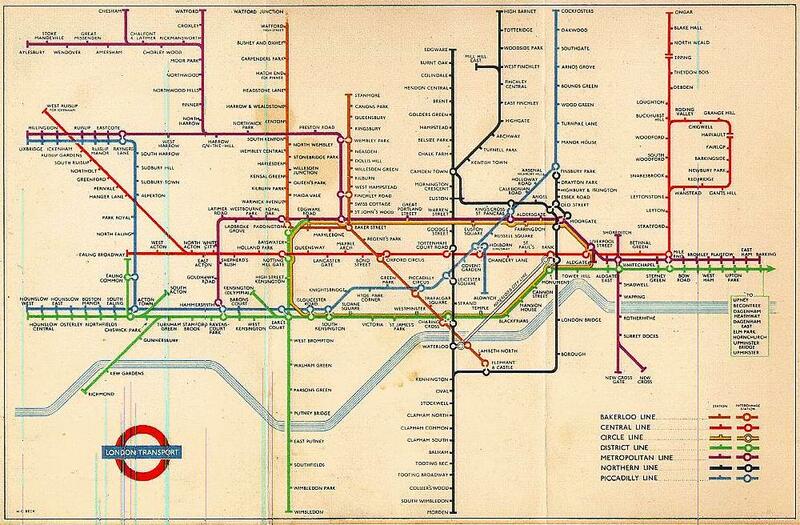 Hutchinson, though not a designer himself, drafted his own version of the Tube map in 1960. 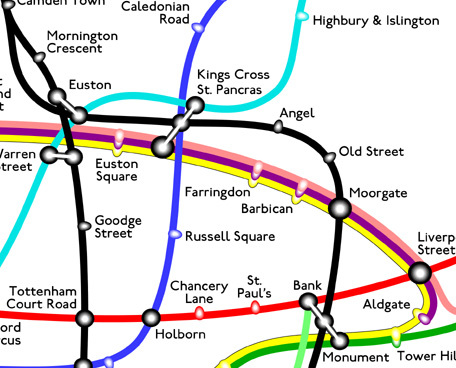 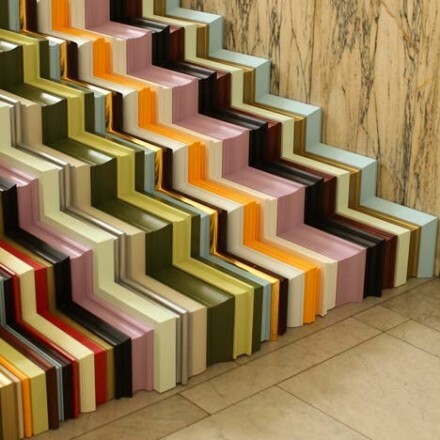 It removed the smoothed corners of Beck’s design and created some highly cramped areas (most notably, around Liverpool Street station); in addition, lines were generally less straight. However, Hutchinson also introduced interchange symbols (circles for Underground-only, squares for interchanges with British Rail) that were black and allowed multiple lines through them, as opposed to Beck who used one circle for each line at an interchange, coloured according to the corresponding line. 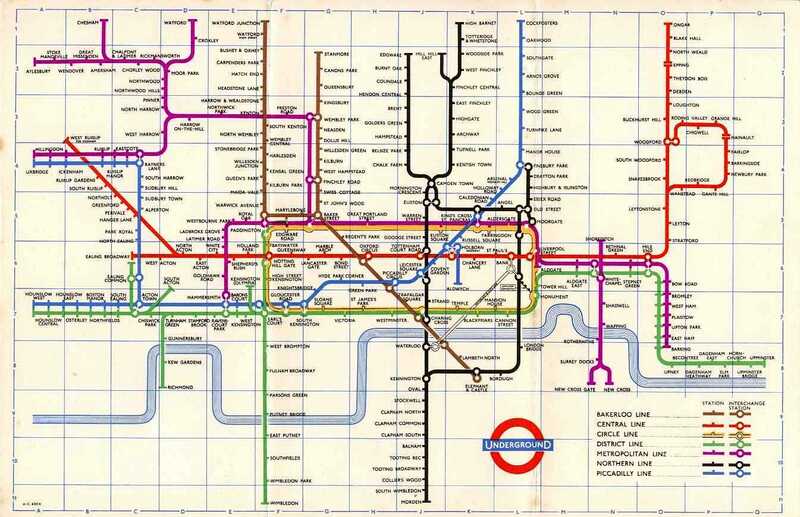 In 1964, the design of the map was taken over by Paul Garbutt, who, like Beck, had produced a map in his spare time due to his dislike of the Hutchinson design. 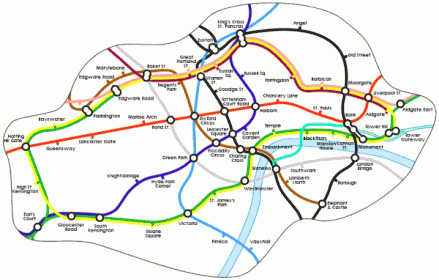 Garbutt’s map restored curves and bends to the diagram, but retained Hutchinson’s black interchange circles (the squares however were replaced with circles with a dot inside). 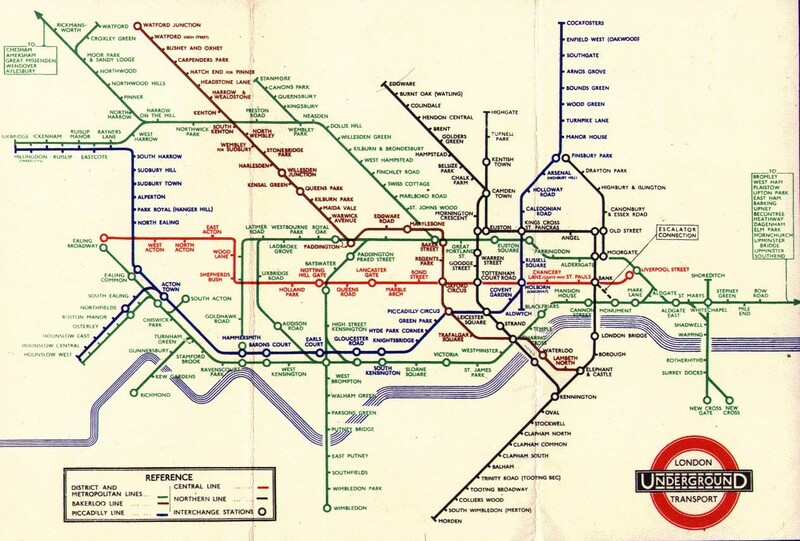 Garbutt continued to produce Underground maps for at least another 20 years — Tube maps stopped bearing the designer’s name in 1986, by which time the elements of the map bore a very strong resemblance to today’s map. 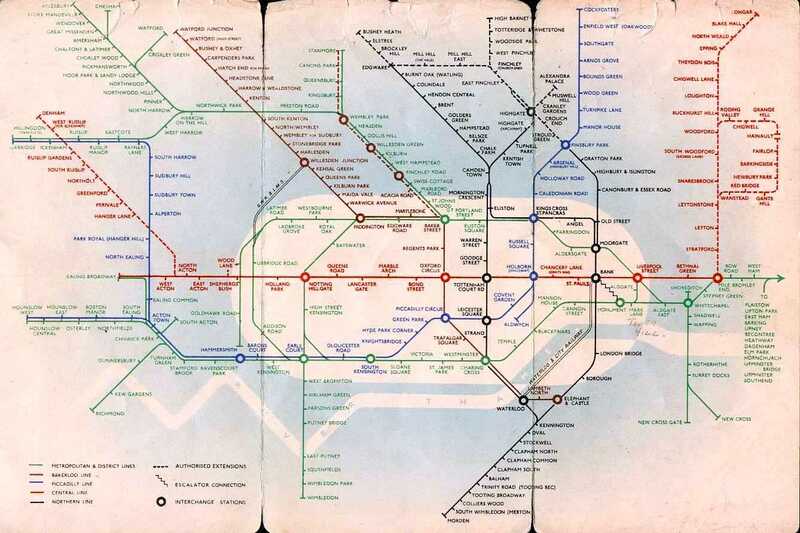 Today, the map bears the legend “This diagram is an evolution of the original design conceived in 1931 by Harry Beck” in the lower right-hand corner. 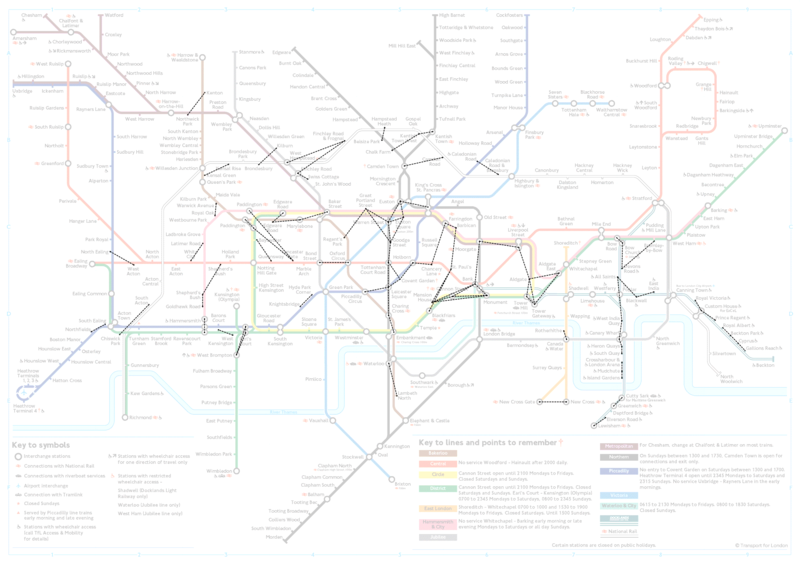 While the standard Tube map mostly avoided representing main-line rail services, a new variant of the map issued in 1973, the “London’s Railways” map, was the first to depict Tube and surface rail services in a diagrammatic style closely matched to Beck’s designs. 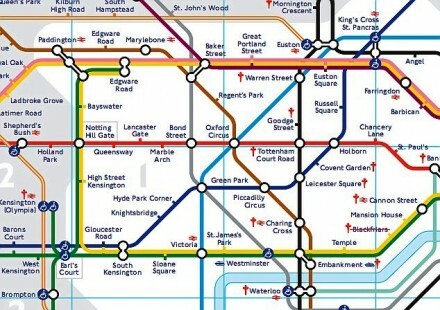 It was designed by Tim Demuth of the LT publicity office and was jointly sponsored by British Rail and London Transport. 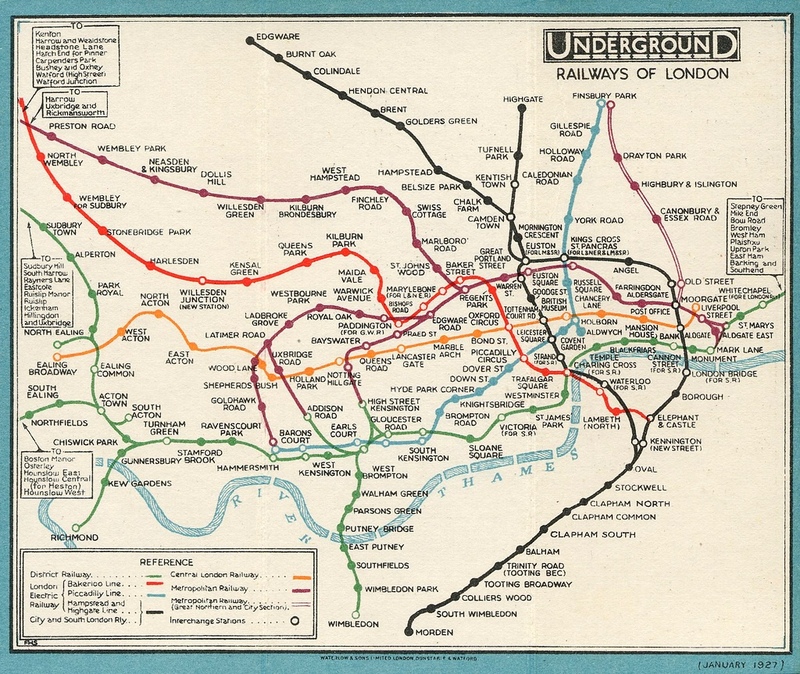 This map did not replace the standard Tube map, but continued to be published as a supplementary resource, later known as the “London Connections” map. 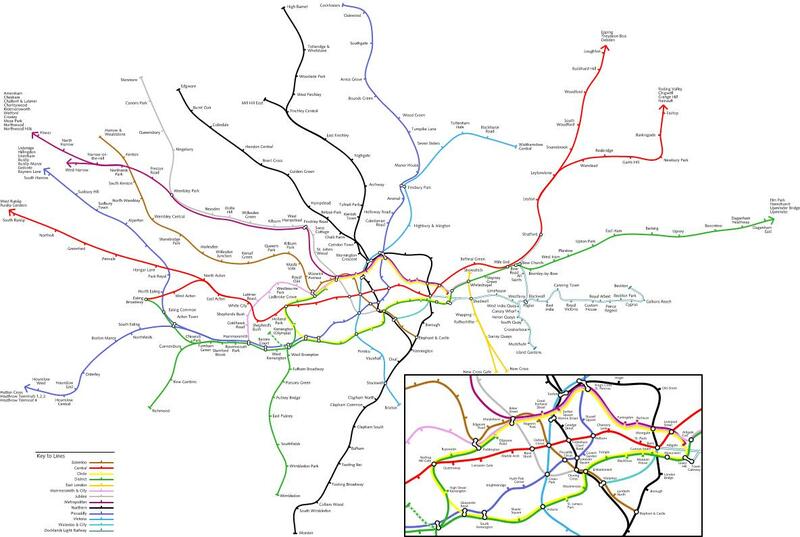 Alterations have been made to the map over the years. 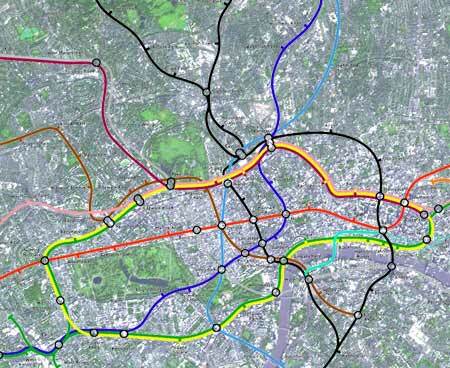 Recent designs have incorporated changes to the network, such as the Docklands Light Railway and the Jubilee Line Extension. 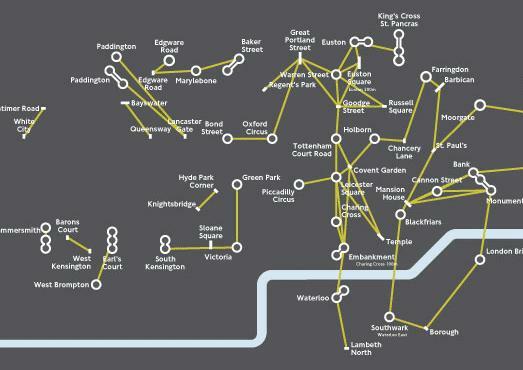 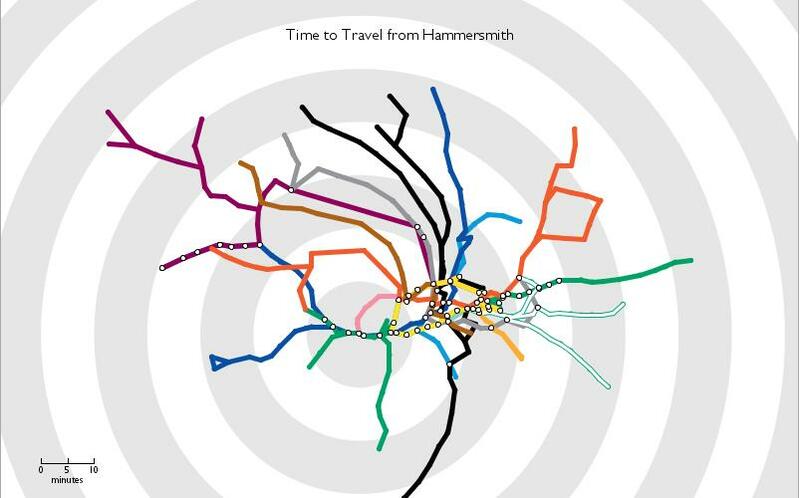 The map also includes major rail lines used for journeys within London, such as London Overground. 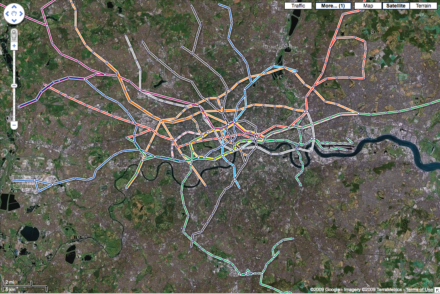 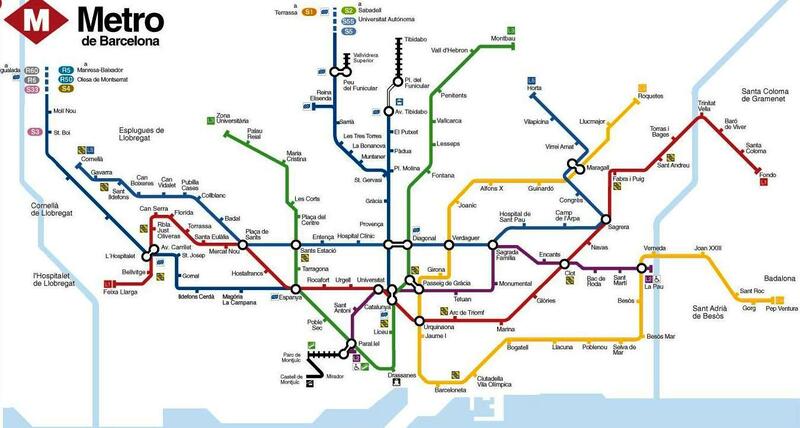 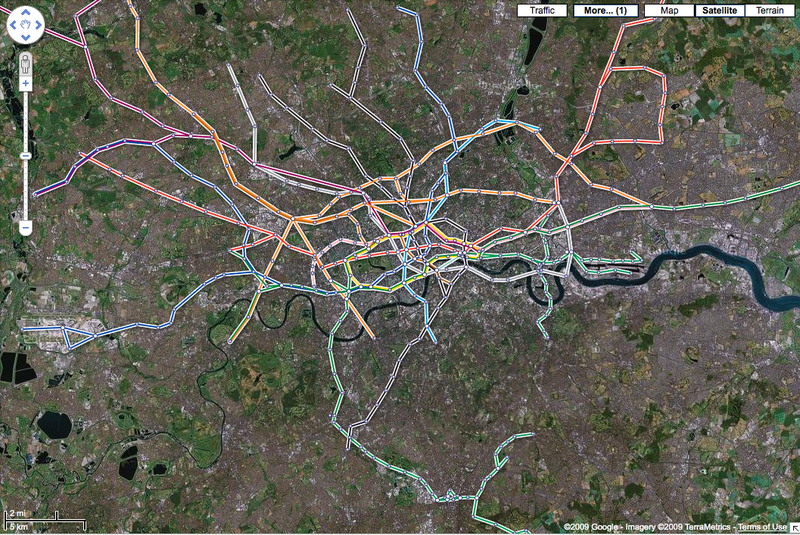 It also shows Tube stops with access to national rail stations, rail links to airports, and river boats. 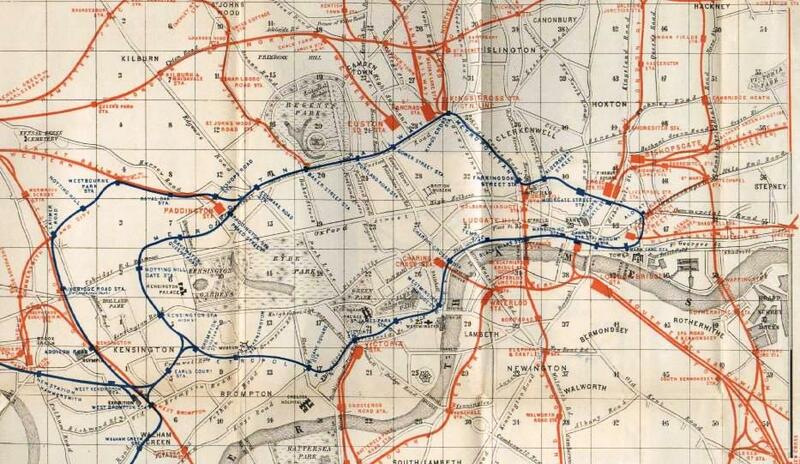 Stations that can be walked between are now shown, often with the distance between them (this is an evolution of the pedestrian route between Bank and Monument stations, which was once prominently marked on the map). 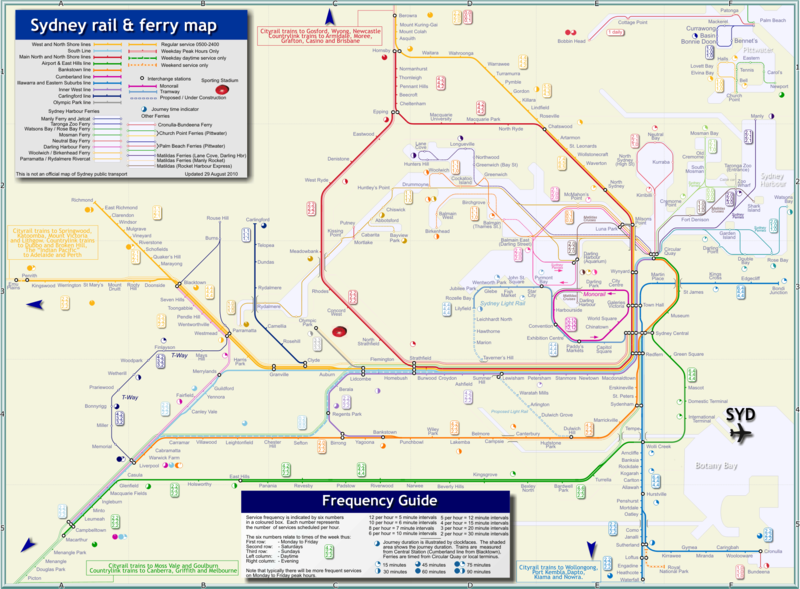 Further, step-free access notations are also incorporated in the map. 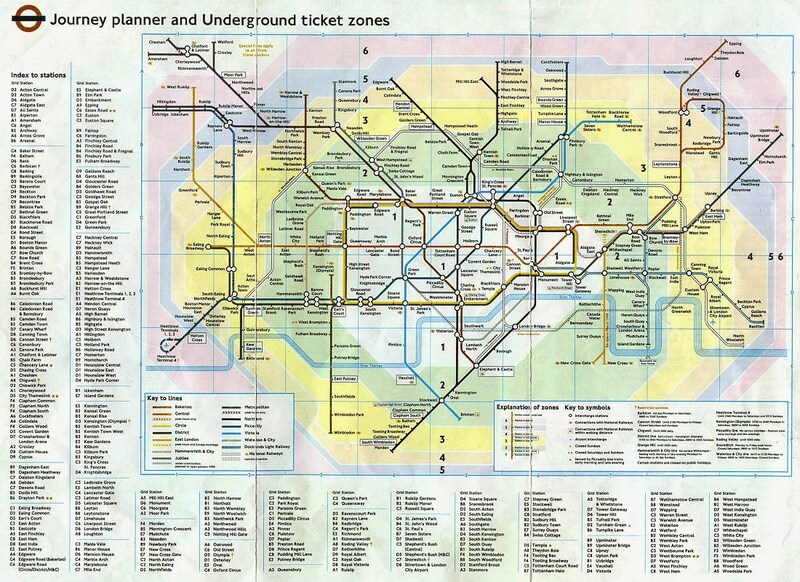 In addition, since 2002 the Underground ticket zones have been added, to better help passengers judge the cost of a journey. 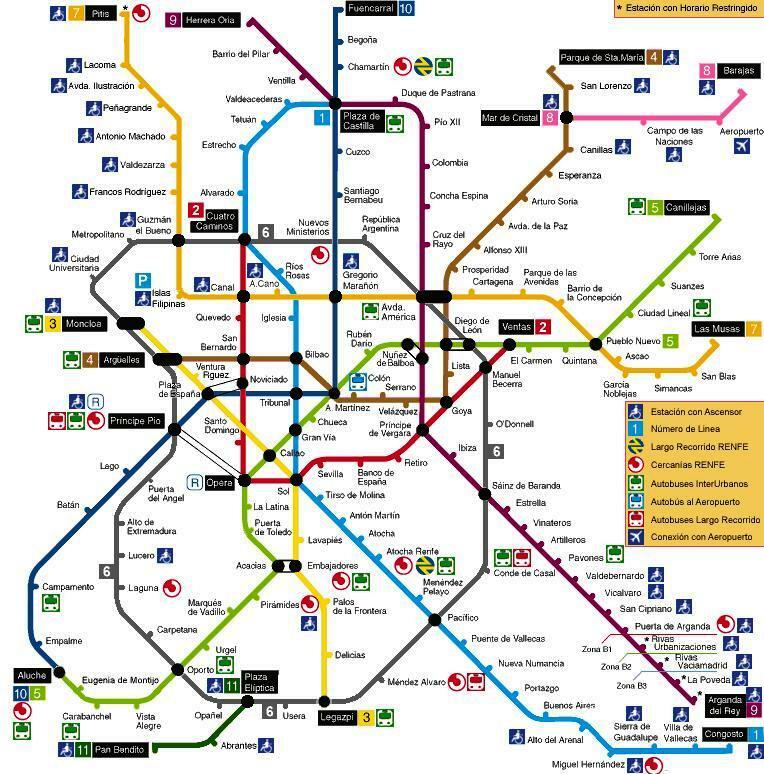 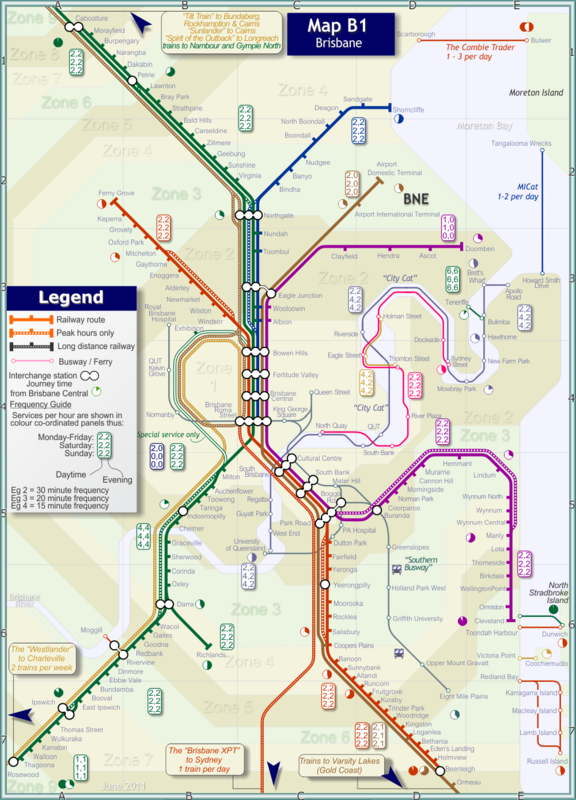 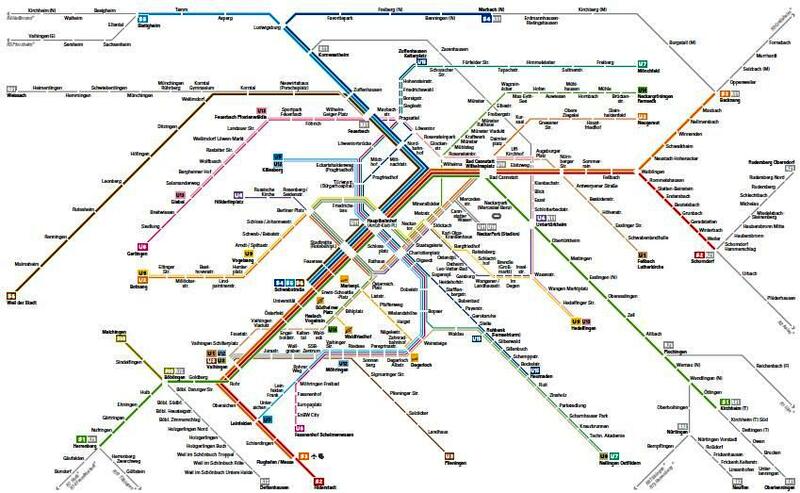 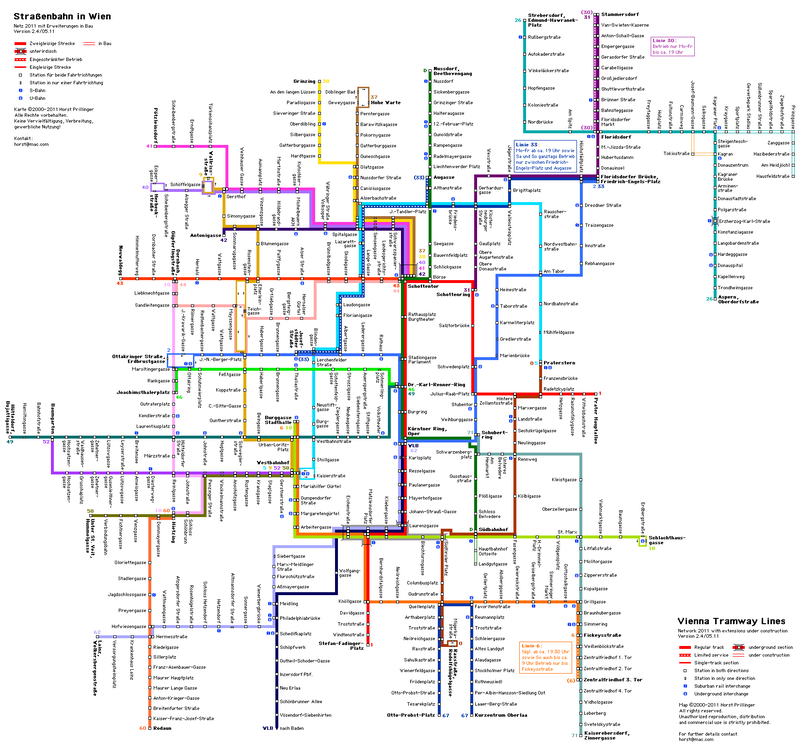 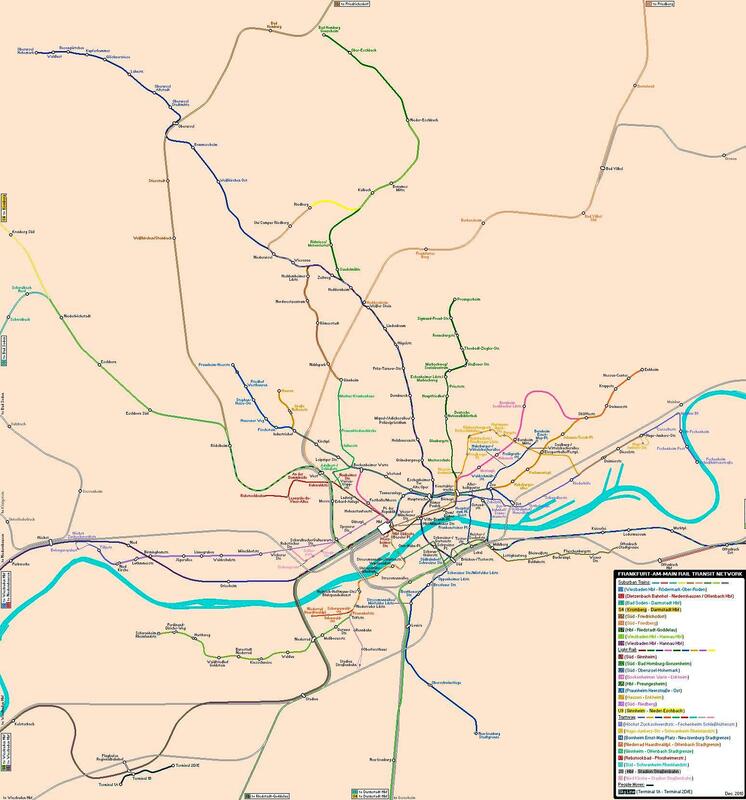 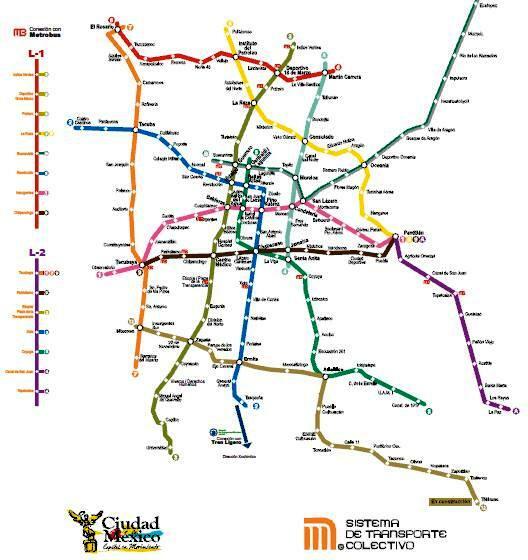 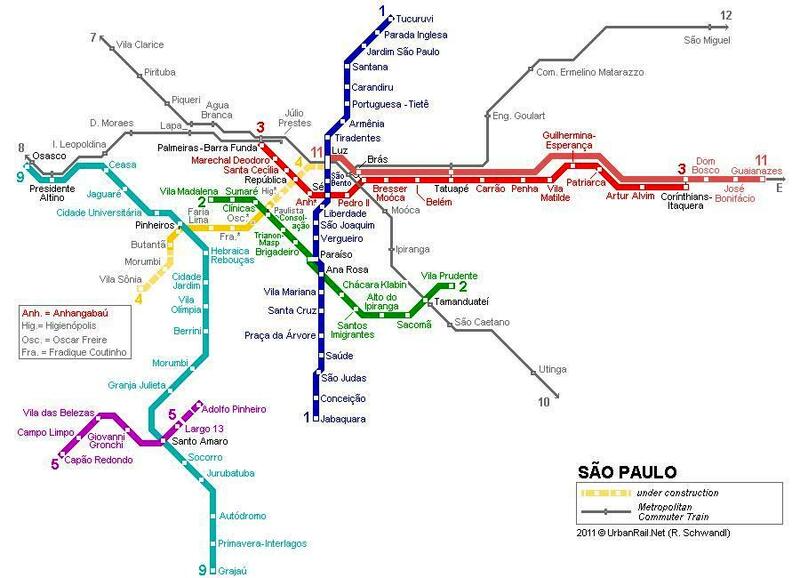 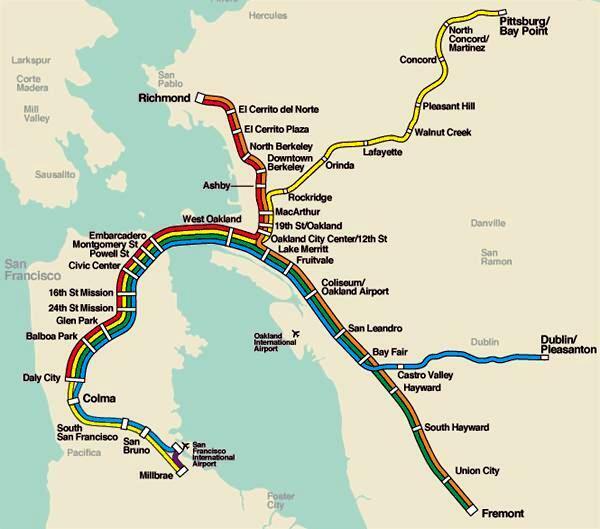 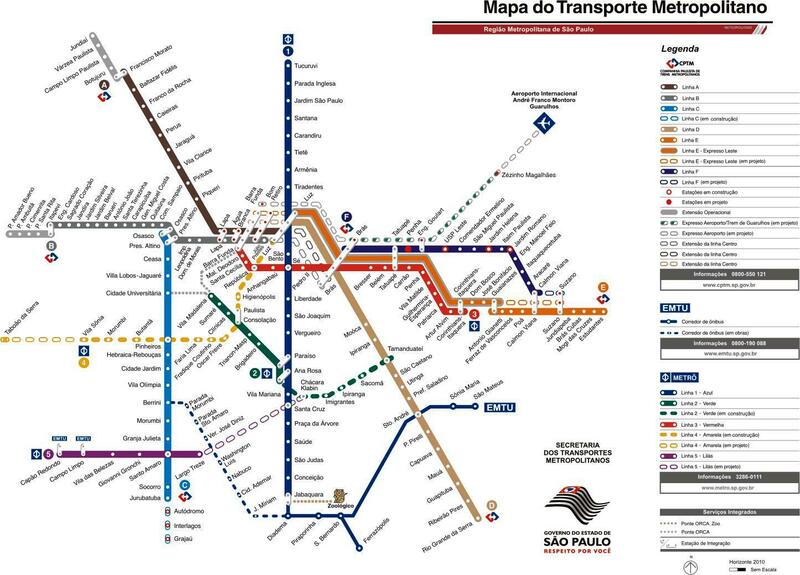 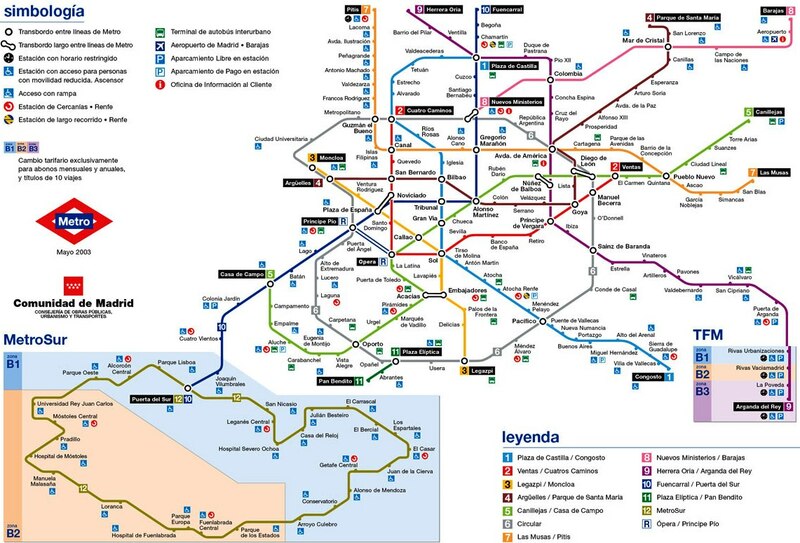 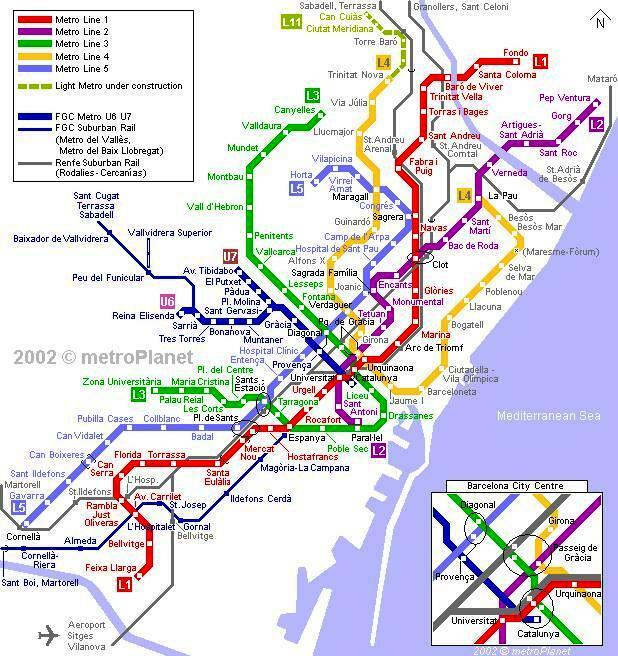 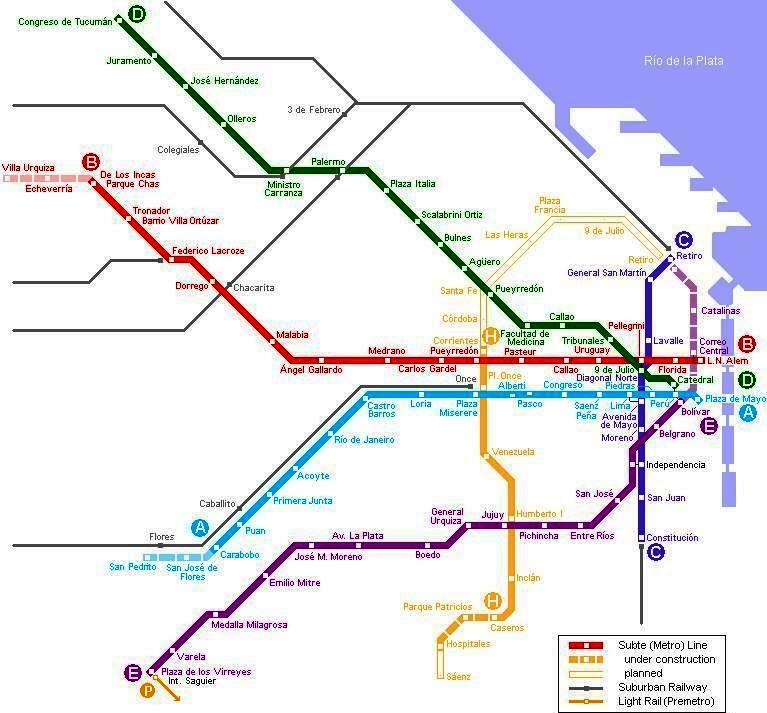 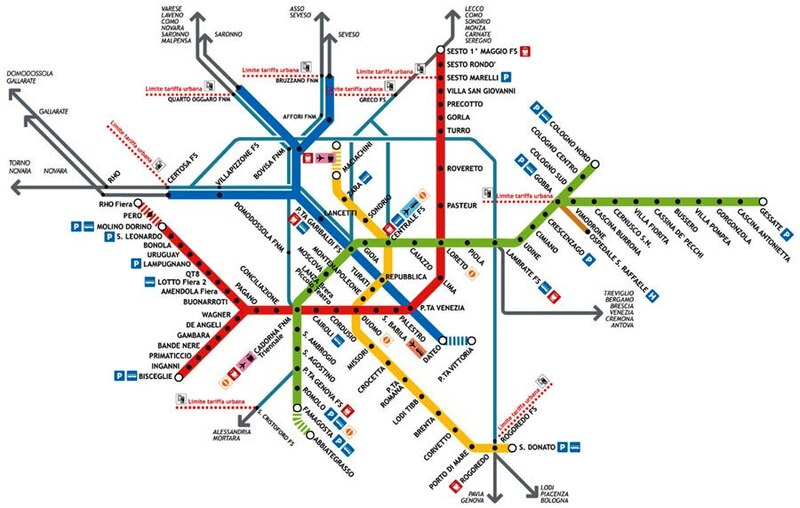 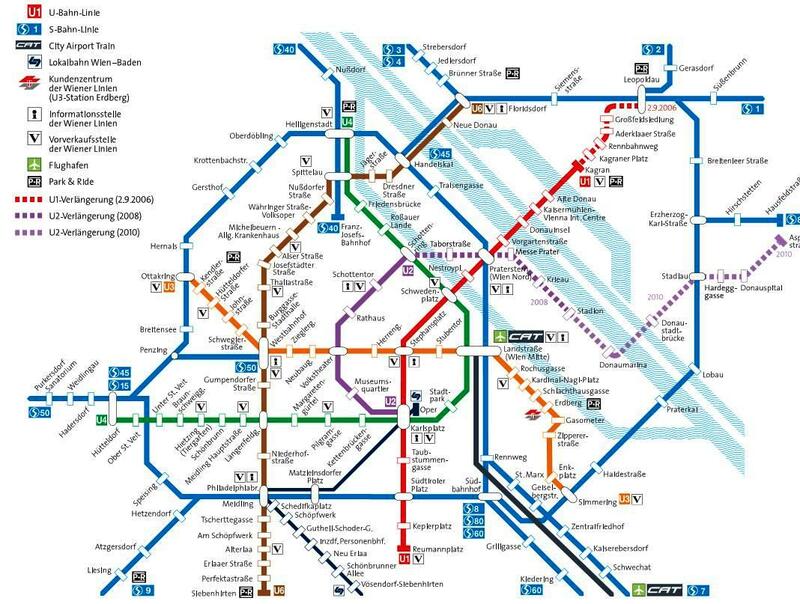 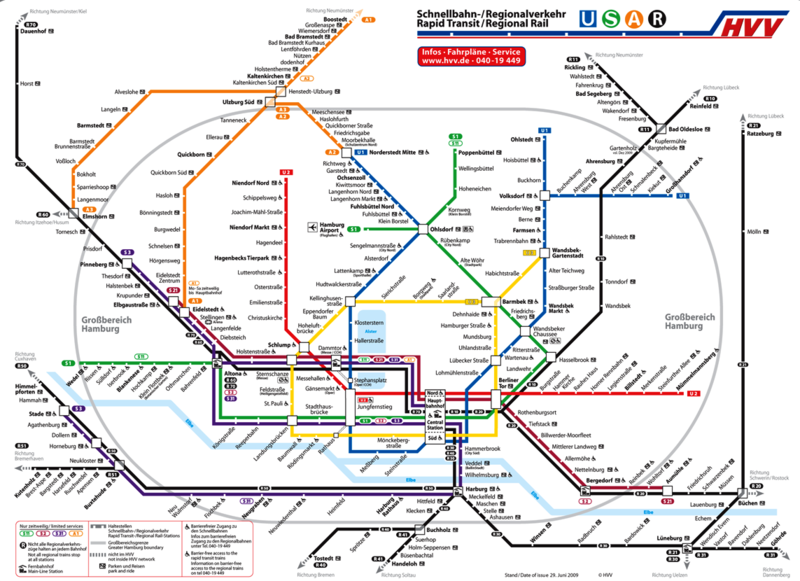 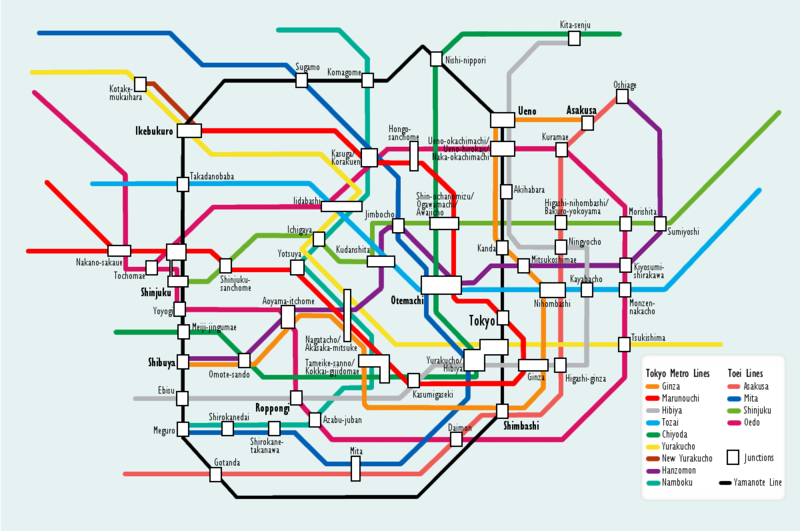 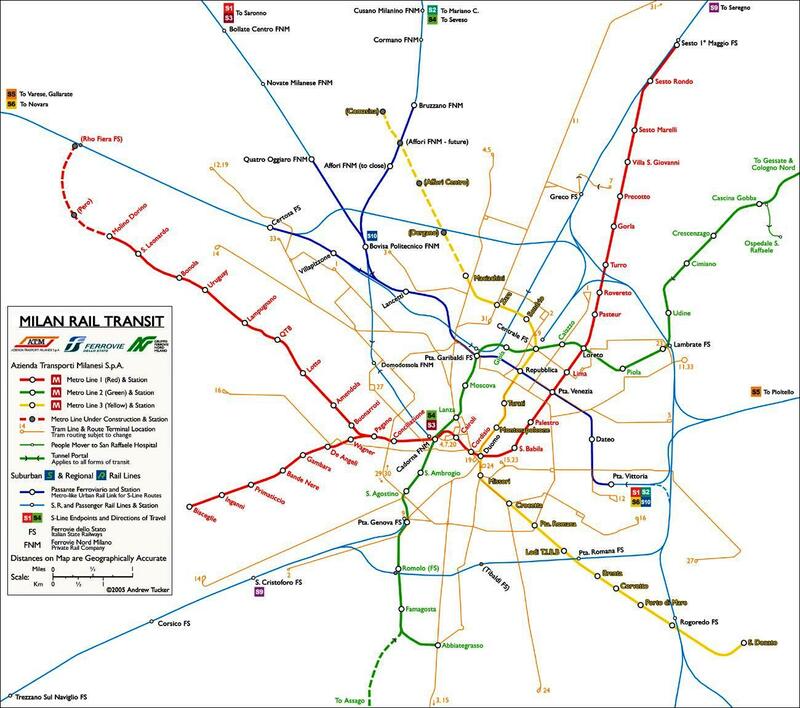 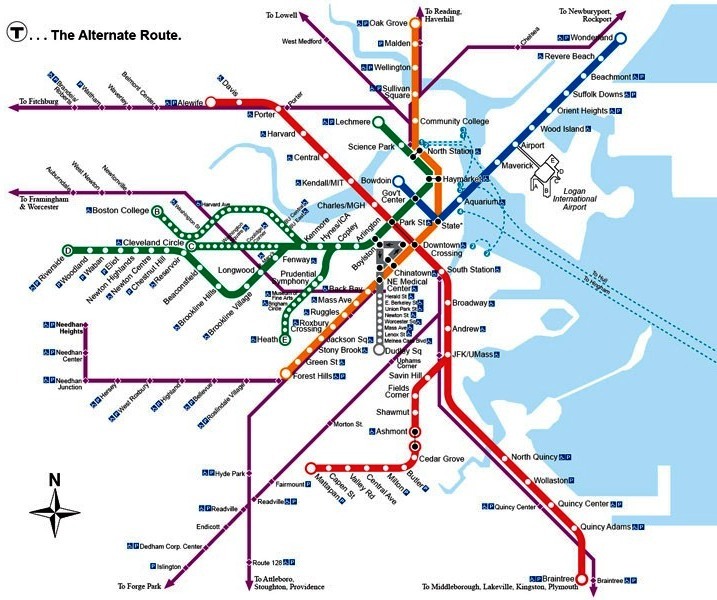 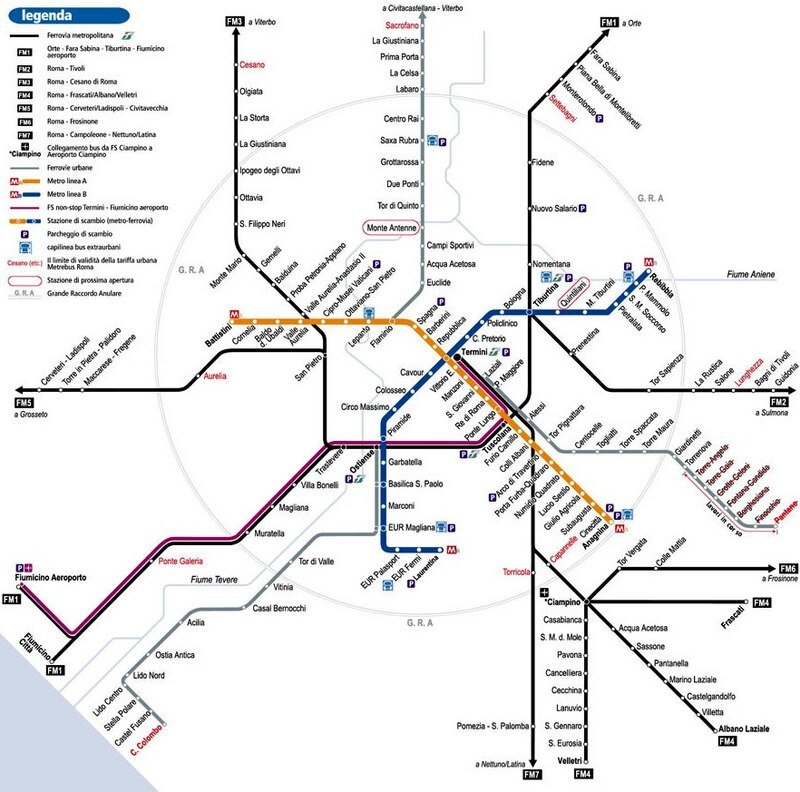 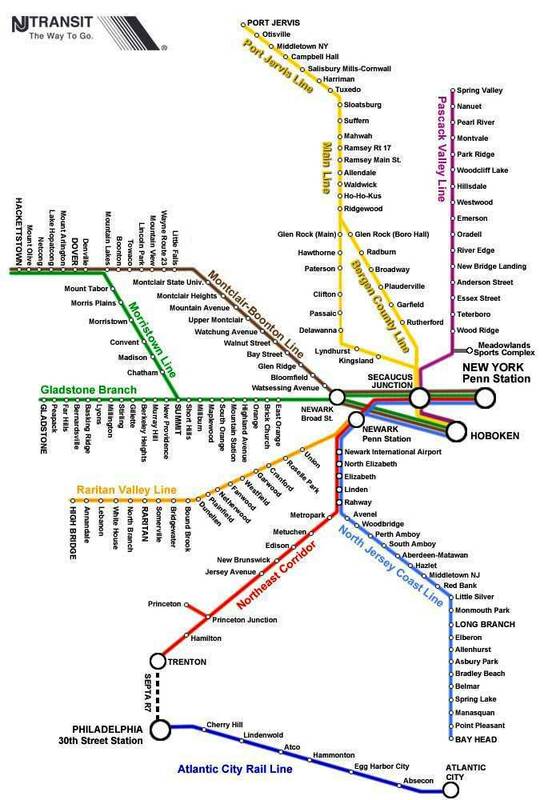 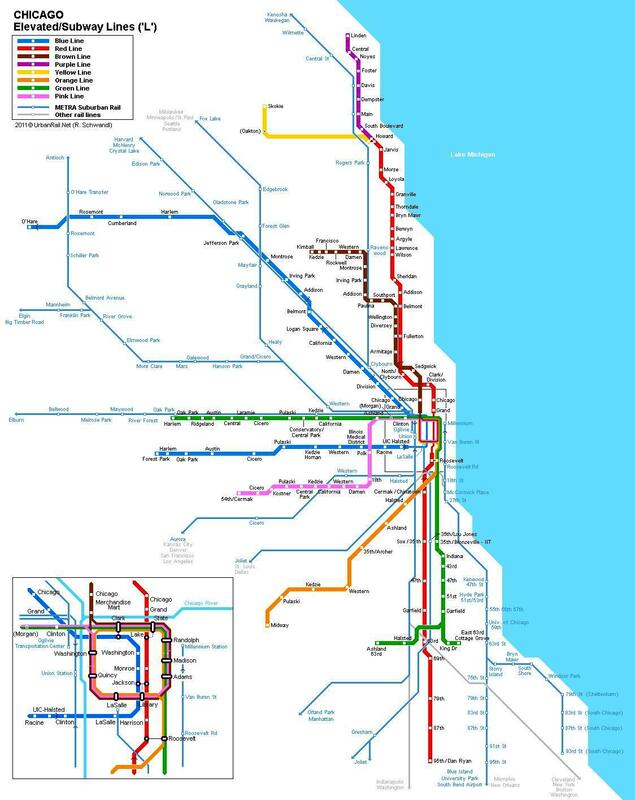 Nevertheless the map remains true to Beck’s original scheme, and many other transport systems use schematic maps to represent their services, undoubtedly inspired by Beck. 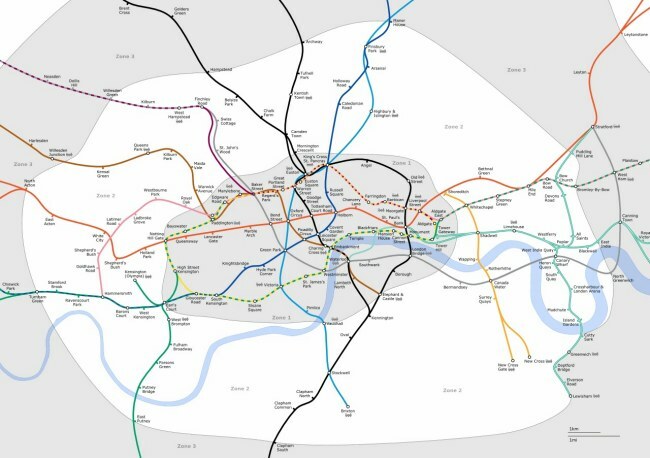 Despite there having been many versions over the years, somehow the perception of many users is that the current map actually is, more or less, the 1930 Beck version. 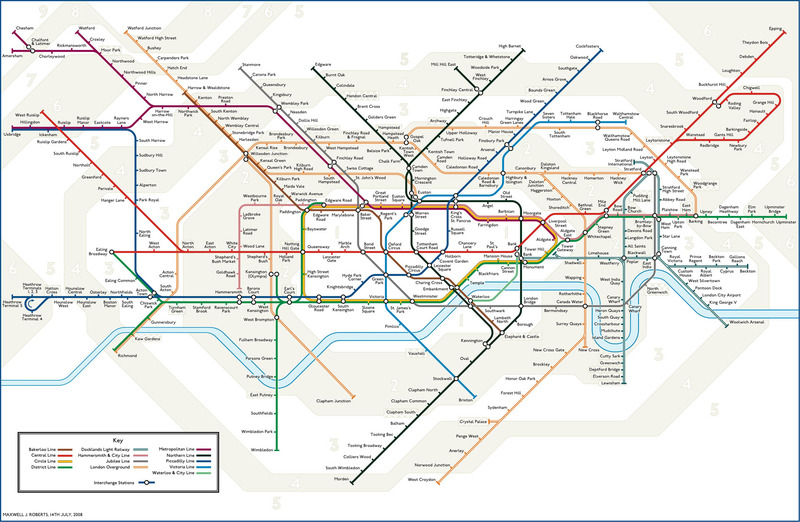 This is a remarkable testament to the effectiveness of the original design. 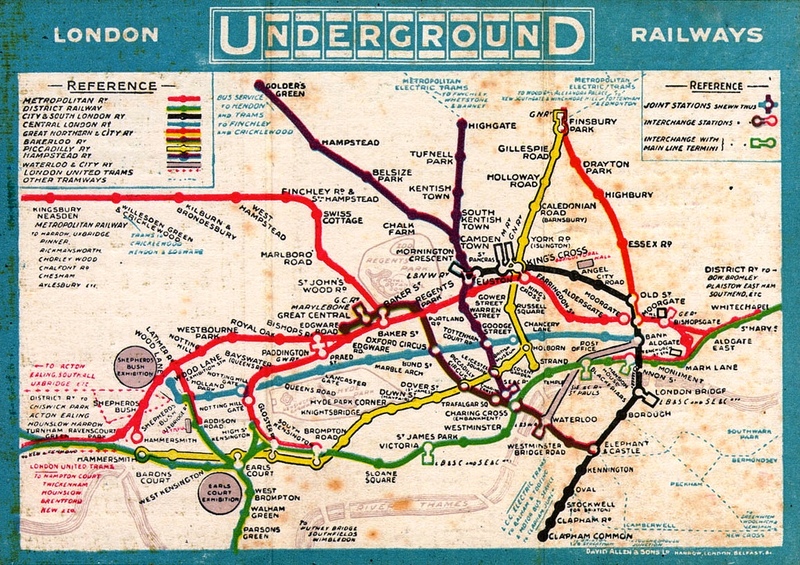 Beck did actually draw versions with other formats, 22½ degrees rather than 45 (the Paris Métro version uses 22½ degrees as a base); and an unused version for the 1948 London Olympics. 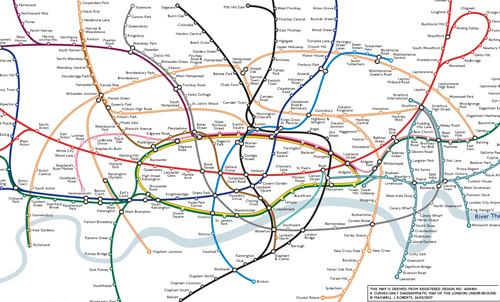 The London Underground (also known as the Tube or The Underground) is a rapid transit system serving a large part of Greater London and some parts of Buckinghamshire, Essex and Hertfordshire in England. 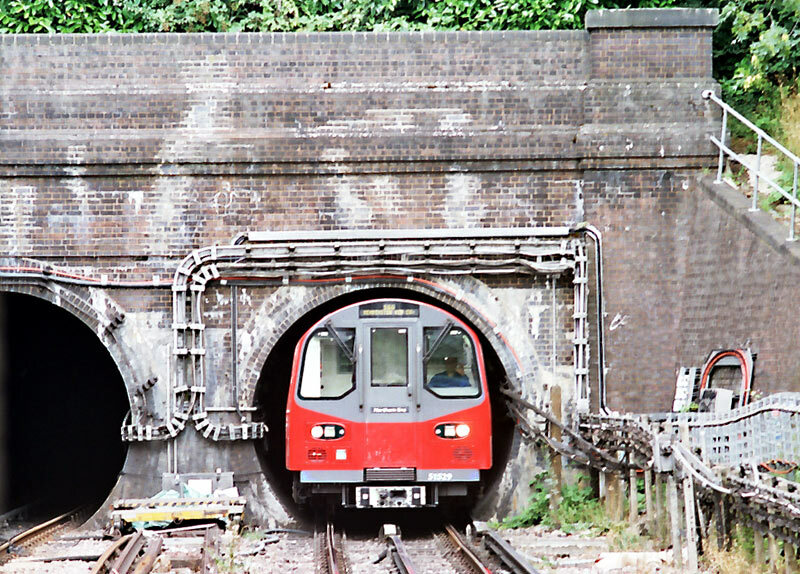 It is the oldest underground railway in the world, the first section of which opened in 1863 on what are now the Circle, Hammersmith & City and Metropolitan lines. 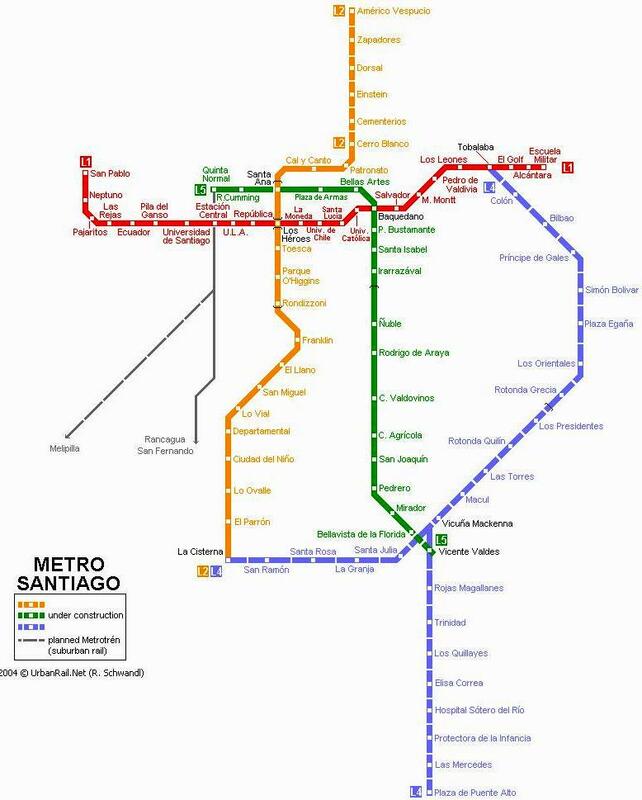 In 1890 it became the first to operate electric trains. 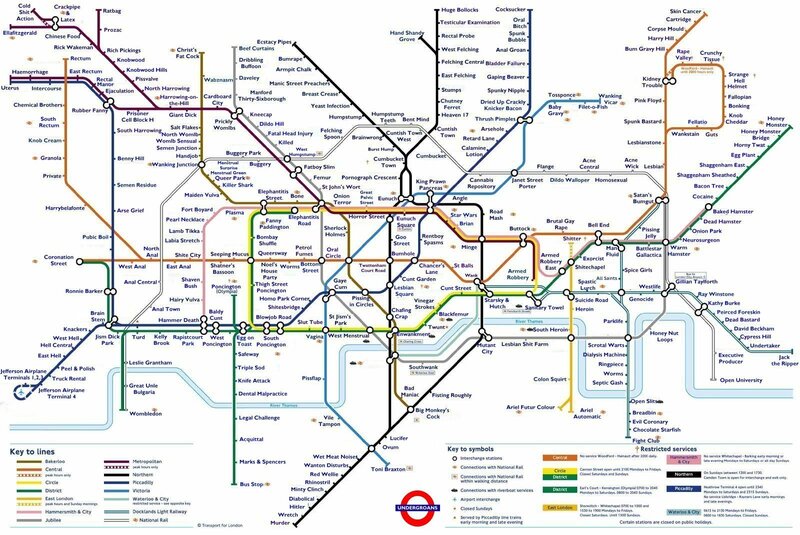 The London Underground serves 270 stations and has 402 kilometres of track, making it the second largest metro system in the world in terms of route miles after the Shanghai Metro. 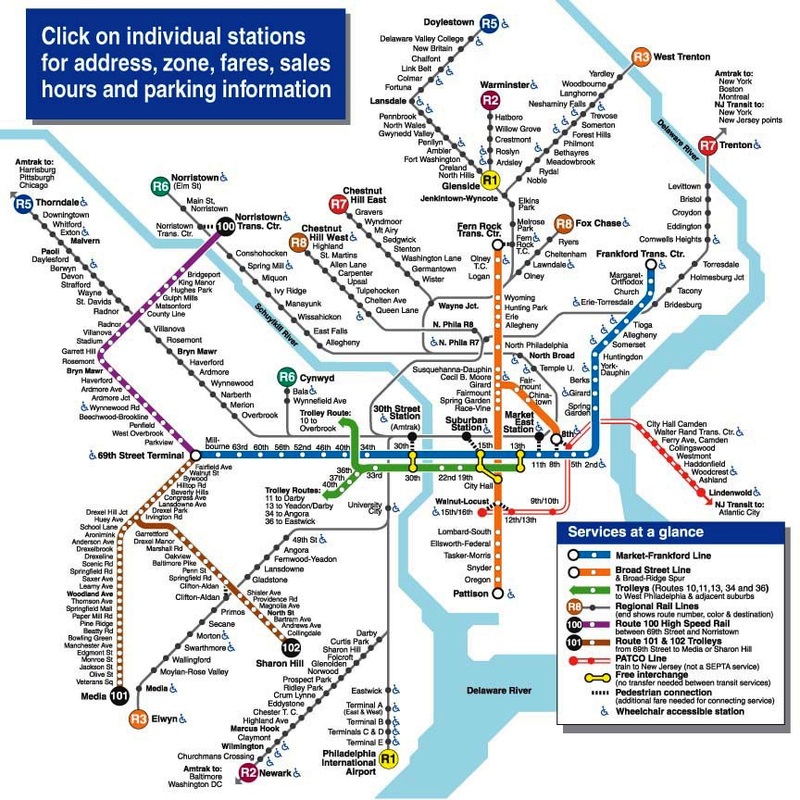 It also has one of the largest numbers of stations. 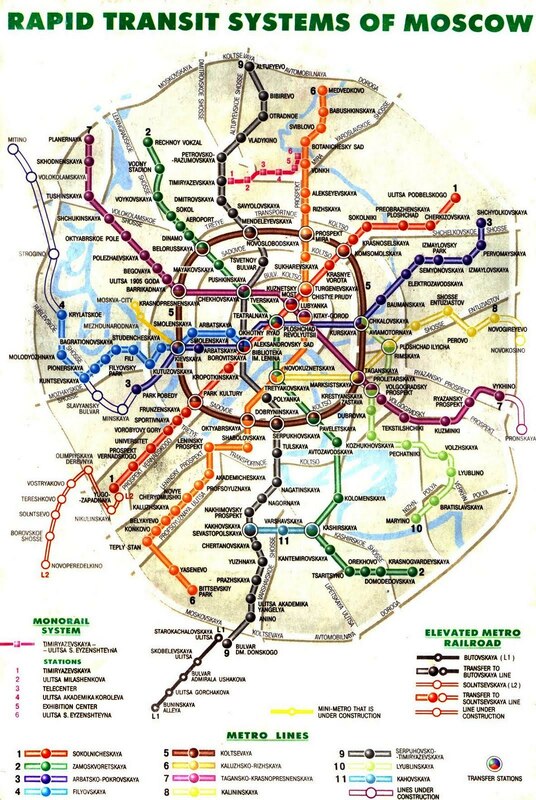 In 2007, more than one billion passenger journeys were recorded, making it the third busiest metro system in Europe after Moscow and Paris. 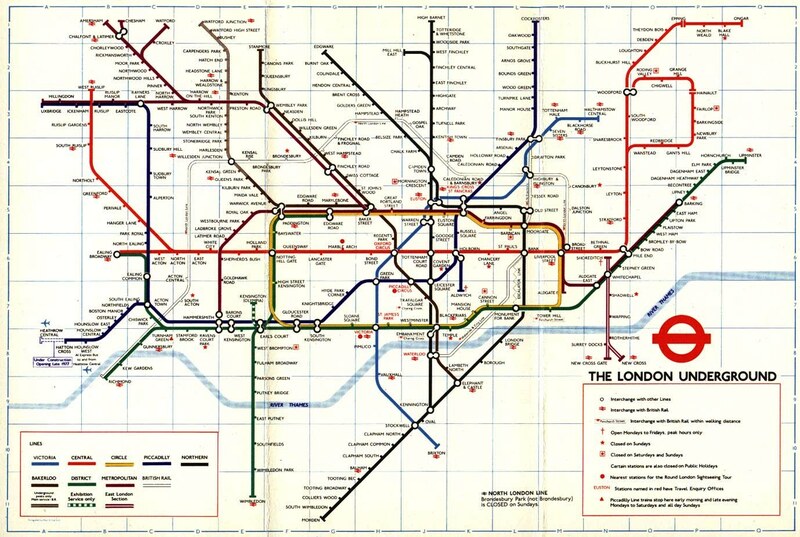 The Tube is an international icon for London, with the tube map, considered a design classic, having influenced many other transport maps worldwide. 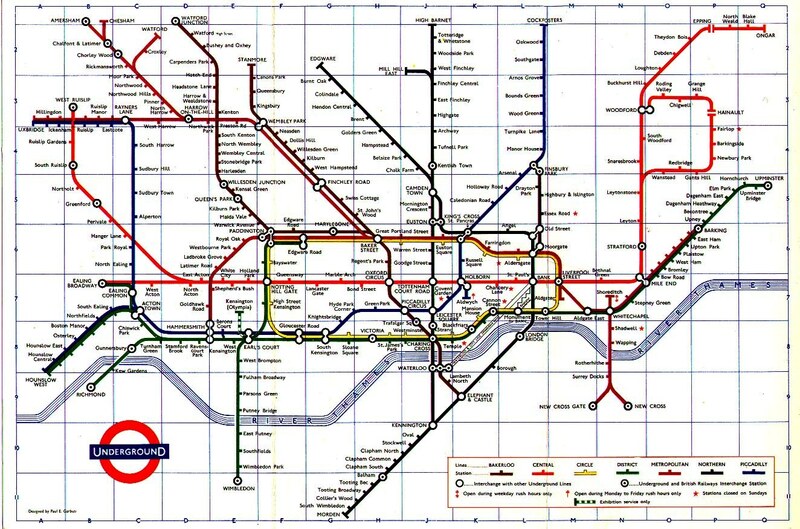 The whole network is commonly referred to by Londoners and in official publicity as the Tube, although that term originally applied only to the deep-level bored lines, along which run trains of a smaller and more circular cross-section, to distinguish them from the sub-surface “cut and cover” lines that were built first. 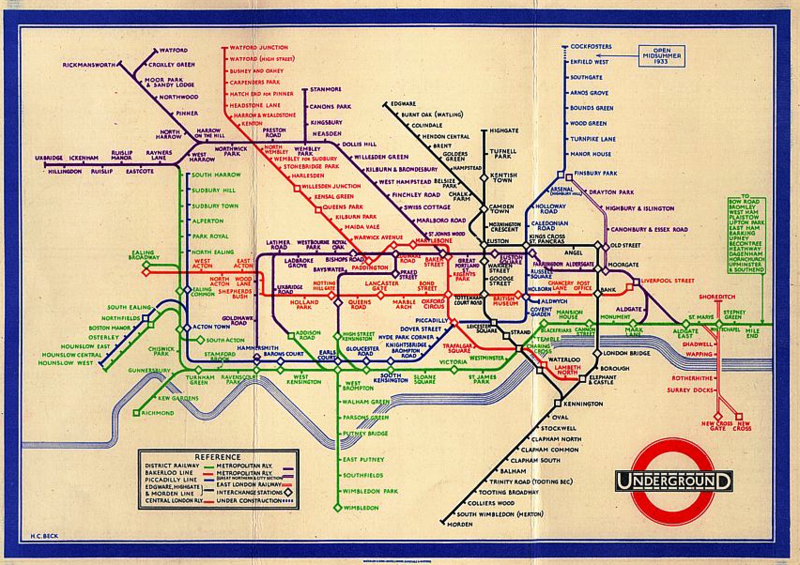 The earlier lines of the present London Underground network were built by various private companies. 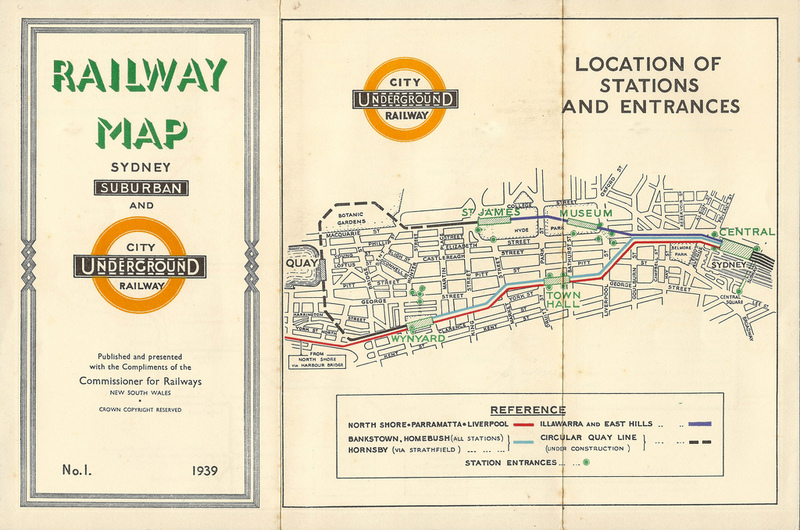 They became part of an integrated transport system in 1933 when the London Passenger Transport Board (LPTB) or London Transport was created. 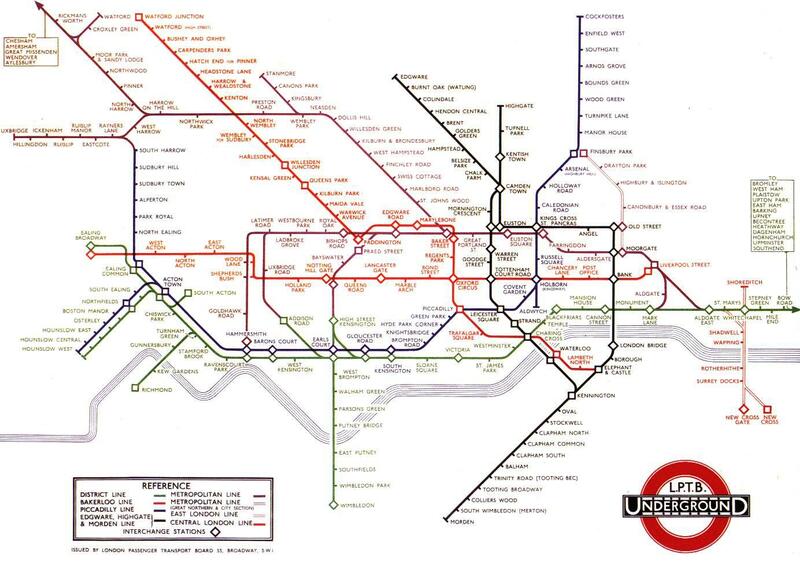 The underground network became a separate entity in 1985, when the UK Government created London Underground Limited (LUL). 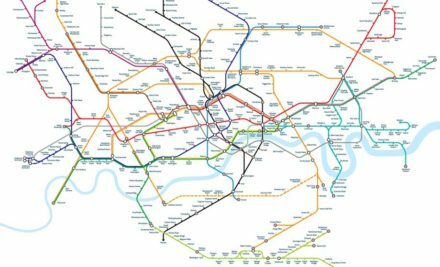 Since 2003 LUL has been a wholly owned subsidiary of Transport for London (TfL), the statutory corporation responsible for most aspects of the transport system in Greater London, which is run by a board and a commissioner appointed by the Mayor of London. 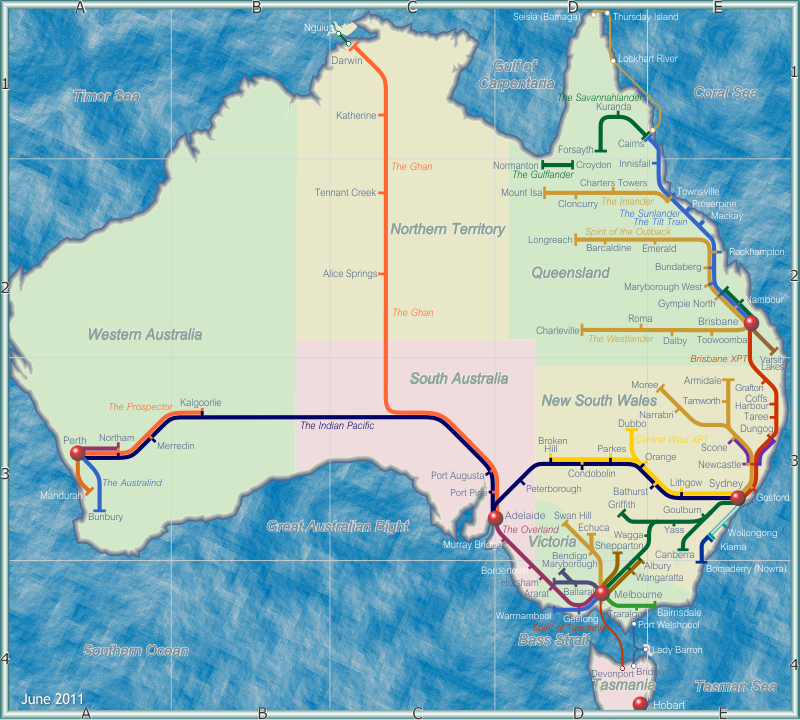 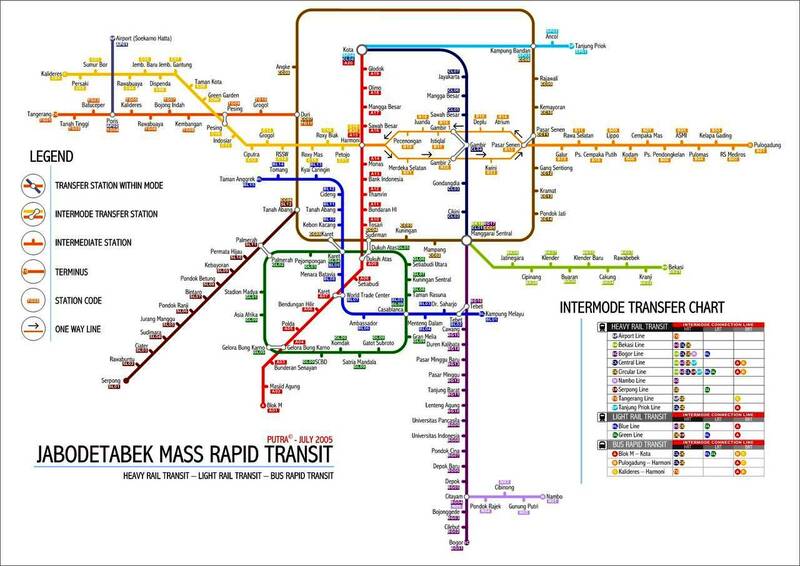 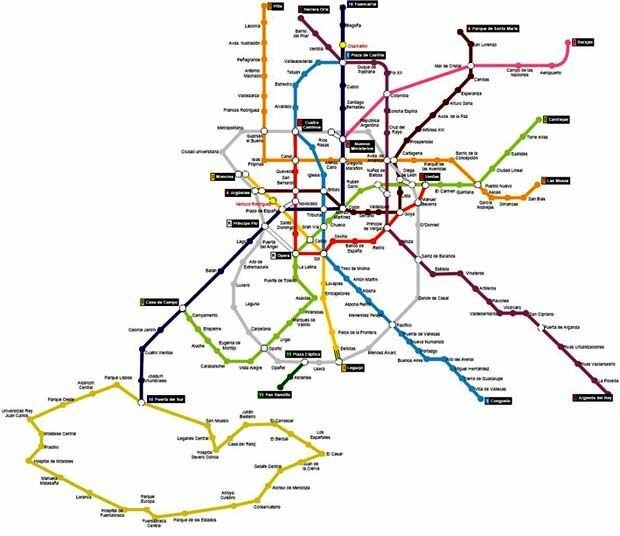 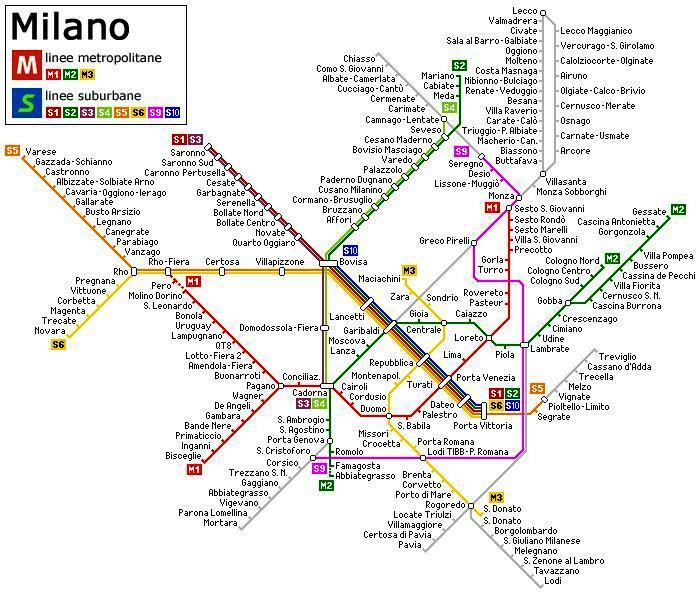 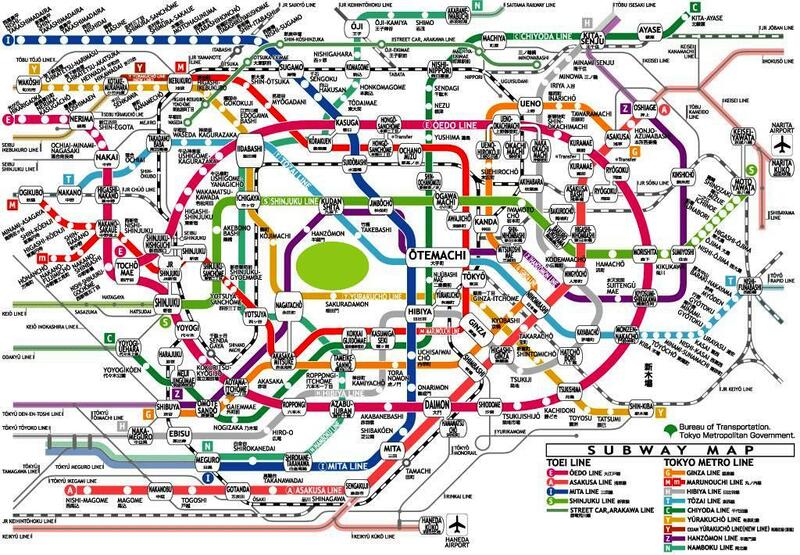 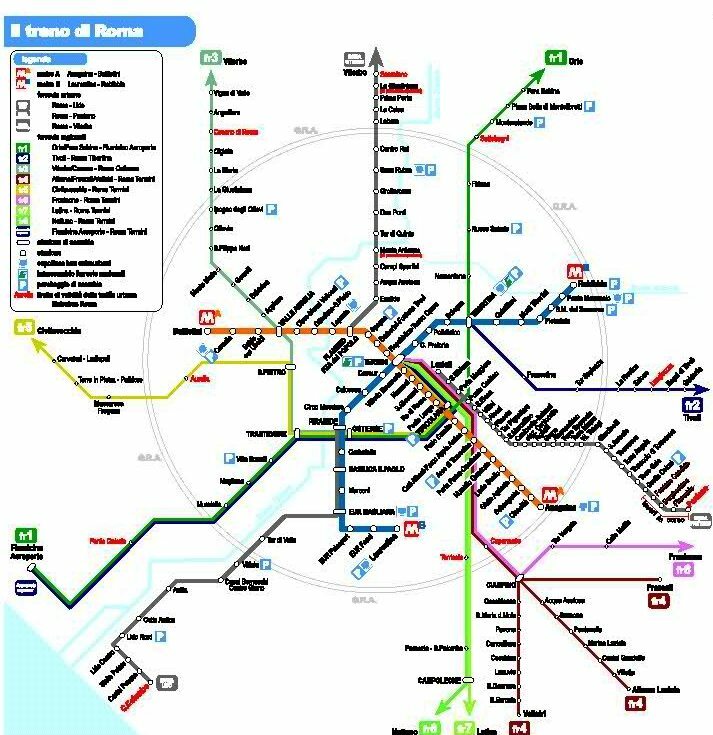 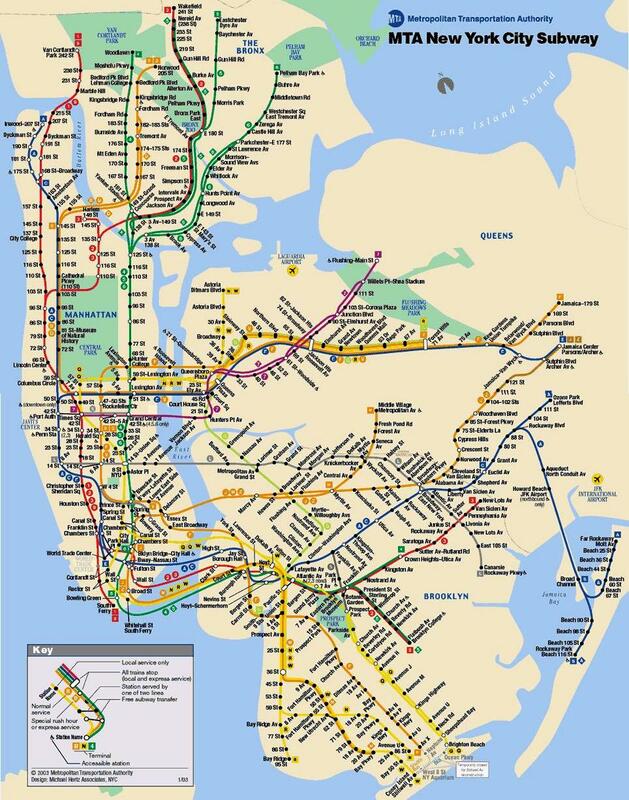 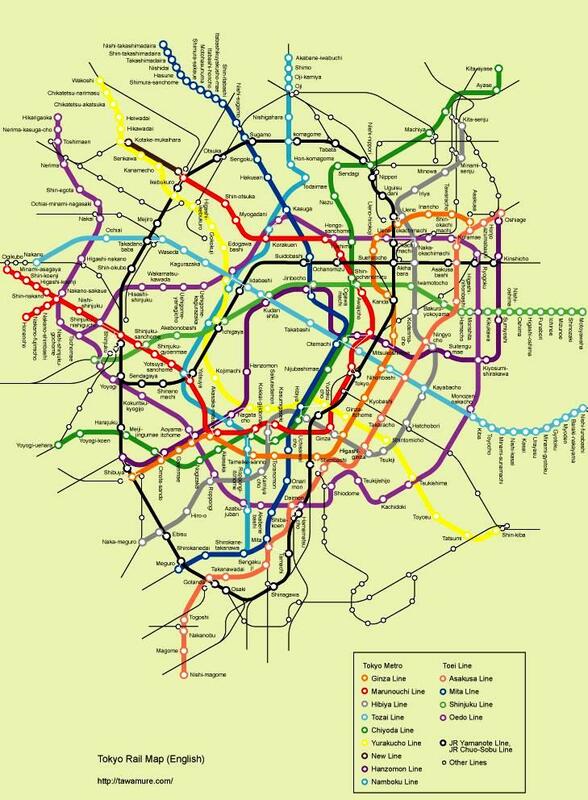 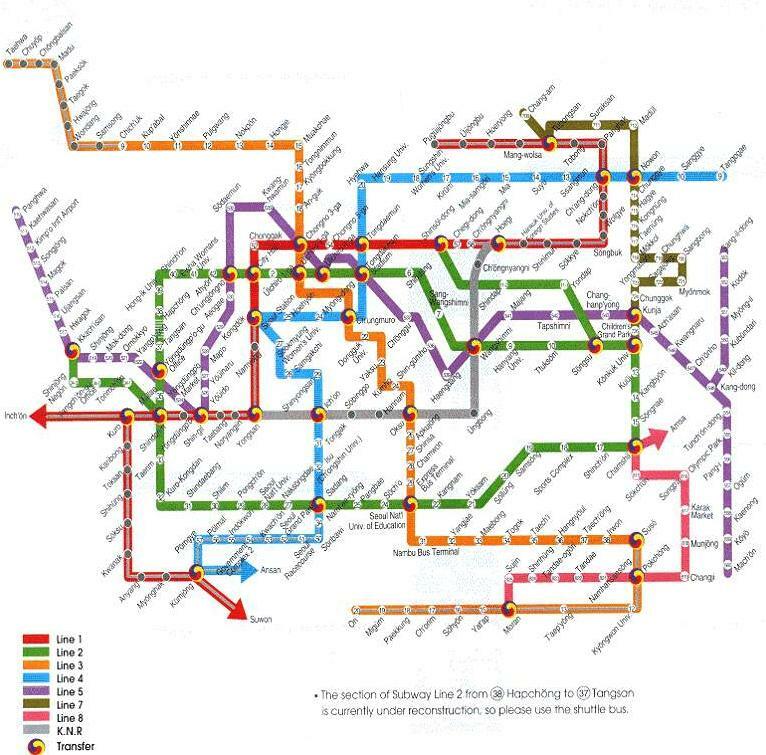 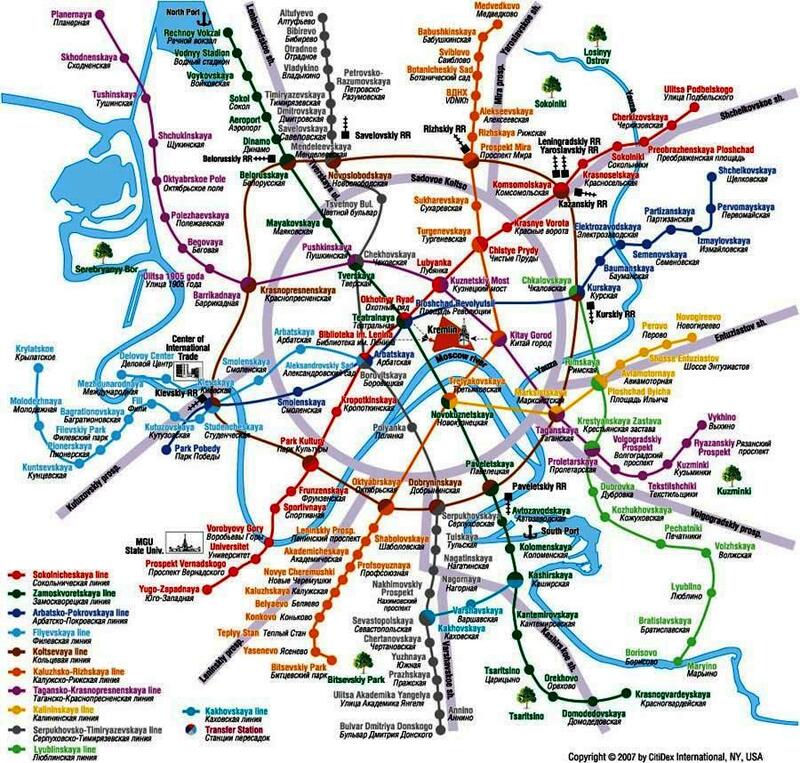 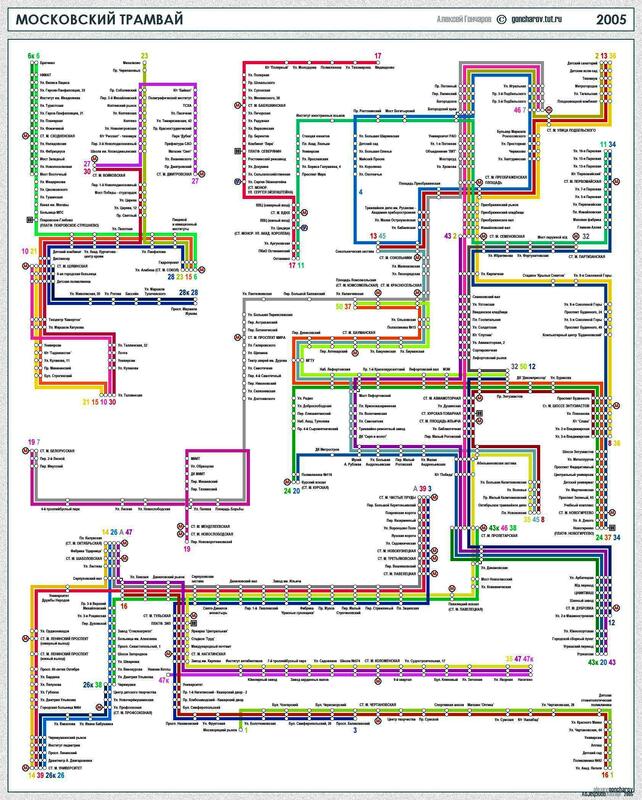 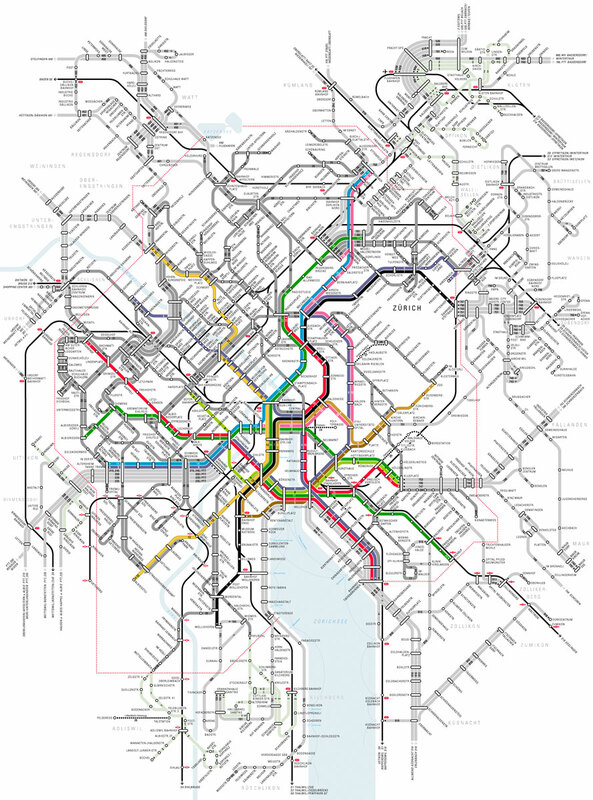 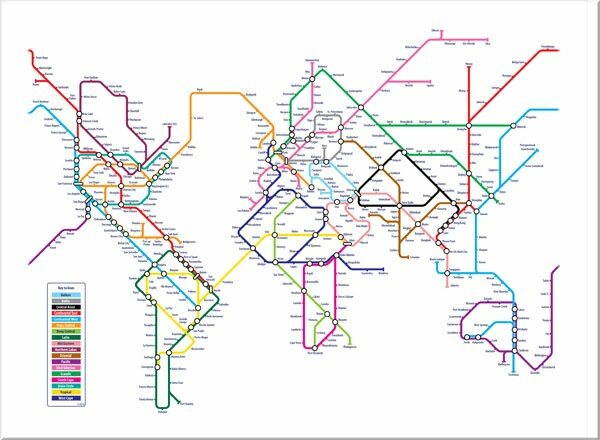 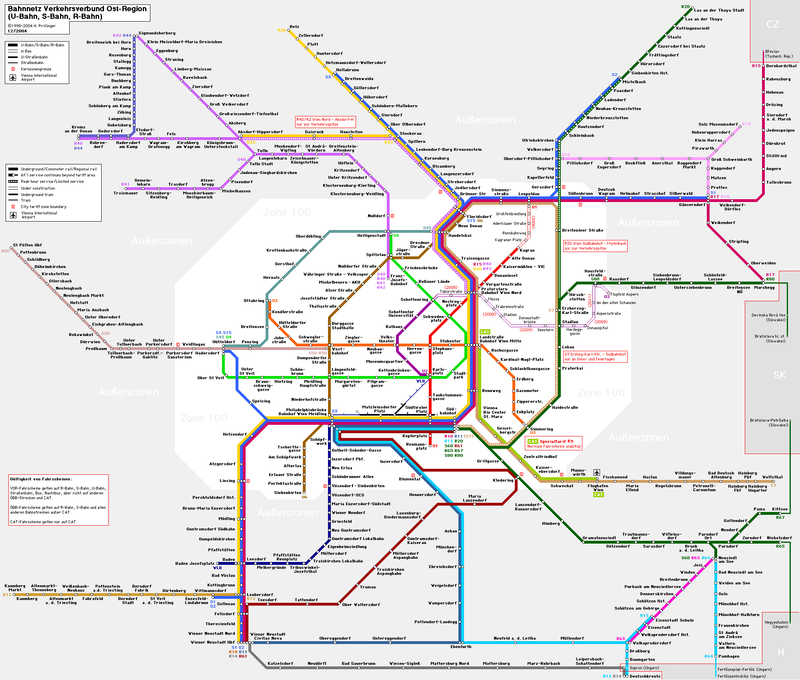 Urban transport systems all over the world, including New York, St Petersburg, and Sydney, have applied Beck’s theory to maps of their own systems, and similar diagrammatic maps are now used for overground railway networks and airline systems. 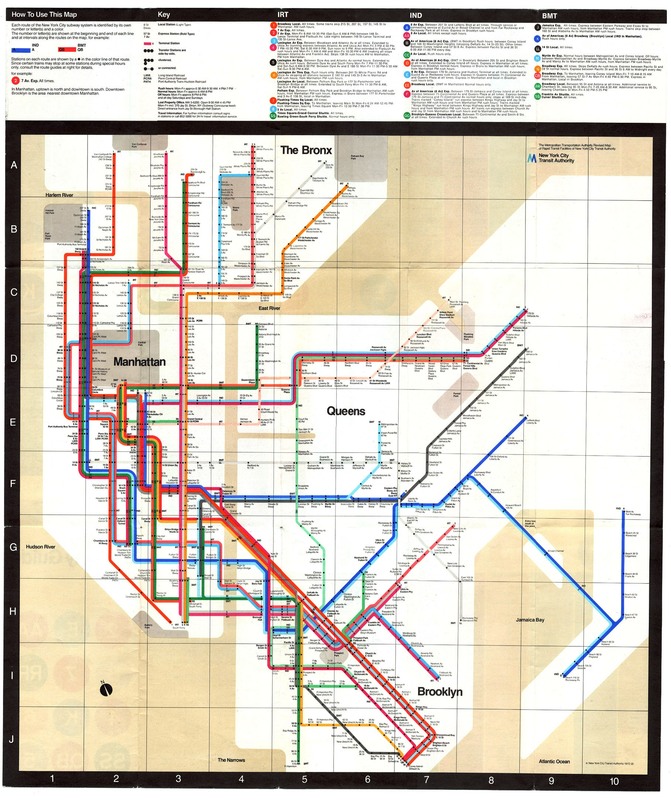 Below is a video of Massimo Vignelli talking about his 1972 map of the New York Underground system. 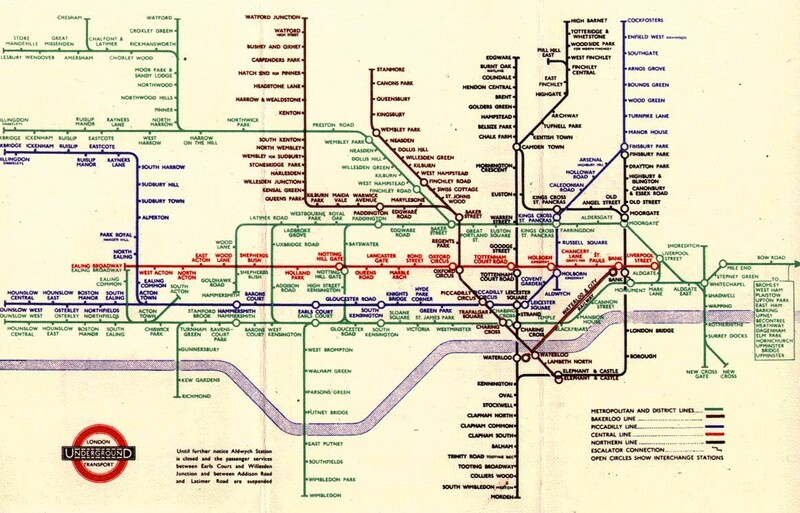 He explains how the information is arranged on the page, acknowledges his debt to the London tube map, suggests his map might have been even better without some of the geographic detail, and laments that his map has been replaced by something far less satisfying. 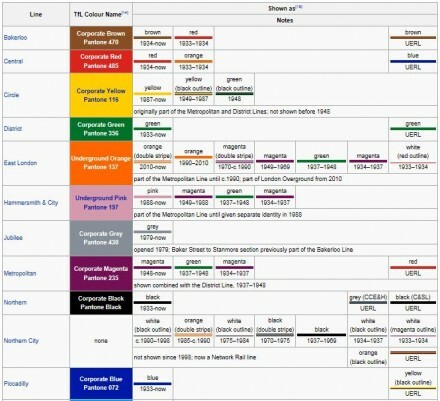 The table below shows the changing use of colours since the first Beck map. 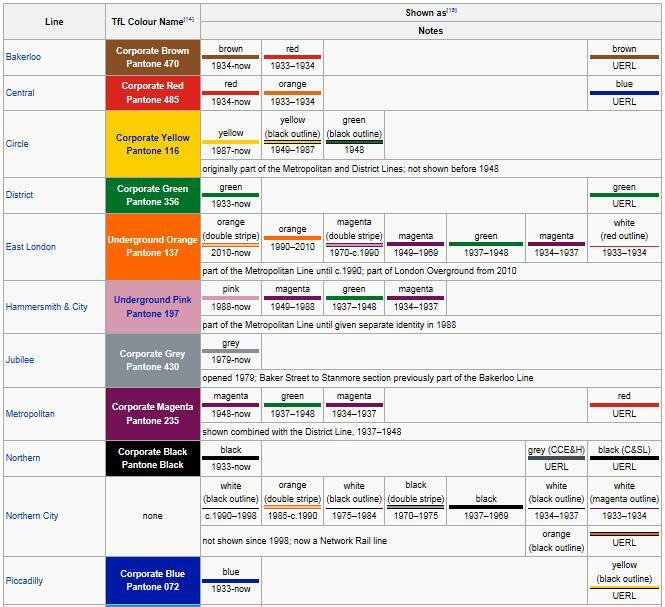 The current colours are taken from the TfL Colour Standards guide, which defines the precise colours from the Pantone palette, and also a colour naming scheme that is particular to TfL. 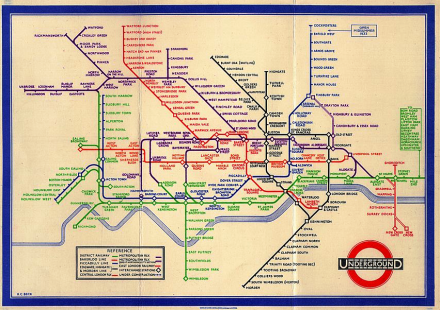 Earlier maps were limited by the number of colours available that could be clearly distinguished in print. 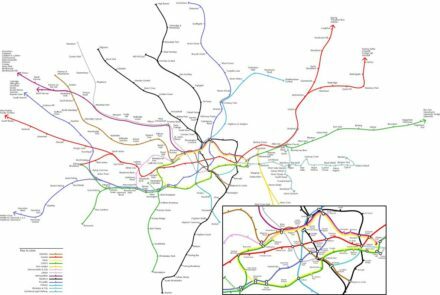 Improvements in colour printing technology have reduced this problem and the map has coped with the identification of new lines without great difficulty. By 1913 Edward Johnston ( aged 35 ) was a man already making a name for himself in the world of type. 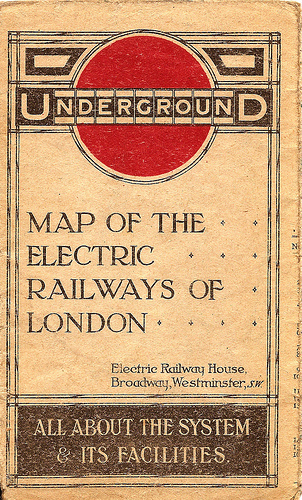 Johnston had discovered his talent for (and love of ) typography in his mid-twenties. 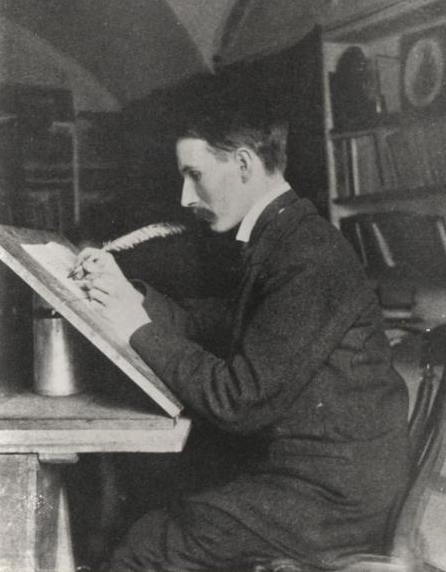 By 1906, however, he had already been recognised as a man who had almost single-handedly revived and rediscovered the art of calligraphical type and lettering, and was the much-loved teacher of many of print’s future greats – including Thomas Cobden-Sanderson and Eric Gill. 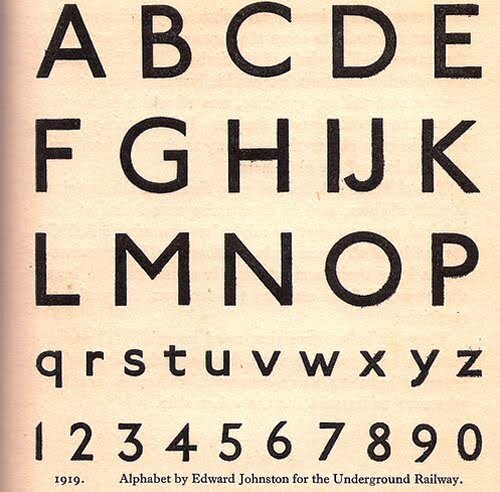 Johnston’s book, Writing and Illuminating, and Lettering still is one of the “must read” texts for anyone in the typographical world. 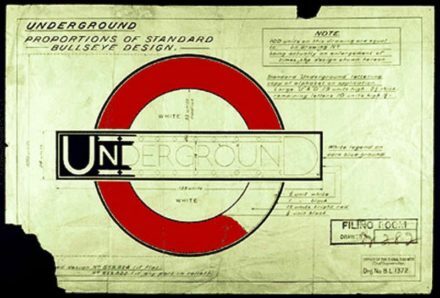 The typeface should have “the bold simplicity of the authentic lettering of the finest periods” Frank Pick ( Head of London Underground 1920-1930’s ) wrote to Johnston. 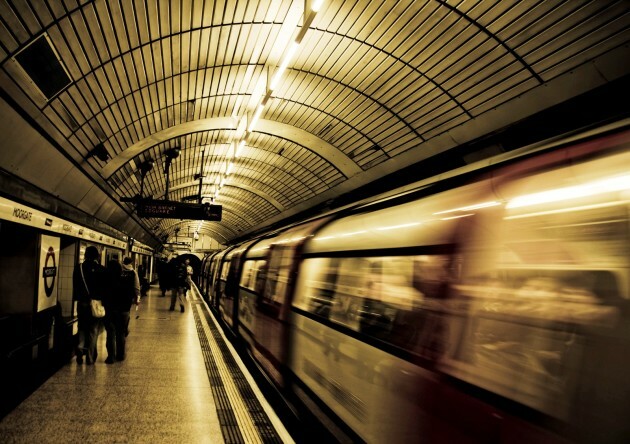 It should also, he told him, be easy to read from a moving train and in bad lighting, be noticeably up-to-date with the times, and yet also be completely different from anything found on other shops and signage. 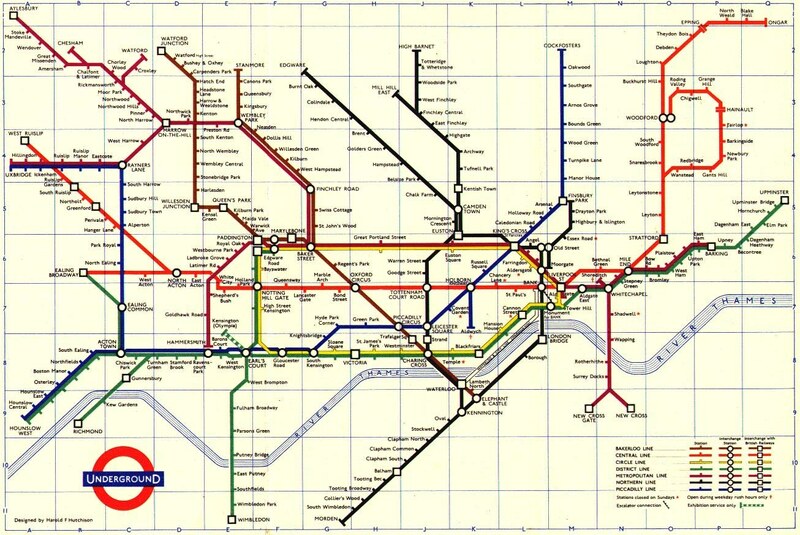 It was a brief that many a designer – even today – would have blanched at. 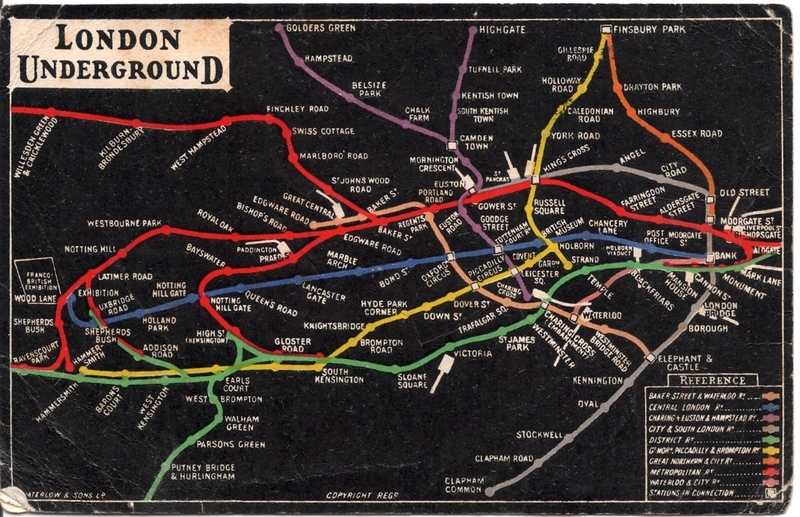 It took three years (in fact all likelihood it probably didn’t – Johnston was notorious for leaving commissions until the very last minute), but in 1915 Johnston delivered to Pick a character-set that met every single one of those demands. 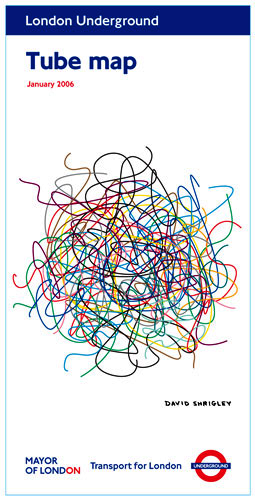 Pick was, quite simply, delighted. 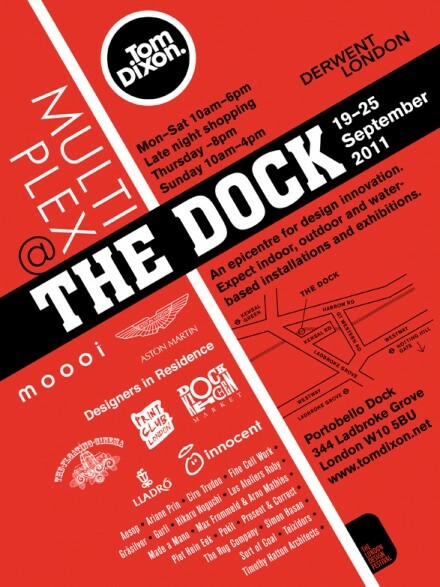 Little documentation remains covering the design process undertaken by Johnston whilst working on Pick’s new typeface. 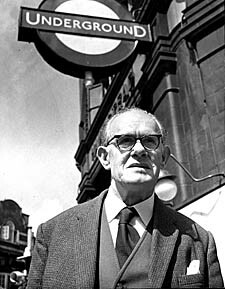 What is obvious, however, is that Johnston – a man, remember, who had form for reviving lost arts and styles – decided that he’d do exactly the same thing again. 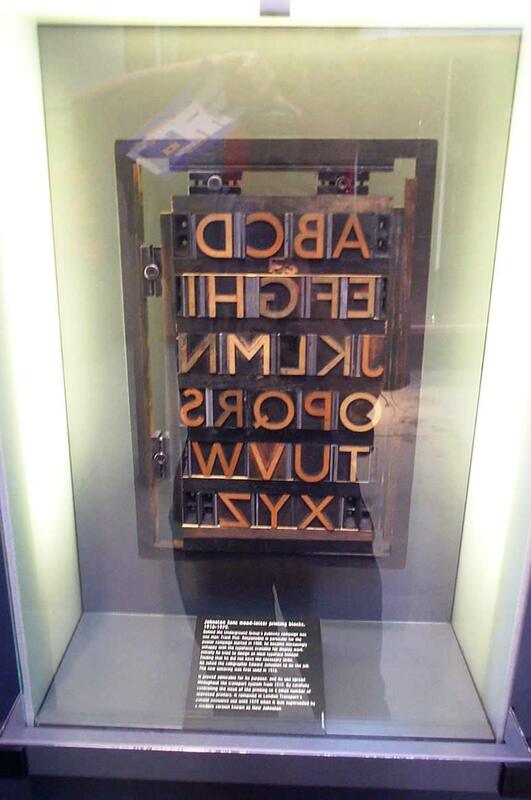 Arial On the left, Times New Roman on the right. 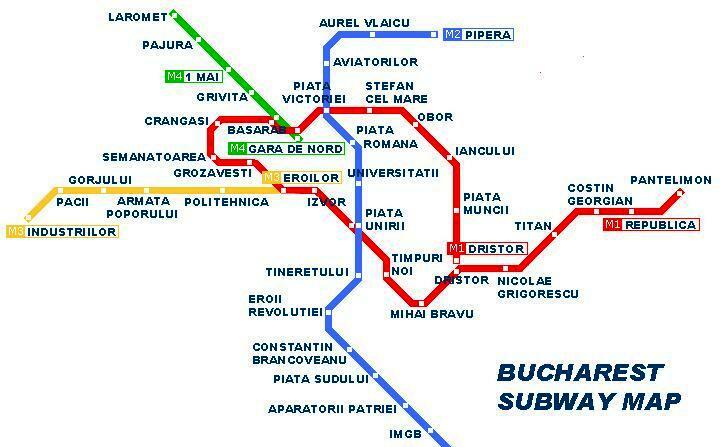 Sans-Serif typefaces, therefore, are those “flourishless” families like Verdana, Arial, Helvetica and (one for Windows Vista users) Calibri. 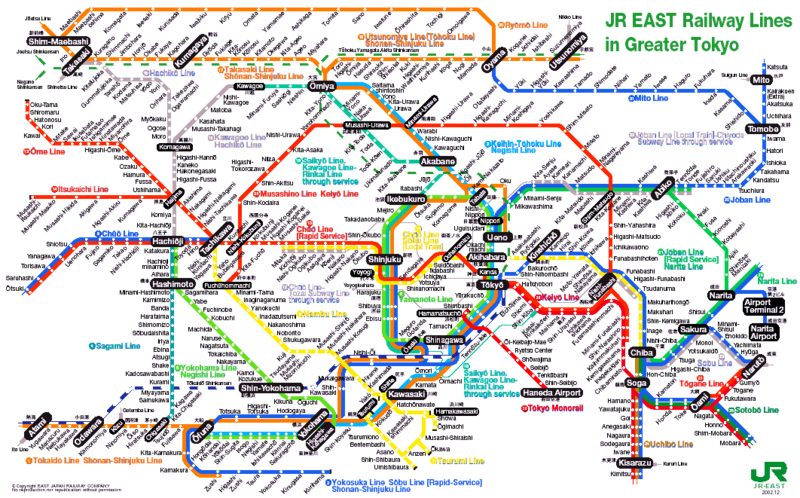 Faces that bless documents everywhere and virtually the entire internet. 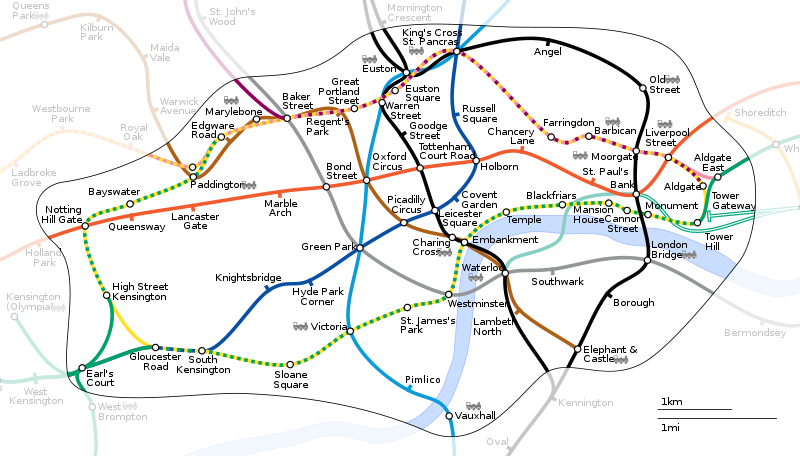 Sans-Serif faces are, in many ways, the living embodiment of text in the 20th Century and Johnston, with the typeface that he delivered to Pick, almost singlehandedly revived them as a valid and useful style. Johnston would later admit to two influences on the design of his typeface – walking home one evening with Eric Gill in the early 1900s, he found himself focusing on the various tradesmen’s wagons that featured simply drawn signage in sans-serif style. 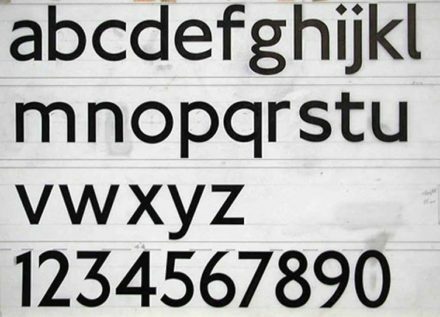 Having settled on producing a sans-serif face, Johnston’s other big influence was the lettering on Trajan’s Column. 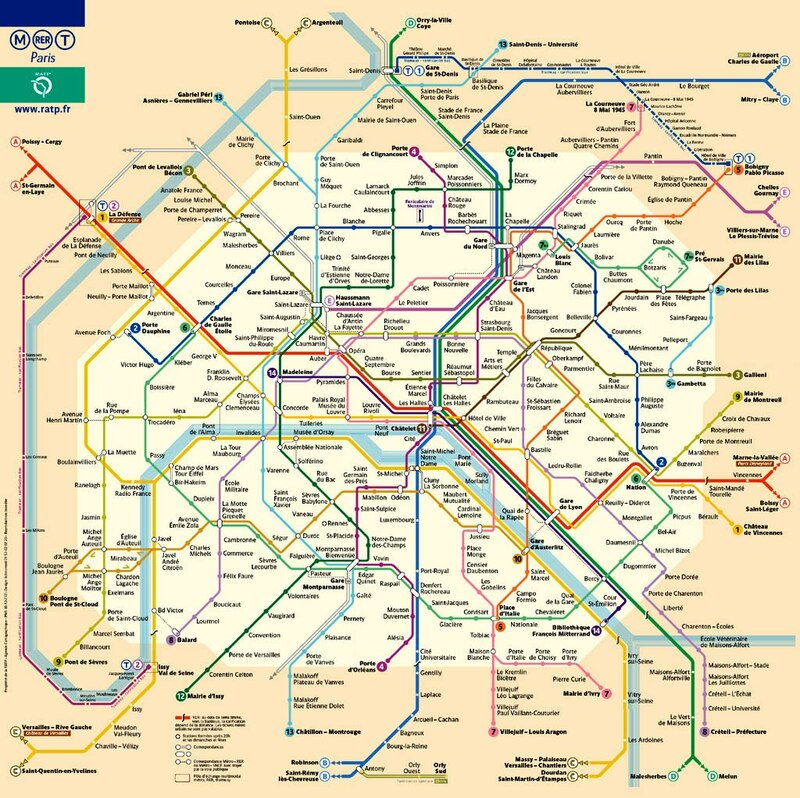 From there he took the principle of classical dimensions and extended it all the strokes on his new typeface would be the same width, and the circles (on the “o” and “p” for example) should be exactly that – perfect circles. 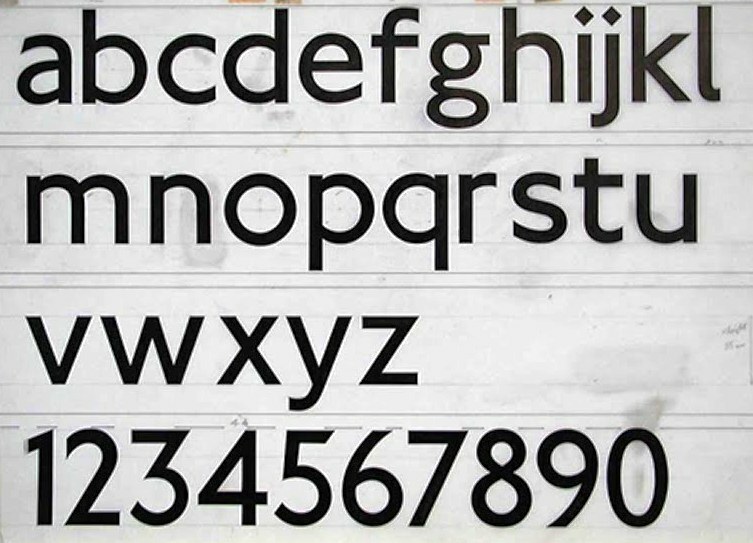 The resulting typeface that Johnston delivered to Pick ( uppercase in 1915, lowercase a year later ), is the fruit of those influences, but also has its own unique touches. 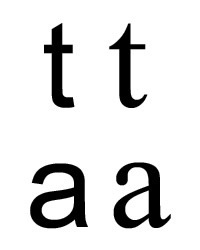 It is noted for the curl at the bottom of the minuscule (lower case) l, which other sans-serif typefaces have discarded, and for the diamond-shaped tittle on the lower case i and j, whose shape also appears in the full stop, and is the origin of other punctuation marks in the face. 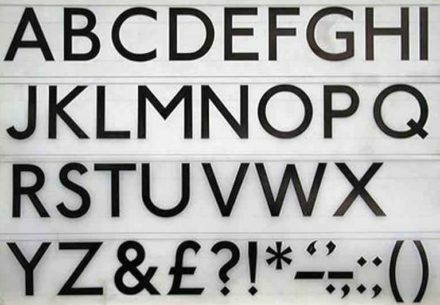 Other little touches like the hooked base to the lower-case “l” give the face personality, whilst also helping to meet Pick’s goal that each letter be subtly distinguishable at speed. 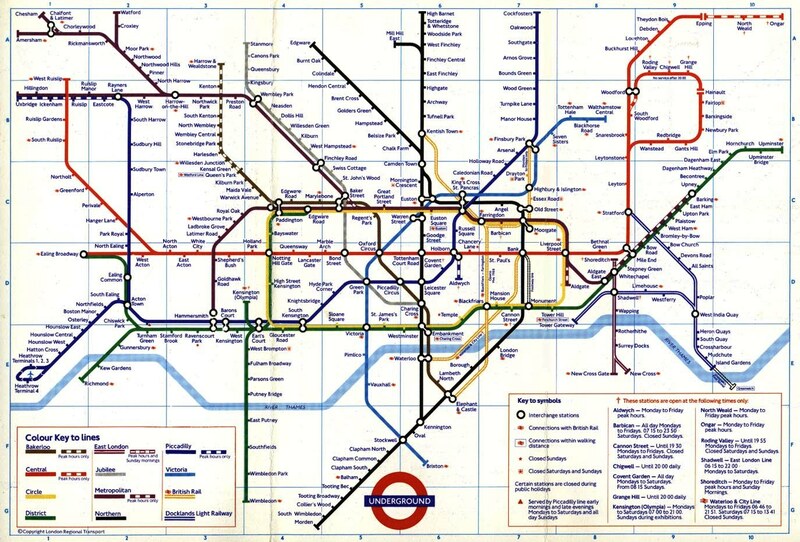 Overall, Johnston delivered a magnificent typeface, and Pick quickly set about ensuring that it manifested across the entire network, furthering its fame and helping kick off a worldwide sans-serif revolution. 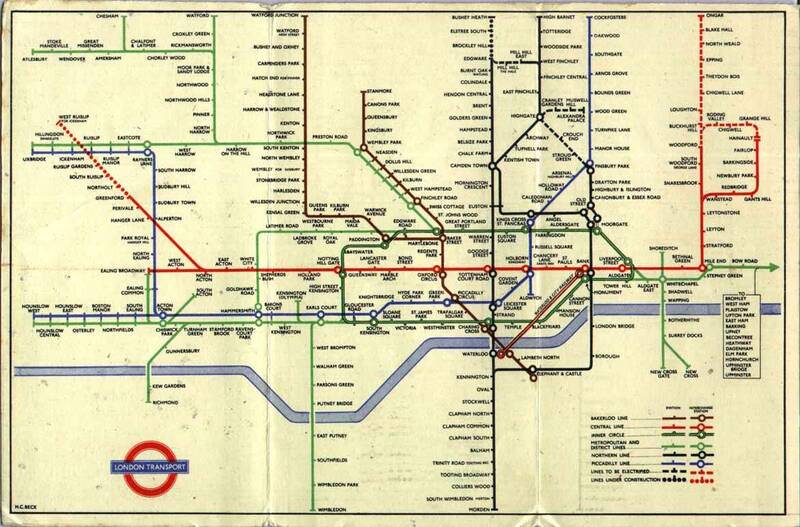 As if accomplishing the above was not enough, Johnston then finished it all off by creating the Roundel. 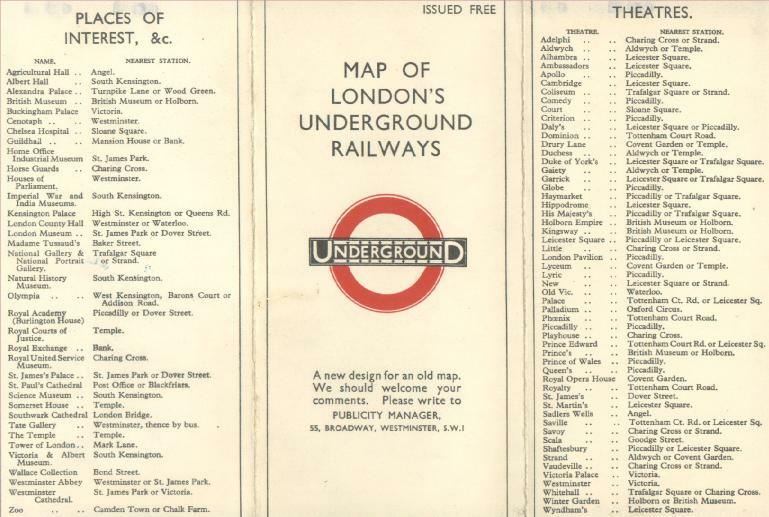 TfL owns the copyright to and exercises control over the New Johnston typeface, but a close approximation of the face exists in the TrueType computer font Paddington and the Gill Sans typeface also takes inspiration from Johnston. 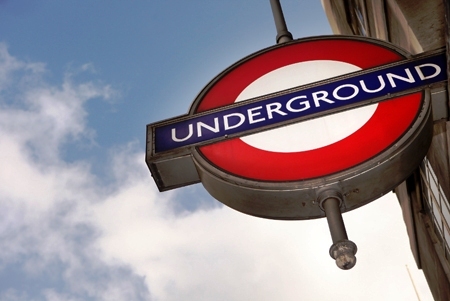 The origins of the roundel, in earlier years known as the ‘bulls-eye’ or ‘target’, are obscure. 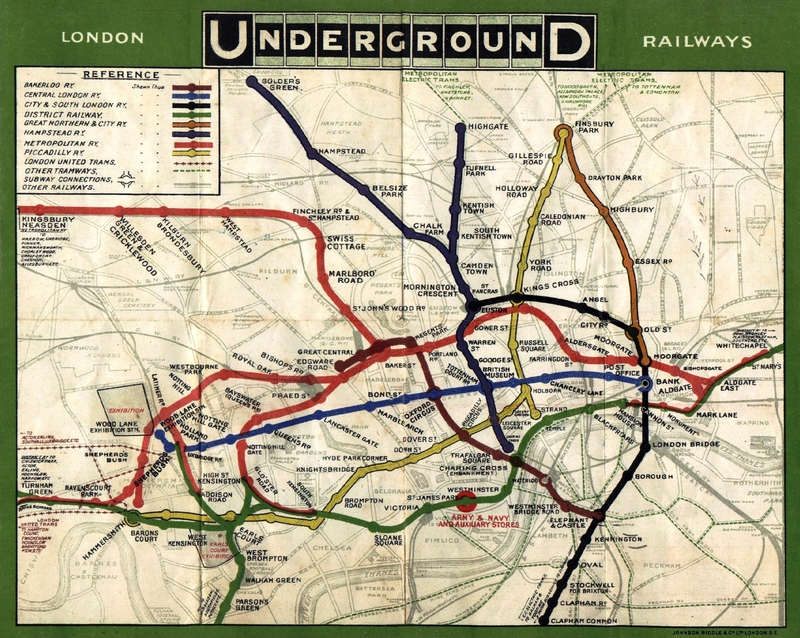 While the first use of a roundel in a London transport context was the 19th-century symbol of the London General Omnibus Company – a wheel with a bar across the centre bearing the word GENERAL – its use on the Underground stems from the decision in 1908 to find a more obvious way of highlighting station names on platforms. 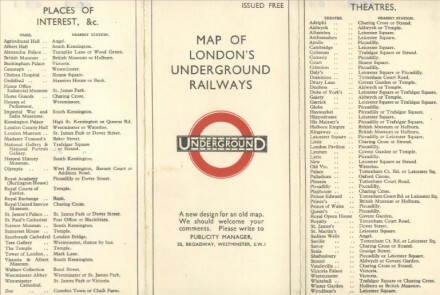 The red circle with blue name bar was quickly adopted, with the word “UNDERGROUND” across the bar, as an early corporate identity. 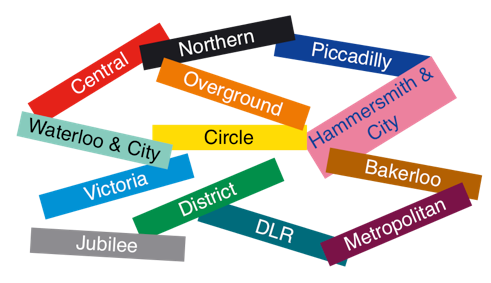 Each station displays the Underground roundel, often containing the station’s name in the central bar, at entrances and repeatedly along the platform, so that the name can easily be seen by passengers on arriving trains. 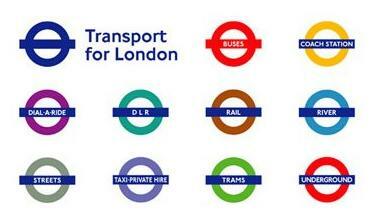 The roundel has been used for buses and the tube for many years and, since TfL took control, it has been applied to other transport types (taxi, tram, DLR etc.) 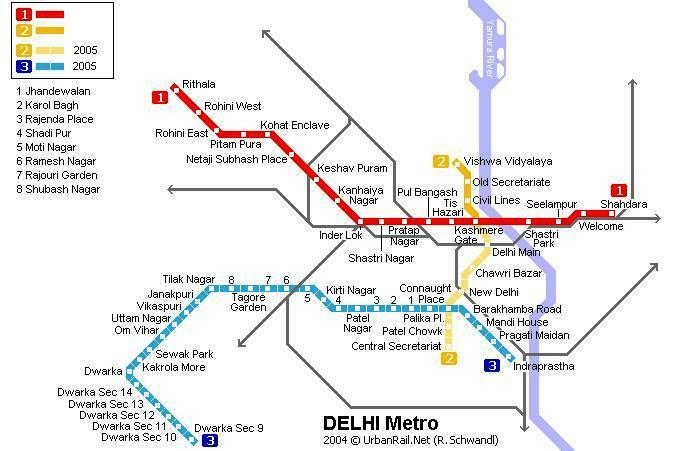 in different colour pairs. 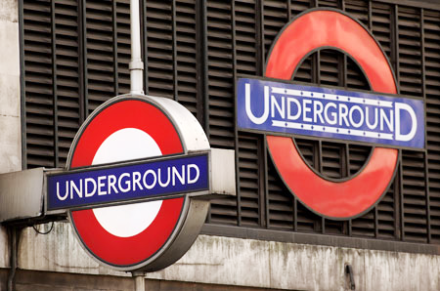 The roundel has, to some extent, become a symbol for London itself. 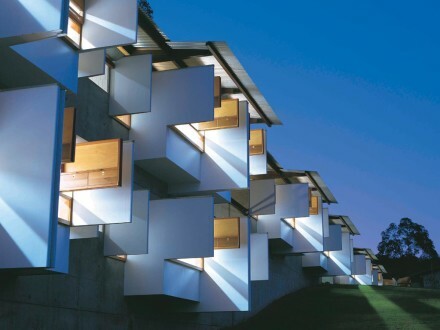 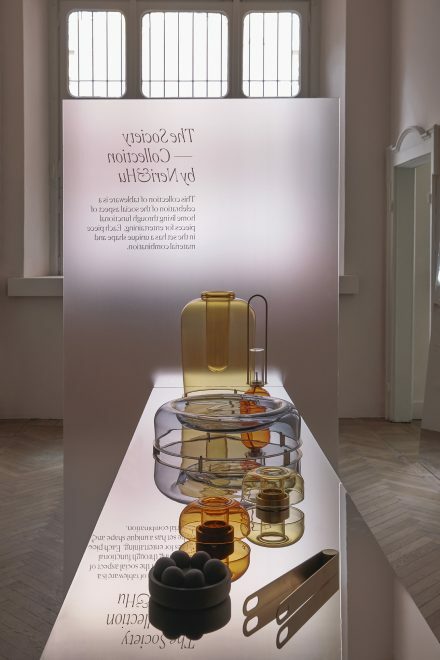 It’s much less about me (and my design), and much more about excellence in a product. 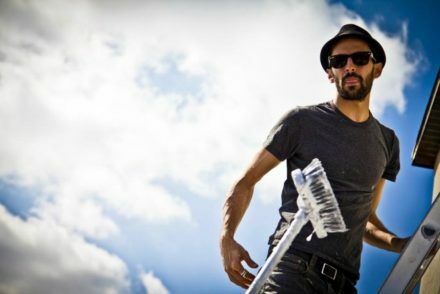 Less ego, better results.